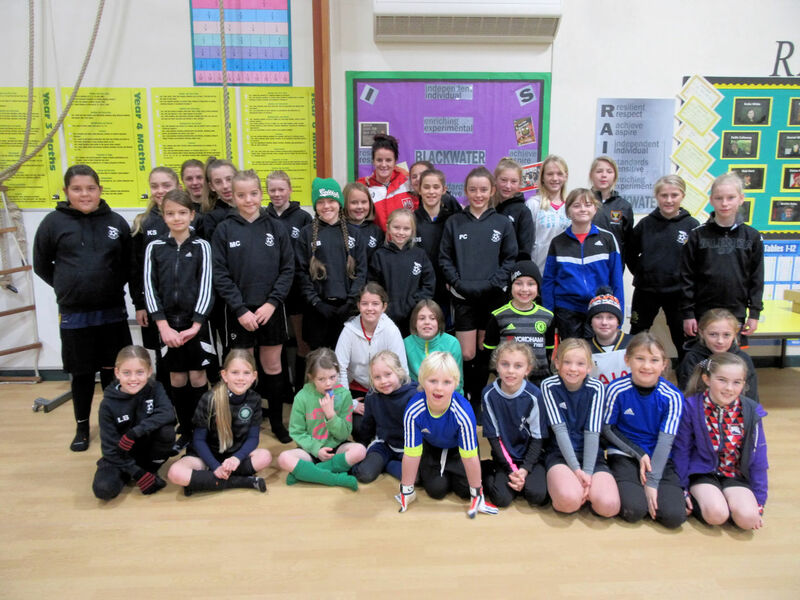 St Agnes AFC Dynamo Girls had a very exciting morning on Saturday with the visit of Bristol City Ladies player Jasmine Matthews to training at Blackwater School. The morning started with a meet and greet and Jasmine telling the girls how she had played football at Goonhavern and Truro before gaining her place at Bristol City. She explained how home sick she had felt when she first went away. 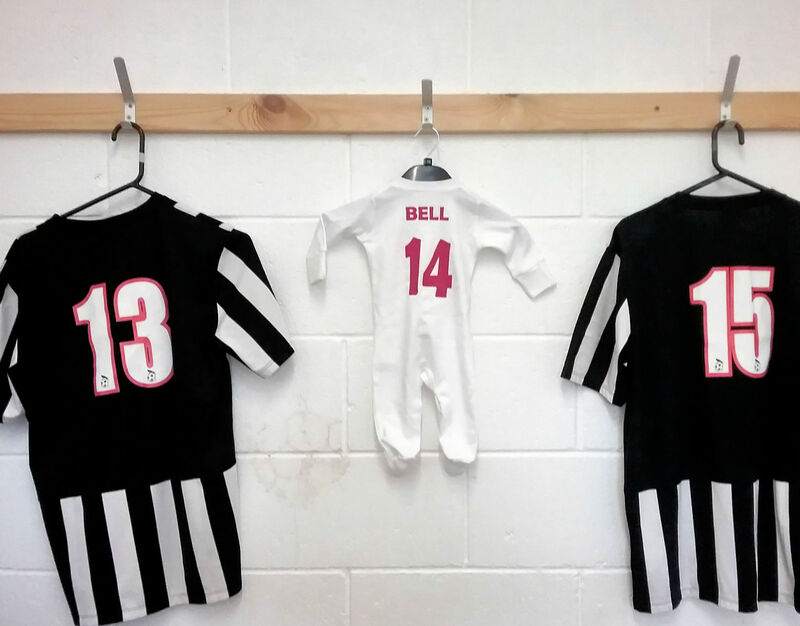 Her parents, who had popped along to support the morning, expressed their pride of her and confirmed that all the running around and standing in the rain they had experienced during her younger playing years had proved more than worth it. 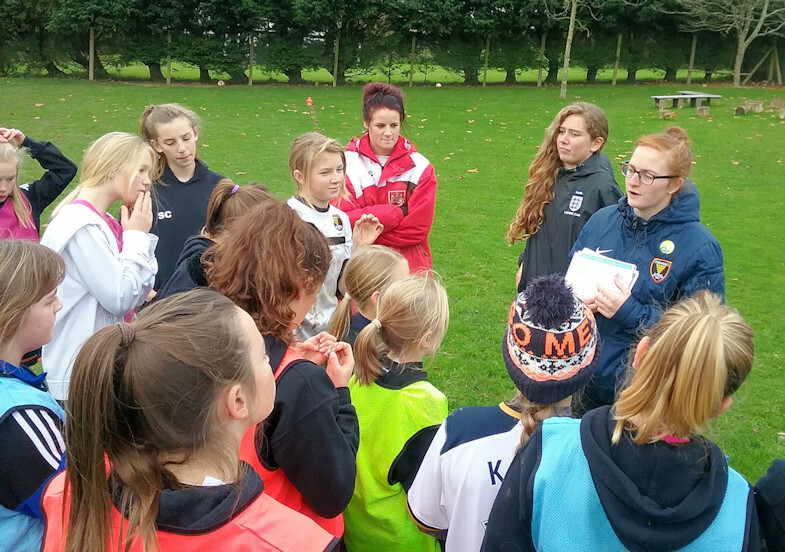 Jasmine inspired the girls with her stories of her footballing career, which included playing for England Under 23's. 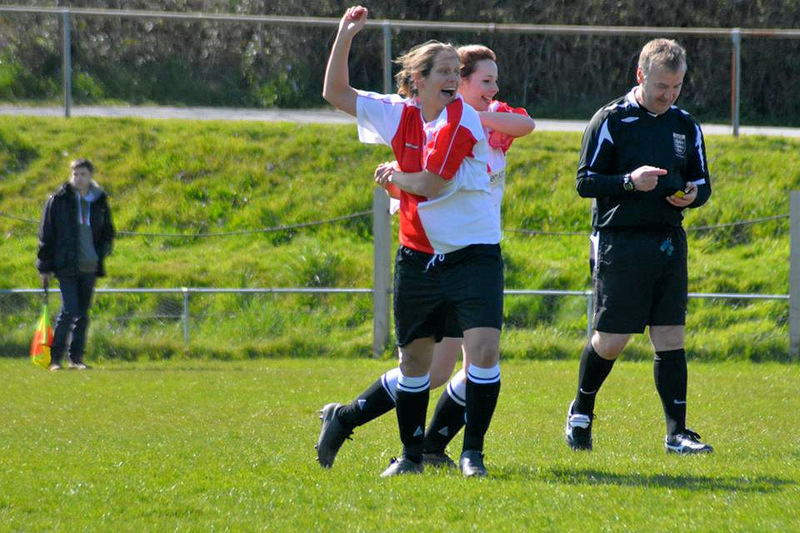 Bristol City presently play in Division 2 of the WSL and have gained promotion to Division 1 for next season. 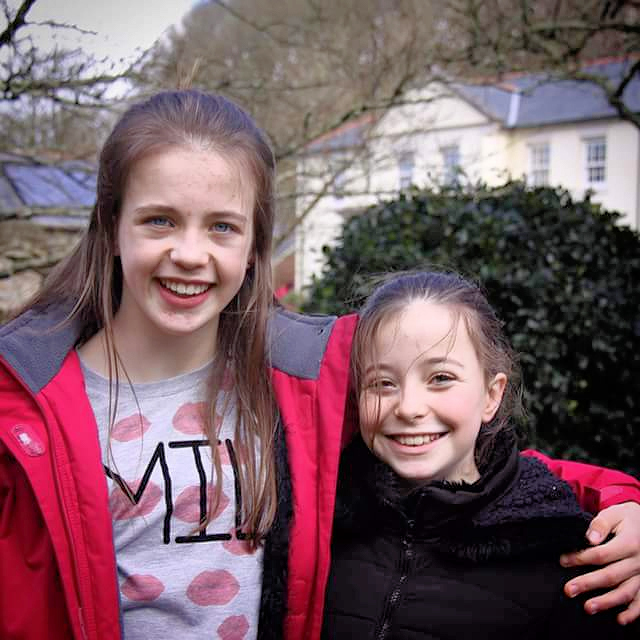 During a question and answer session Jasmine was asked what coach had inspired her and she replied "Warren Parker was my coach at Goonhavern and Truro and told me I should aim high and pushed me to be the best i could be”. 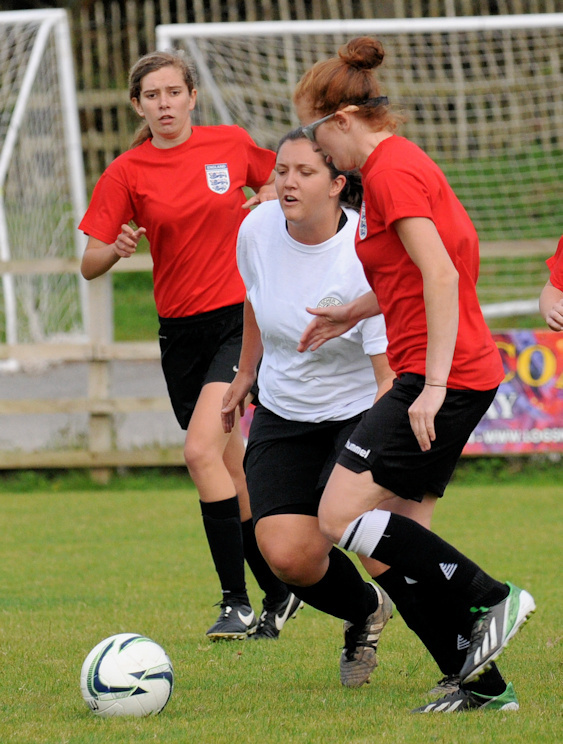 Jasmine explained that her aim was to one day play for the England Women's Team. Asked what her best advice was to the Dynamo Girls and their football futures Jasmine said "Be the best you can, never give up even when things go wrong or you make a mistake. Be positive and follow your dreams”. Jasmine was then presented with local St Agnes biscuits and jams by Mollie and Savannah while Abbie said "Thank you for coming today its been brilliant”. 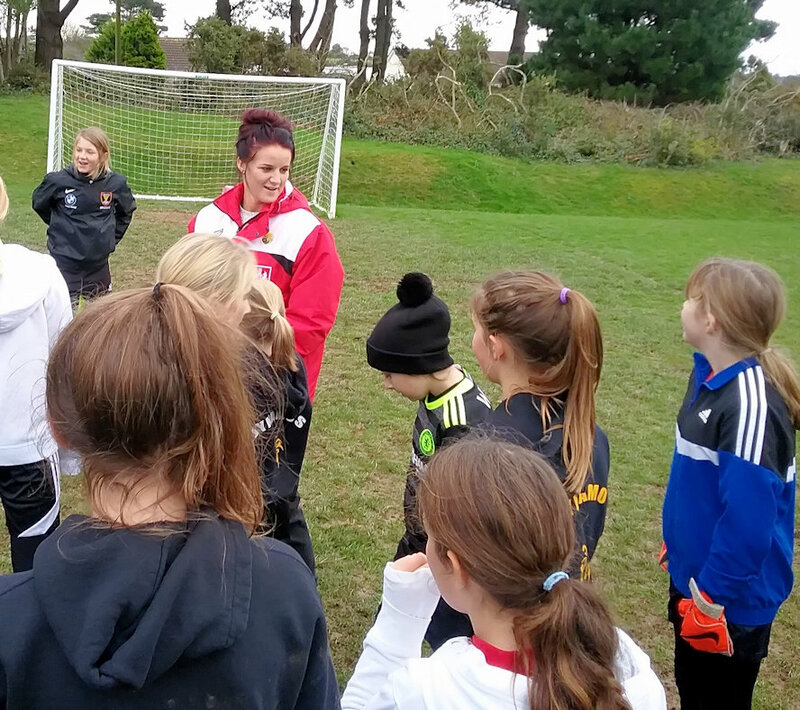 Jasmine then lead a coaching session for the girls and supported the St Agnes coaches in what proved to be a thoroughly enjoyable inspiring morning for all. 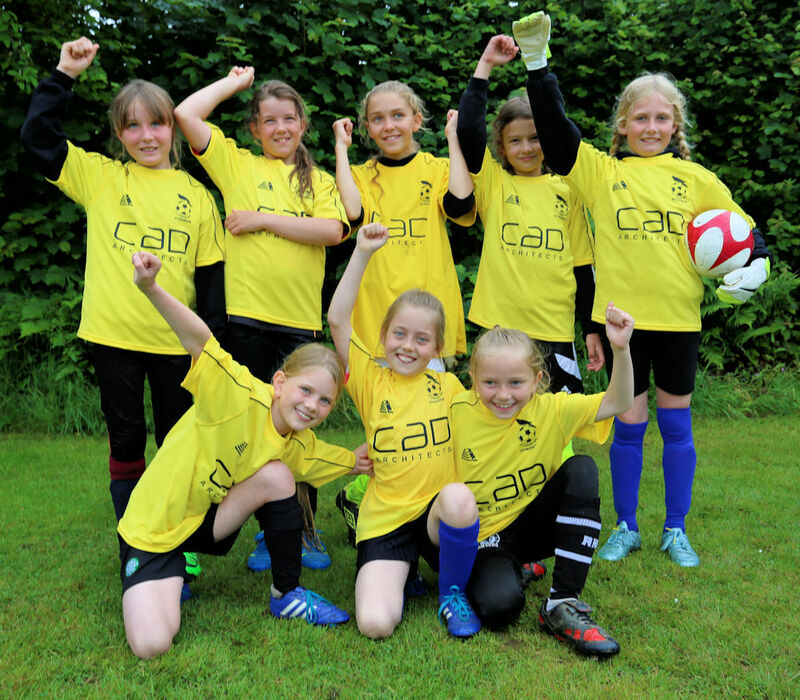 Club Chair Mandy Kimmins said "How brilliant for Jasmine to visit the girls were enthralled. They are normally a very noisy lot, but were hanging on her every word. Brilliant questions from them too keeping her on her toes with the answers. 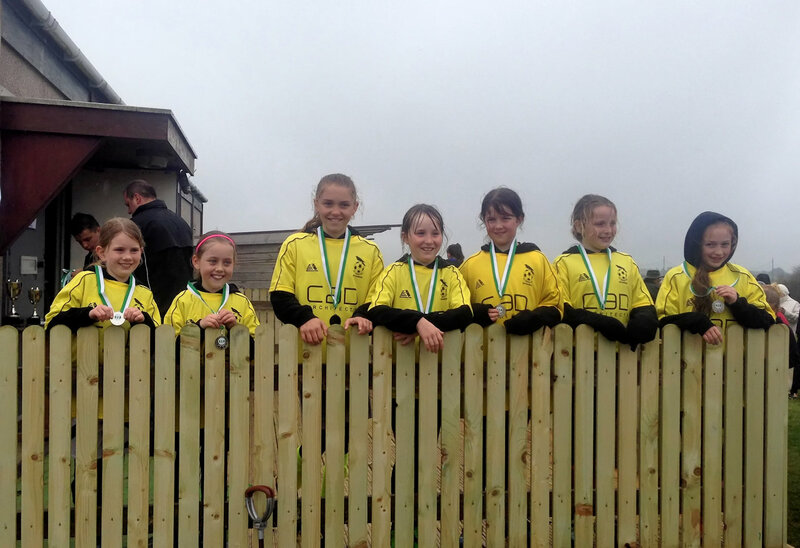 A fantastic morning for the girls, parent and coaches! Thank you Jasmine you are a fine ambassador for your sport”. 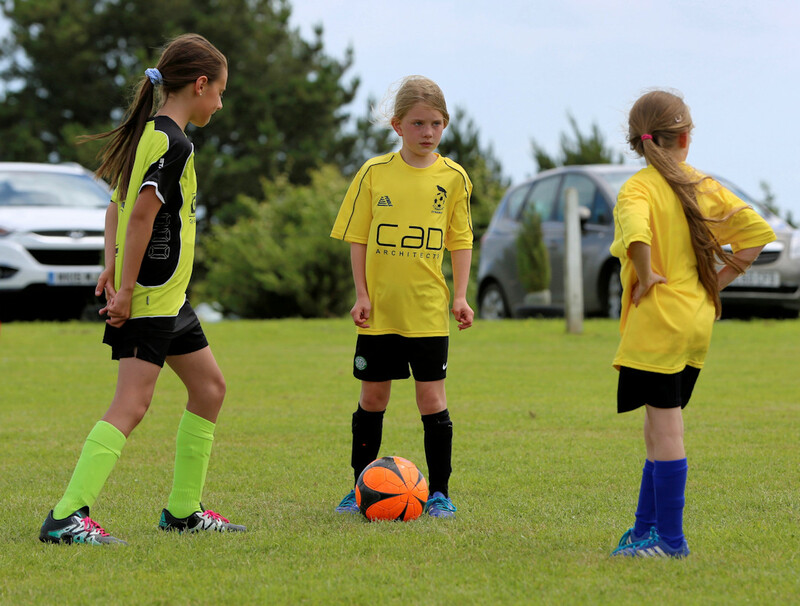 Any girls interested in joining the St Agnes AFC Dynamos Girls who train on a Saturday morning are welcome to contact Mandy Kimmins on 07974 370666 for more details. 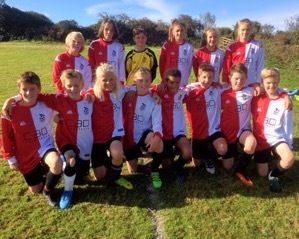 St Agnes AFC Dynamos Under 13's entered the Cornwall FA Under 14's County Cup and are photographed just before the fixture. 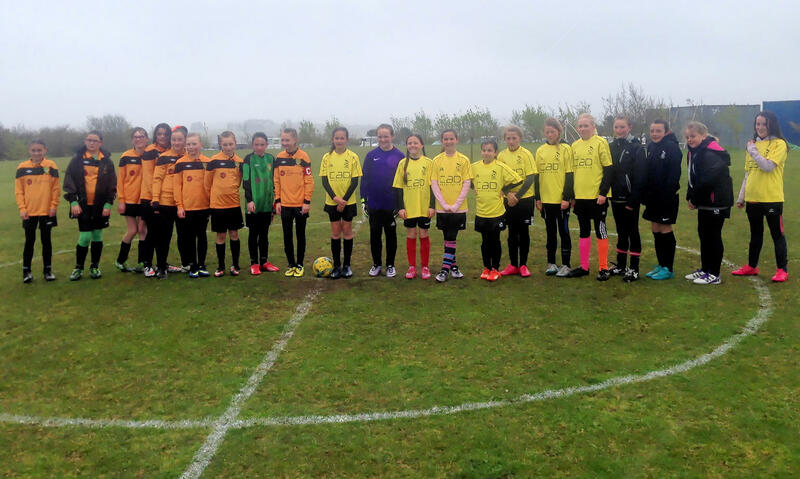 Playing Saltash Under 14 Girls, a year above them, they gave an amazing account of themselves with some playing in their first fixture at the different format of 9-v-9 and with offsides. 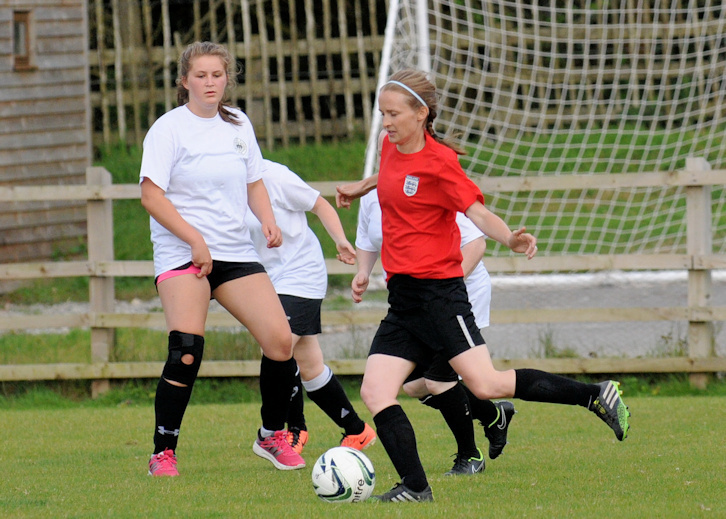 The girls gave an excellent passing performance, but were beaten by a narrow 2-0. 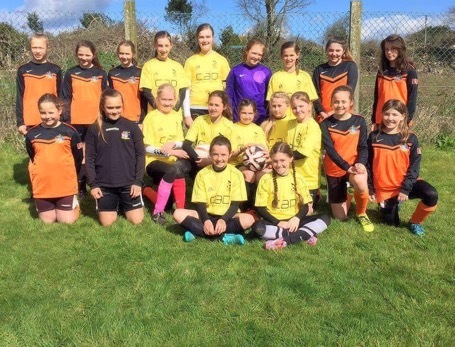 The St Agnes AFC Dynamos under 11's travelled to Charlestown where they gave an equally impressive exhibition of girls’ football again playing up in an Under 12's County Cup losing 2-1. 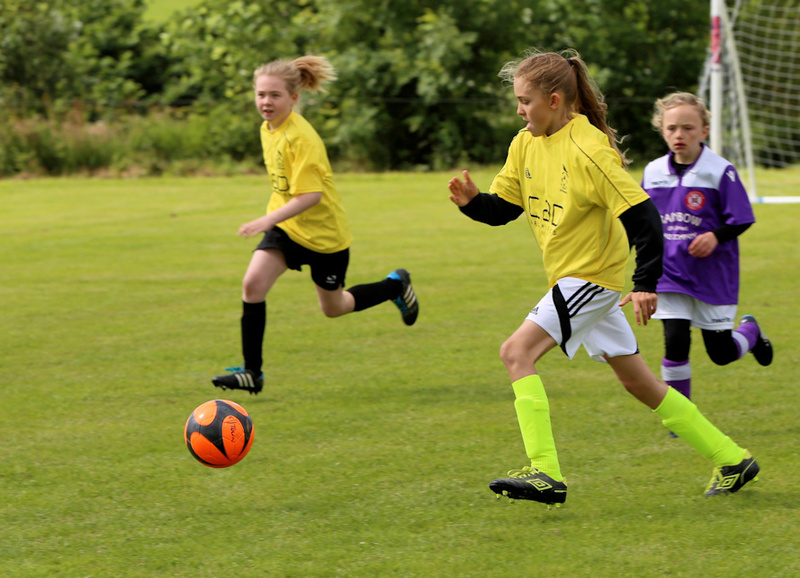 Any girls of any level of experience interested in playing football is welcome to join in training on a Saturday morning at Blackwater School please contact Mandy Kimmins on 07974 370666 for more details. 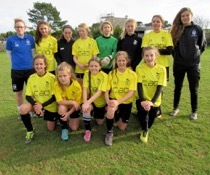 Photo below is St Agnes AFC Under 13's girls with coaches Zoe Arundell-Lethbridge and Charlotte Collier. 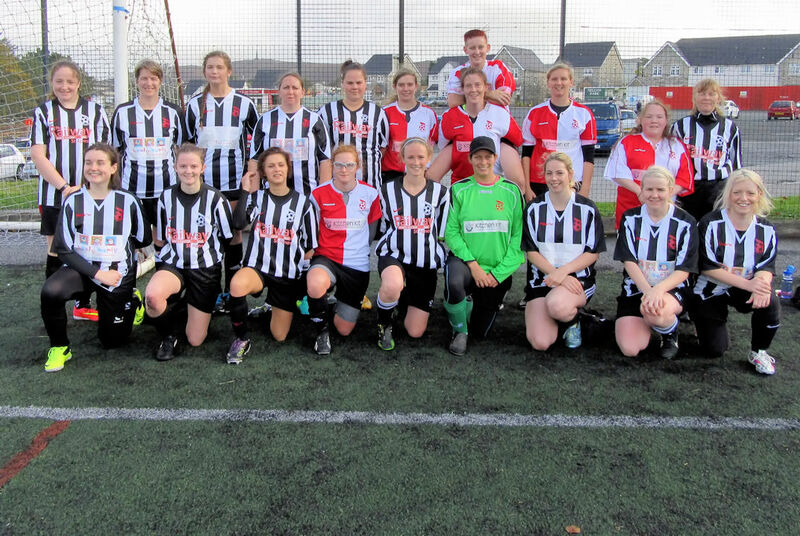 St Agnes Ladies travelled to Wadebridge on Sunday for the 1st round of the CCFA Women's County Cup. St Agnes ran out the victors 11-0 with goals from Mollie Dring (1), Zoe Arundell-Lethbridge (1), Lexi Riley (4), Charlotte Collier (1), Lyndsey Cowl (1) and Debbie Duncan (3). 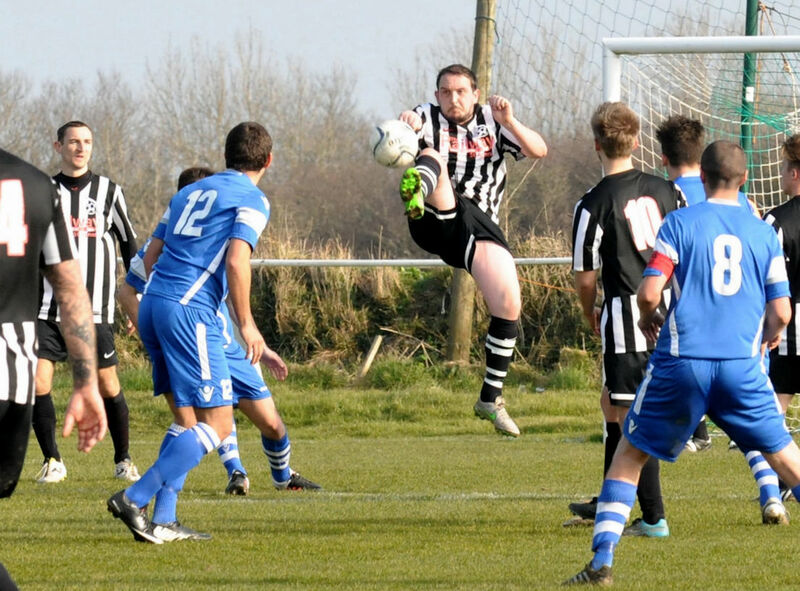 Newly reformed this season Wadebridge showed a much improved performance and determination battling to the end. 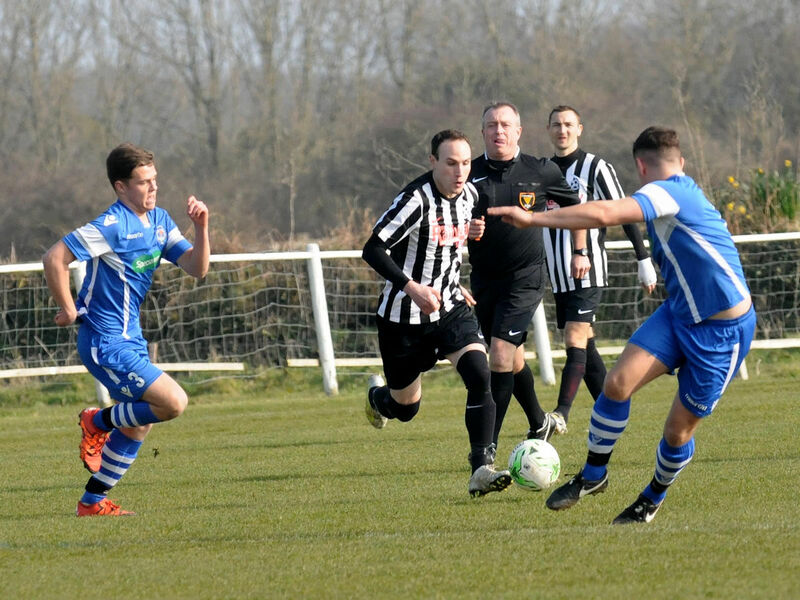 St Agnes AFC hosted an afternoon tea party after their home fixture on Saturday to celebrate Russell Fowler's 90th Birthday. 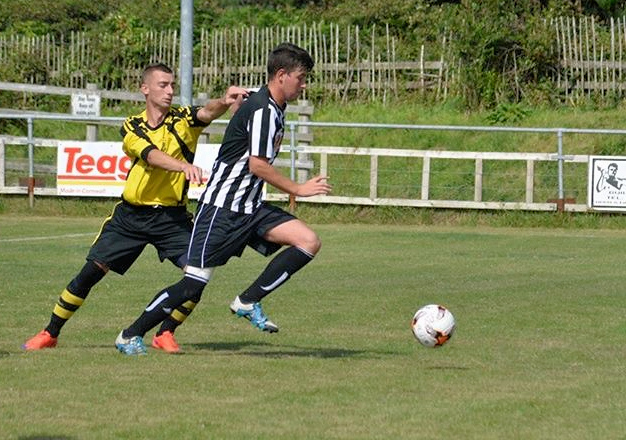 Russell has shown outstanding commitment to St Agnes AFC. From his time as a player during the 40's & 50's, when he was a top striker, to his other roles over the years when he featured as a manager, linesman, committee member, etc, etc, etc. 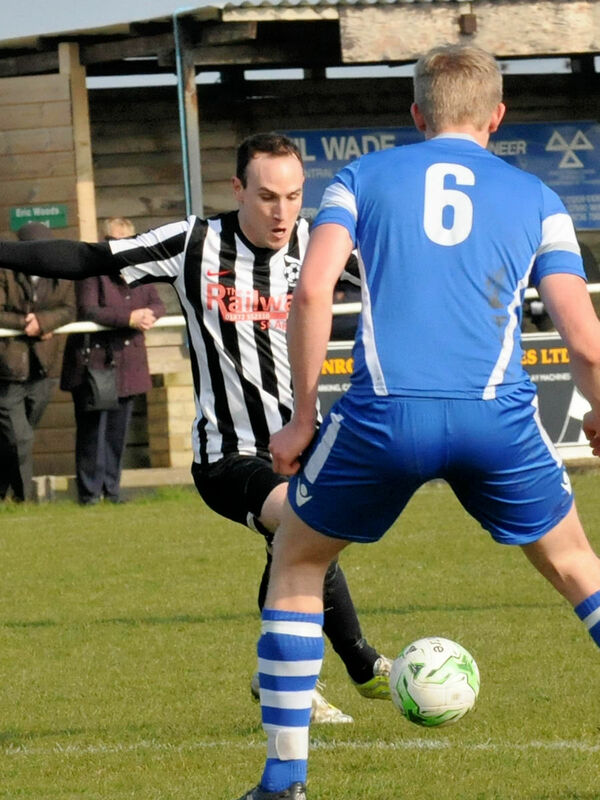 Russell still supports the club even up to the modern day regularly attending both home and away fixtures and often offering advice to managers and players on how things should be done! 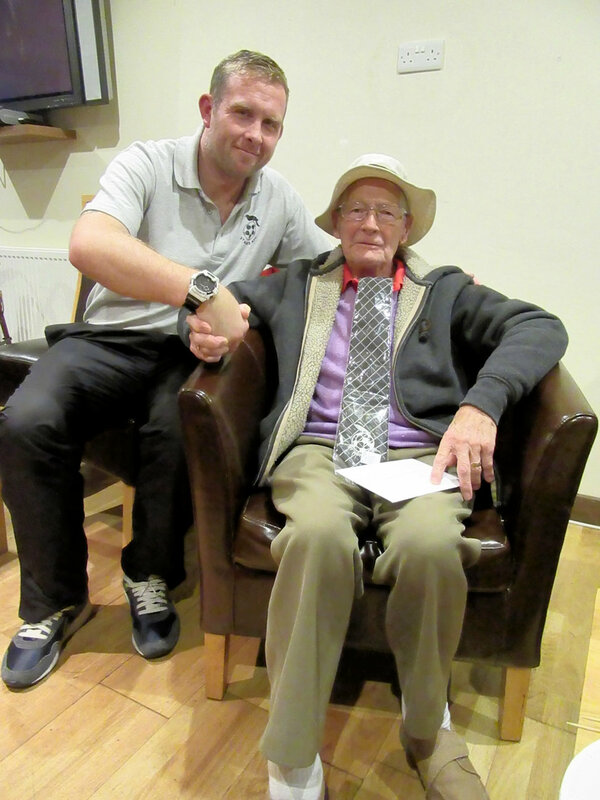 Russell was presented with a card and club tie by first team captain Justin Miles who said "Thank you for all the years of work and support you have contributed to St Agnes AFC. Happy Birthday”. 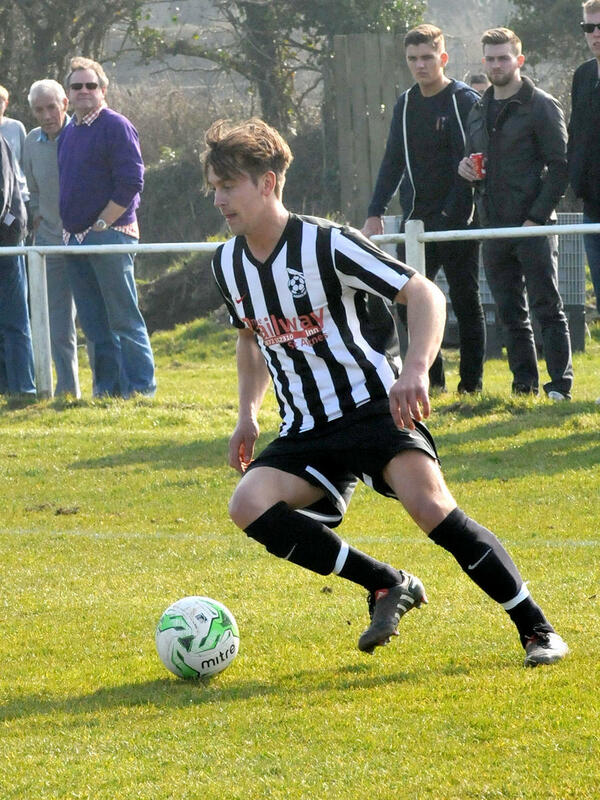 1st Team manager Martyn Kimmins said "I have known Russell since I was a child and he has been a true supporter of St Agnes AFC”. 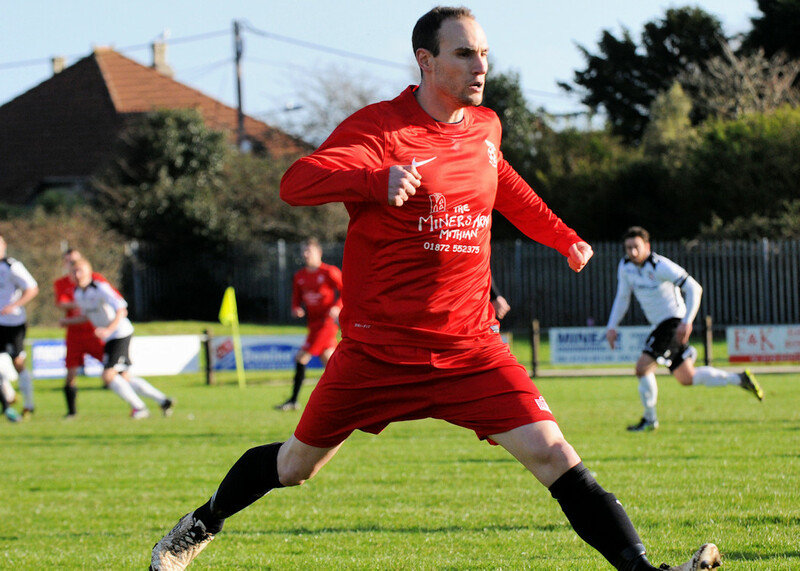 Club Chair Mandy Kimmins said "Russell is a local footballing legend and a proper gentleman! It was a privilege to help him celebrate his special birthday and say thank you for all those years of commitment”. Photo attached Russell Fowler being presented with St Agnes AFC Club Tie by Captain Justin Miles. 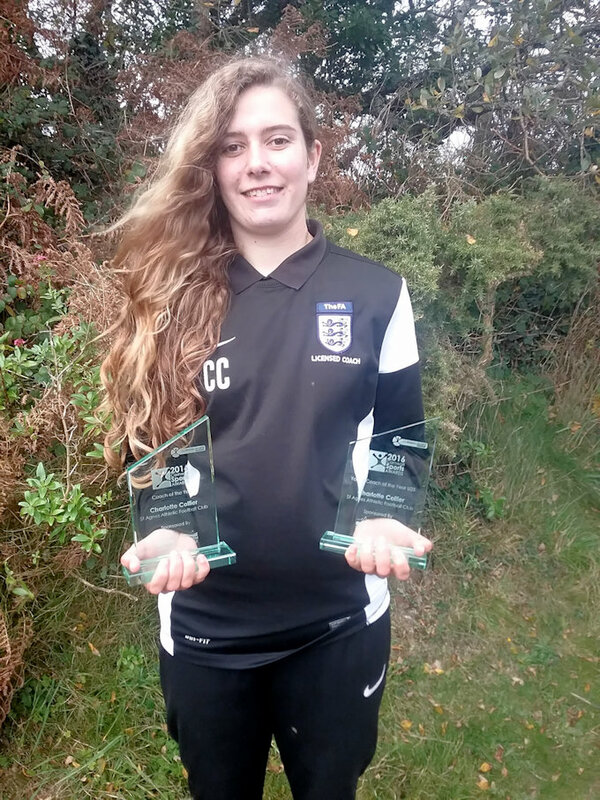 St Agnes AFC Dynamos Girls Coach Charlotte Collier will represent Cornwall at National Awards following her presentation at the Cornwall Sports Partnership Awards on Friday. Charlotte was winner of the Young Coach of the Year Under 25's and Coach of the Year. 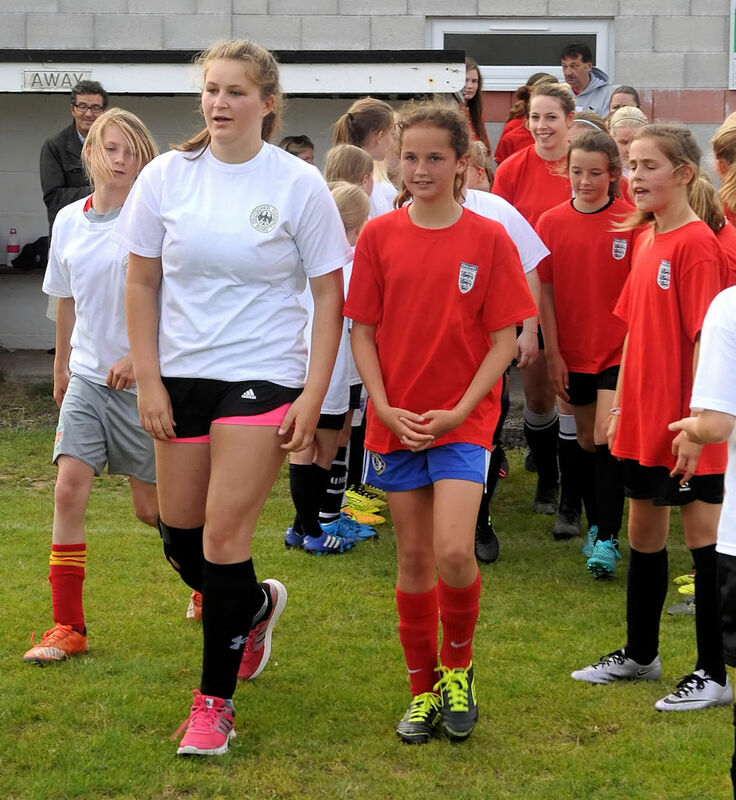 Charlotte commented "What an inspiring evening seeing all the amazing people involved in sport across Cornwall. I am completely speechless to have won”. 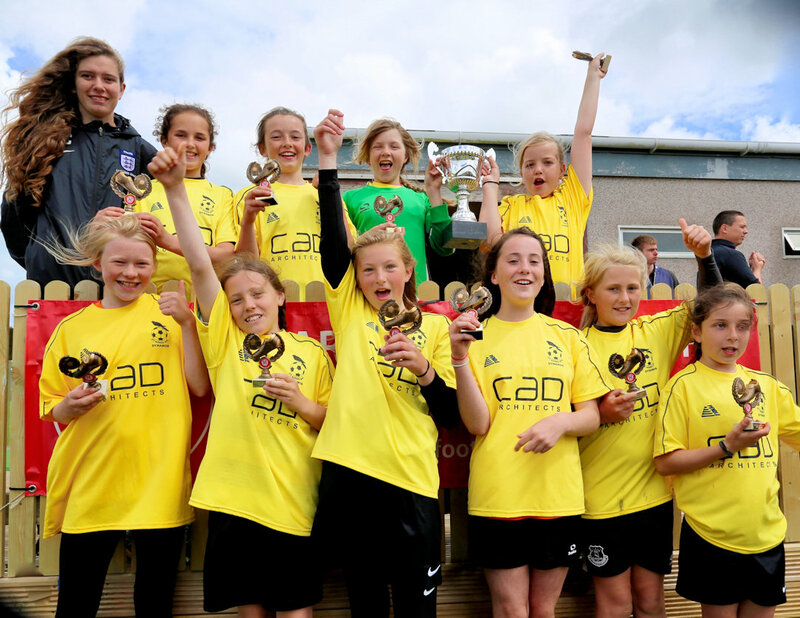 St Agnes AFC Chair Mandy Kimmins said "We are all incredibly proud of Charlotte and what she has achieved. Her commitment and dedication to her coaching is second to none and these awards are a brilliant recognition of the time, planning, effort and enthusiasm she has contributed”. 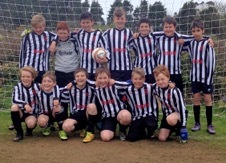 Members of St Agnes AFC Under 13's are photographed before their KYFL cup fixture at home -v- Wendron, which they won 8-2. 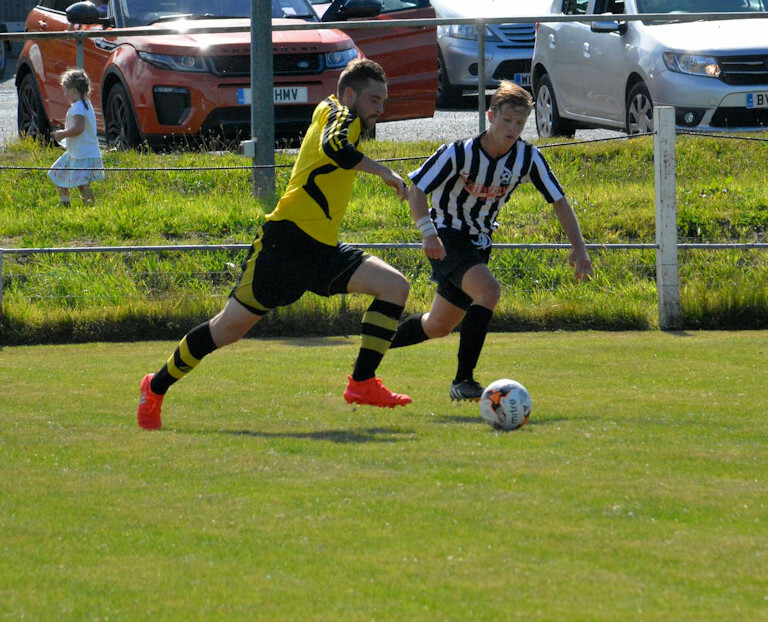 It was their first match in their new playing kit for the 2016/17 Season generously sponsored by Jeremy Bradley and all at CAD Architects. 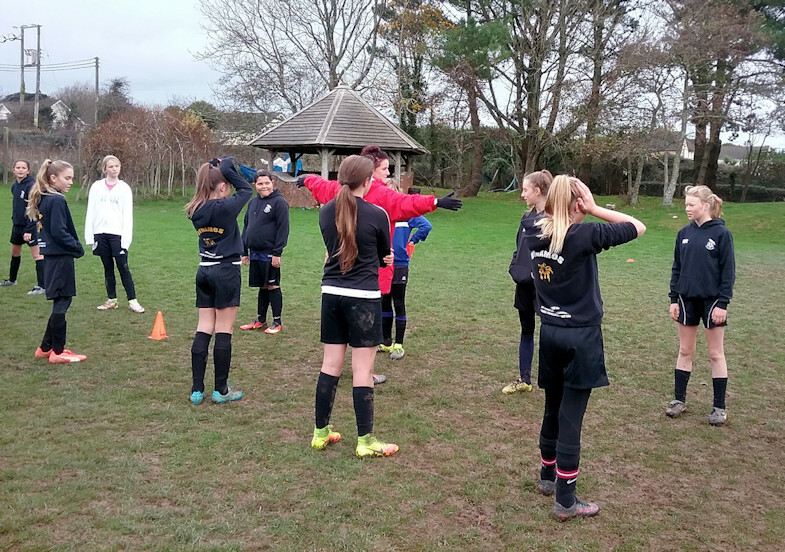 More than 40 members of the St Agnes AFC Dynamo Girls had an amazing morning at Enys Parc on Saturday 15th October when Chris Morris delivered a Girls Masterclass for them. 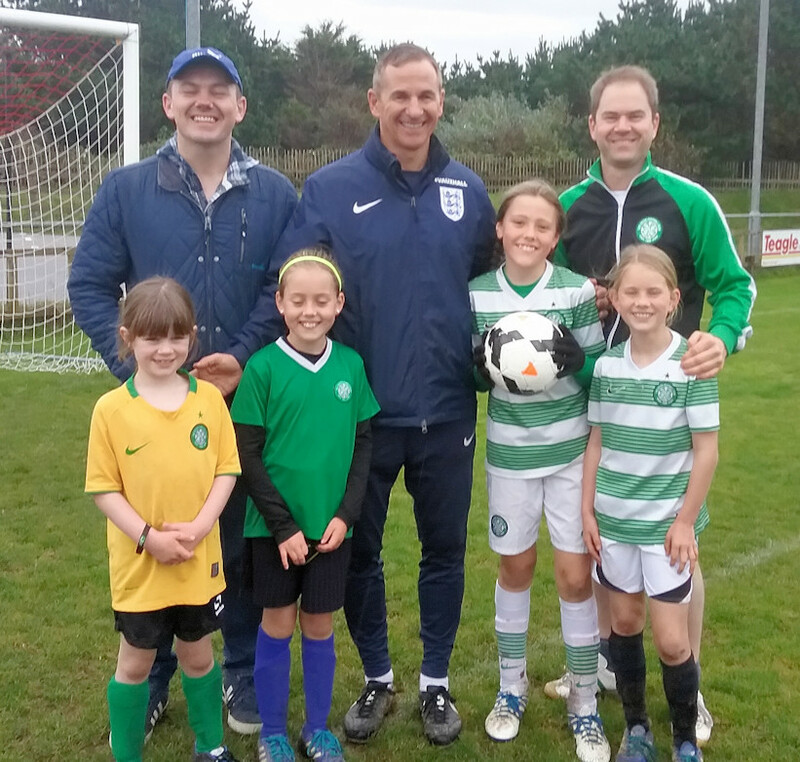 The girls in age groups Under 7's, 9's, 11's and 13's were inspired as Chris a former Republic of Ireland International player who took part in the 1988 European Championships and 1990 World Cup and also played for Celtic, Sheffield Wednesday and Middlesborough delivered sessions across the morning. 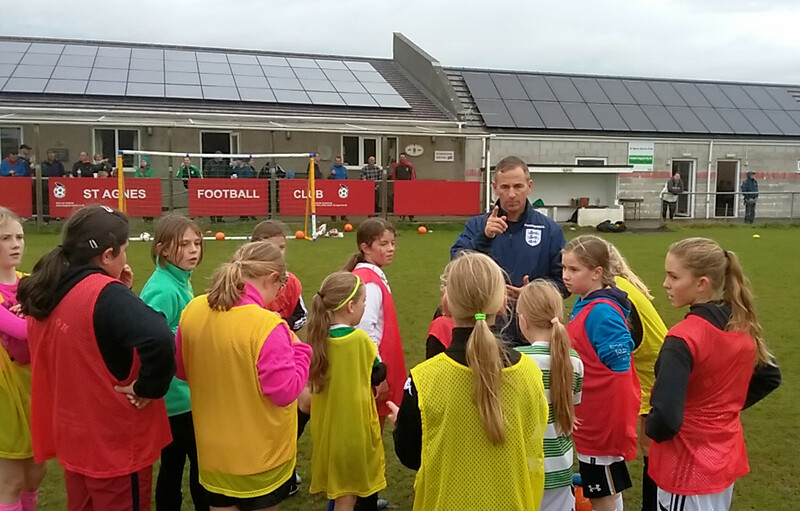 Chris now works for the FA as a Coach Developer and the event was specific to female football. 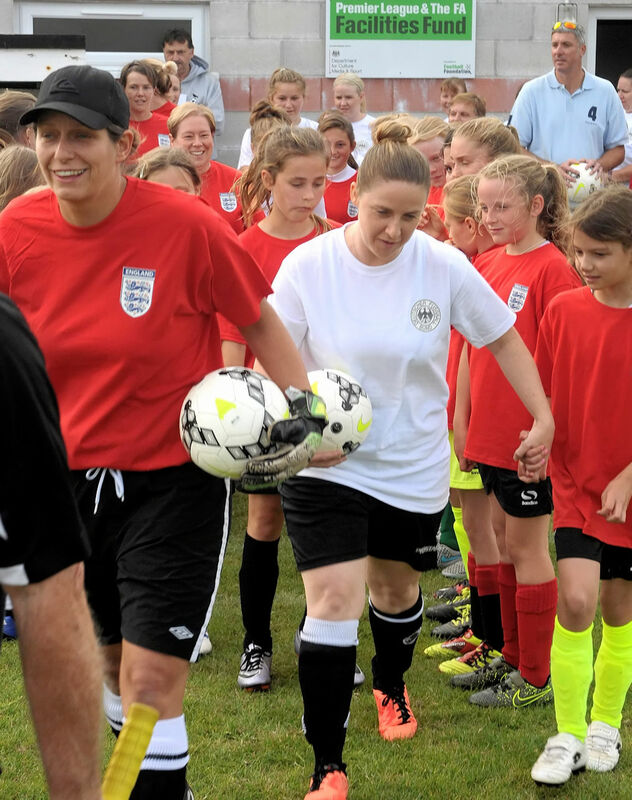 15 coaches from other teams and clubs also attended and observed the sessions to share and learn good practice and continuing professional development within the female game. Under 13's player and Celtic supporter Millie enthused "This morning was brilliant I will remember it always. The coaching was amazing”. 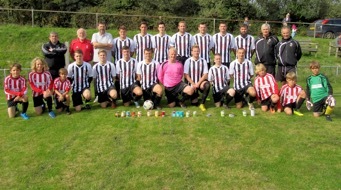 St Agnes AFC used the event as an opportunity to support the Kick it Out Campaign tackling Racism and Discrimination. 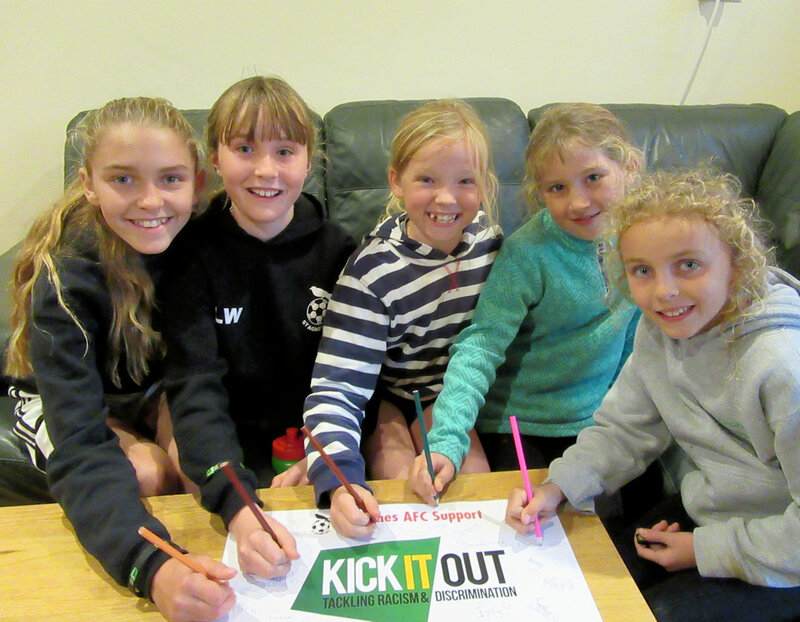 All players and coaches were given a Kick it Out wristband to wear and asked to sign a poster supporting the initiative. 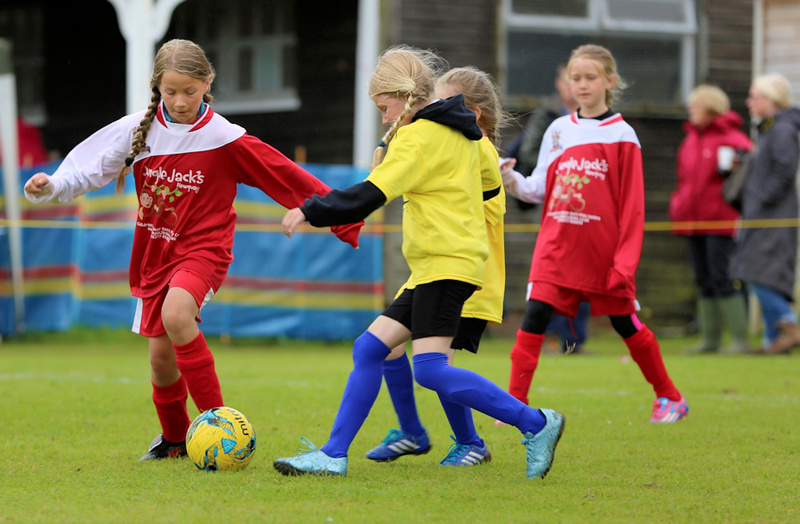 Under 11's player Katie said "I think everyone, whether they are a boy or a girl, old or young, disabled or of a different race should be able to play football and love it as much as I do!”. 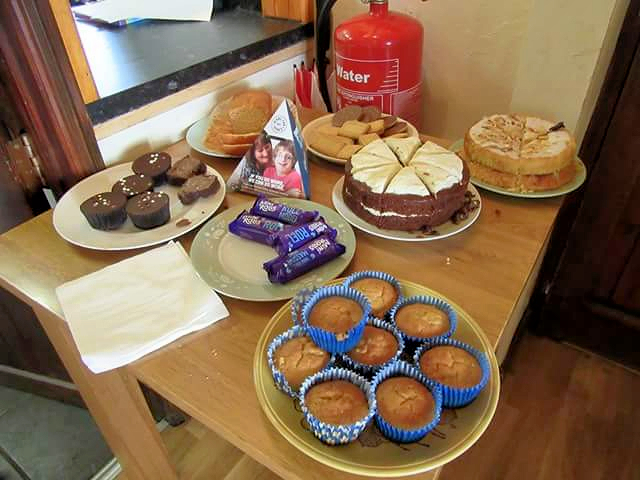 Coffee and Cakes with a raffle during the morning raised £150 for Little Harbour, Children's Hospice SW who make the most of short and precious lives. 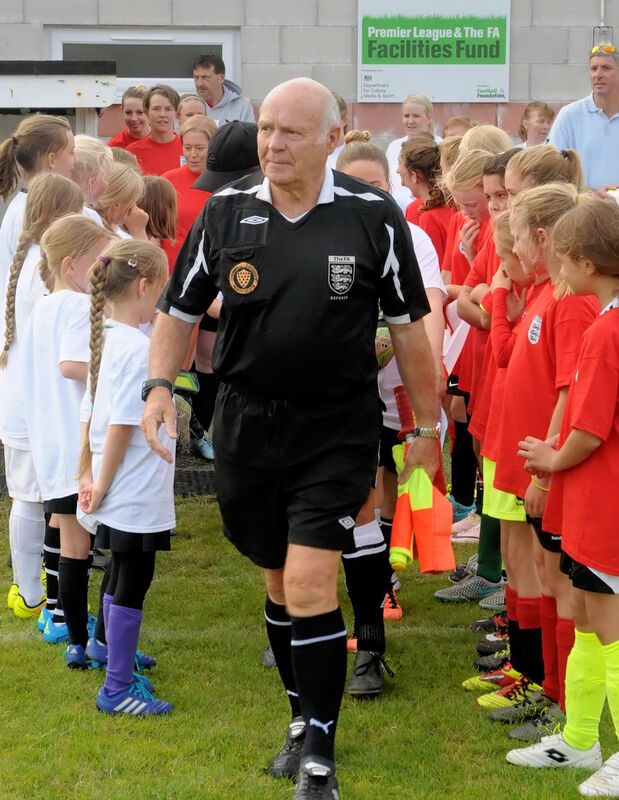 Dad Barry Buist commented "Thank you so much for organising everything today for the girls, they all had a ball! Events such as the one today will stay in their minds forever and that's what sets St Agnes apart from other clubs I've been involved with. My wife and I really appreciate the opportunities you are providing for the girls. Thank you again!" 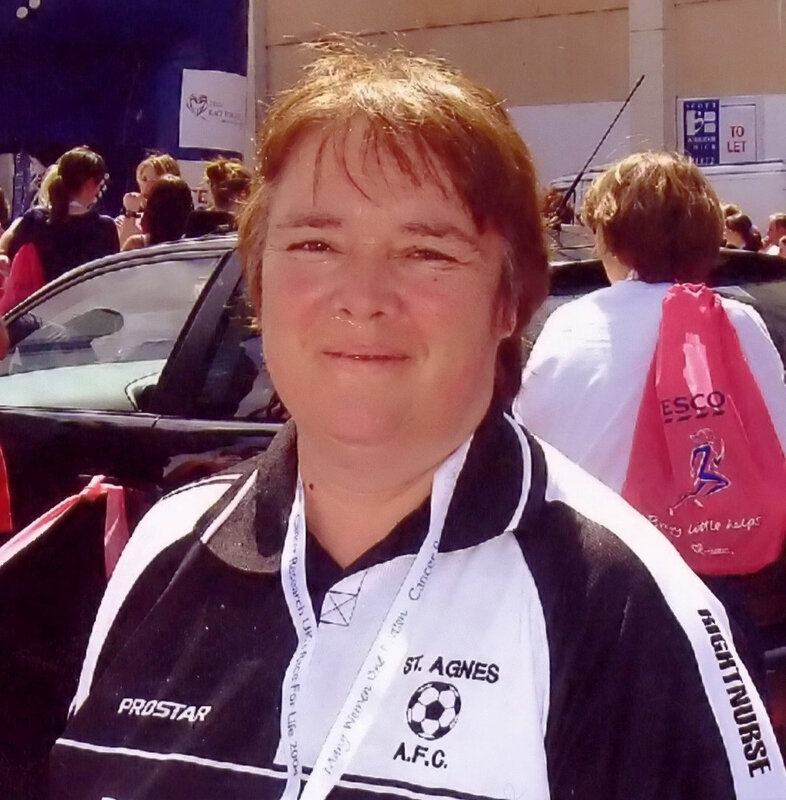 Mandy Kimmins, Chair of St Agnes AFC, summed up the morning saying "What a brilliant morning, the girls were amazing and Chris was inspiring to them and all the other coaches who attended. Thank to everyone who supported in every way!”. 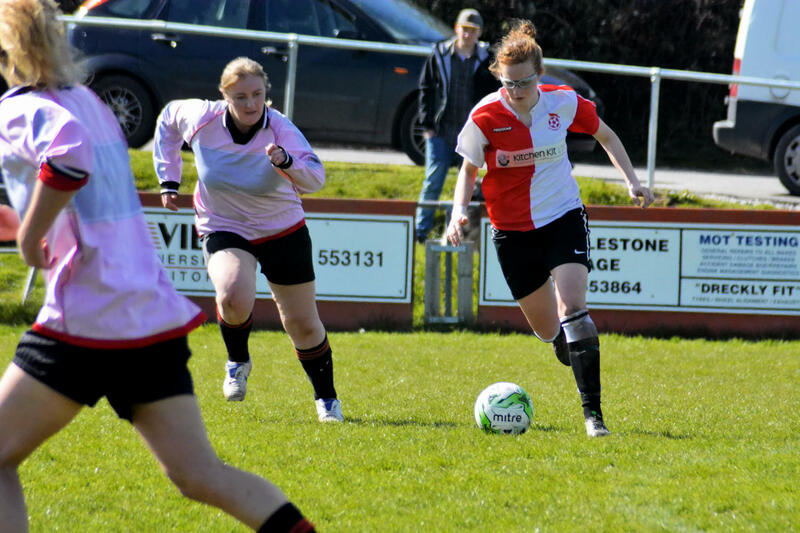 St Agnes AFC Dynamo Girls welcome new players of any ability please contact Mandy Kimmins 07974 370666. 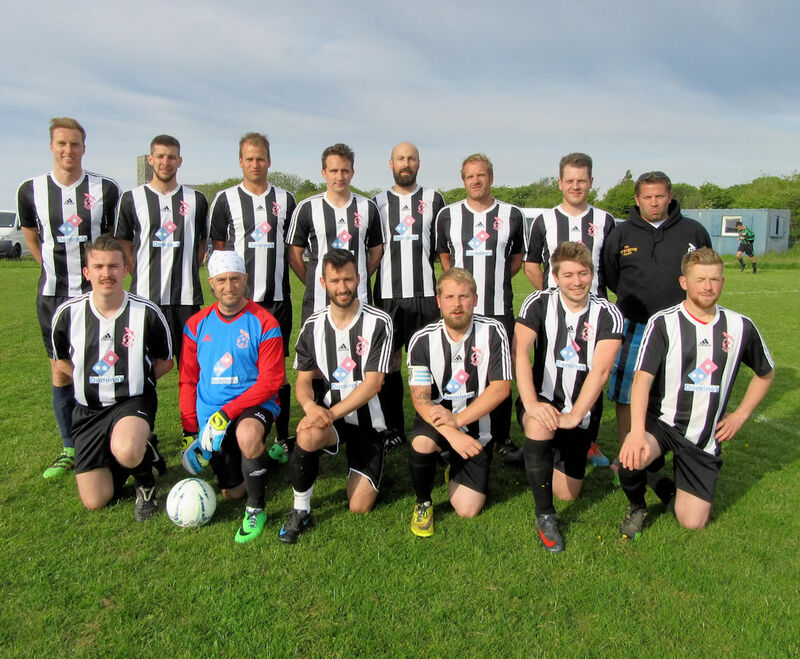 St Agnes AFC 1st Team are photographed in their new kit for the 2016/17 Season generously sponsored by Anouska House of the Railway Inn and Miners Arms for the 7th consecutive season. Photographed with them are members of the St Agnes AFC Under 11's as match day mascots for the 1st Team Senior Cup home fixture. The Annual 1st team collection of tinned food for the Foodbank donated a box of almost 40 tins to the Camborne Foodbank. 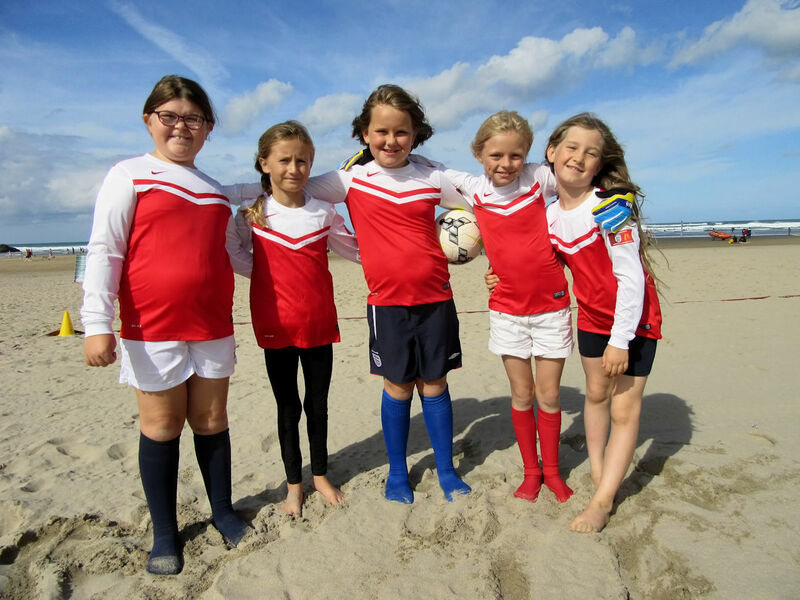 St Agnes AFC Dynamos Girls entered the CGFL Perranporth Beach Festival on Sunday with over 40 girls representing the club in 6 teams across 4 age groups. 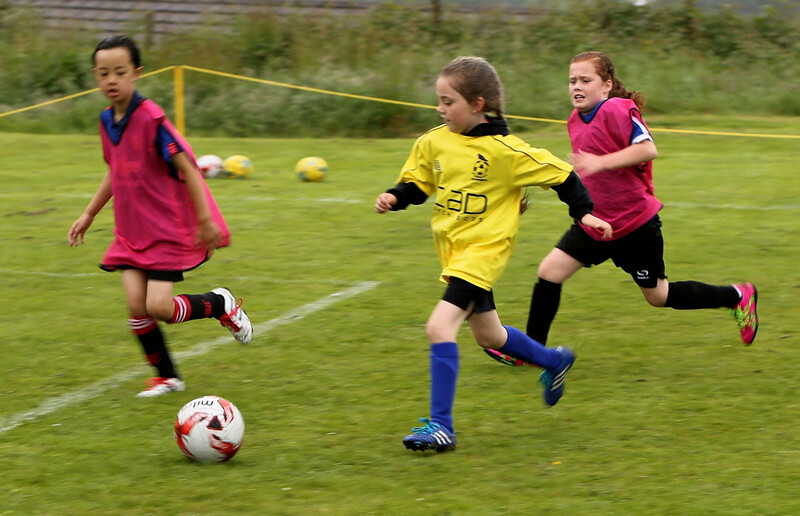 Having only set up their girls section 12 months ago the development and growth has been amazing. 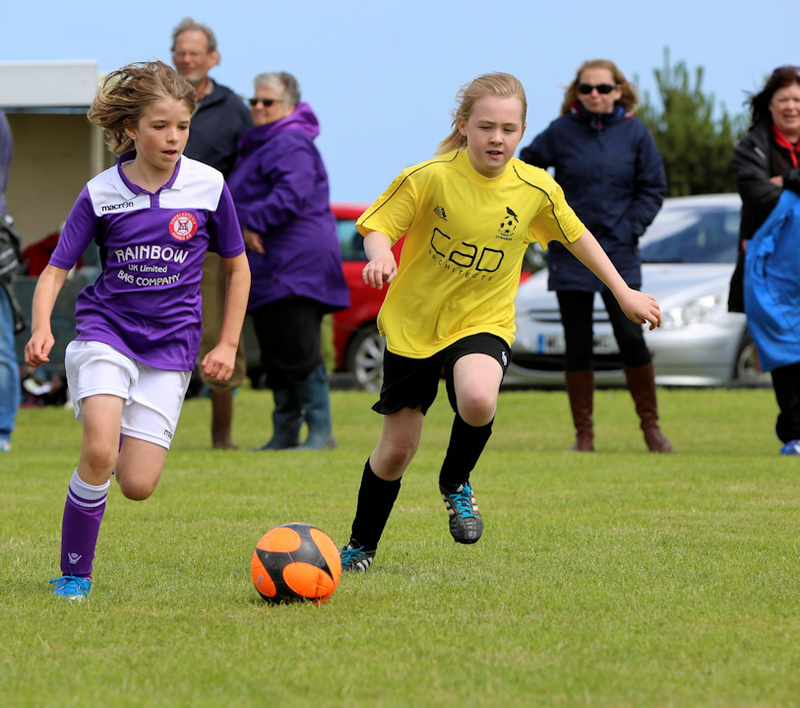 Two new club sides took part with the St Agnes Under 9's playing some wonderfully entertaining football in their non-competitive group and the Under 18's reaching the semi-final being narrowly beaten on penalties. 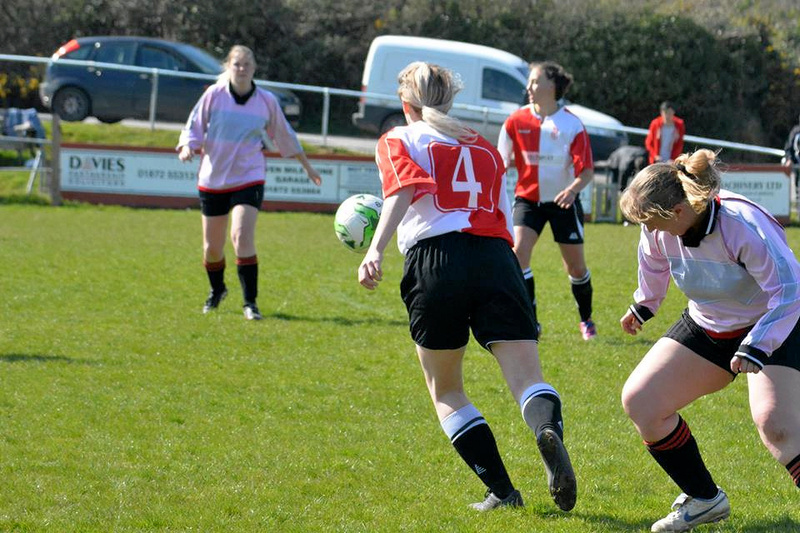 Any girls interested in joining St Agnes AFC Dynamos is welcome to get in touch. The club is presently running sessions for Under 7's, 9's, 11's, 13's and 18's contact Charlotte Collier or Mandy Kimmins 07974 370666. 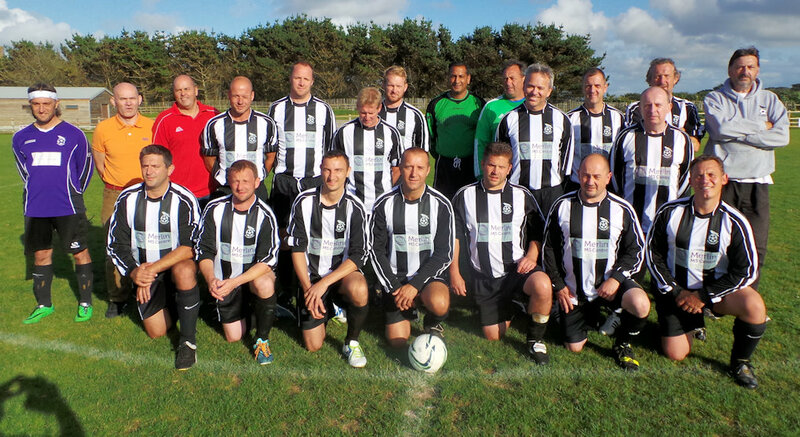 For the 9th year running St Agnes AFC hosted Elstead Vets on tour at the weekend. 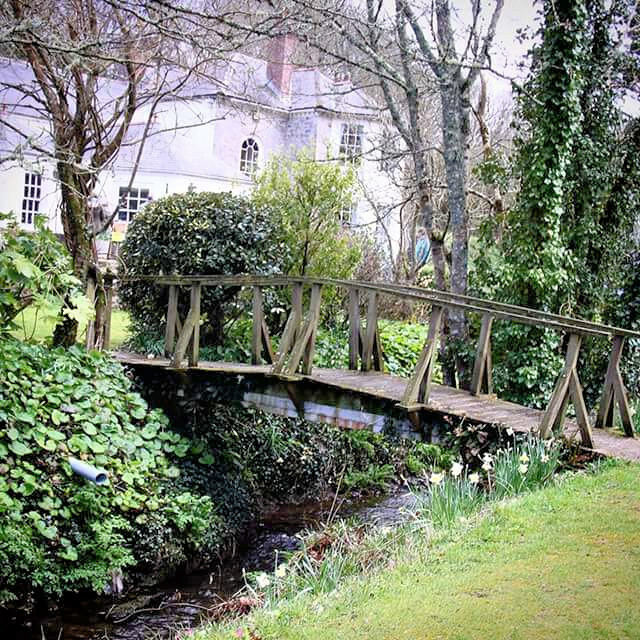 This year they played St Agnes Under 18's (16-18 years) at Enys Parc in a spirited entertaining match with the experienced Elstead players storming ahead to a 0-3 lead. 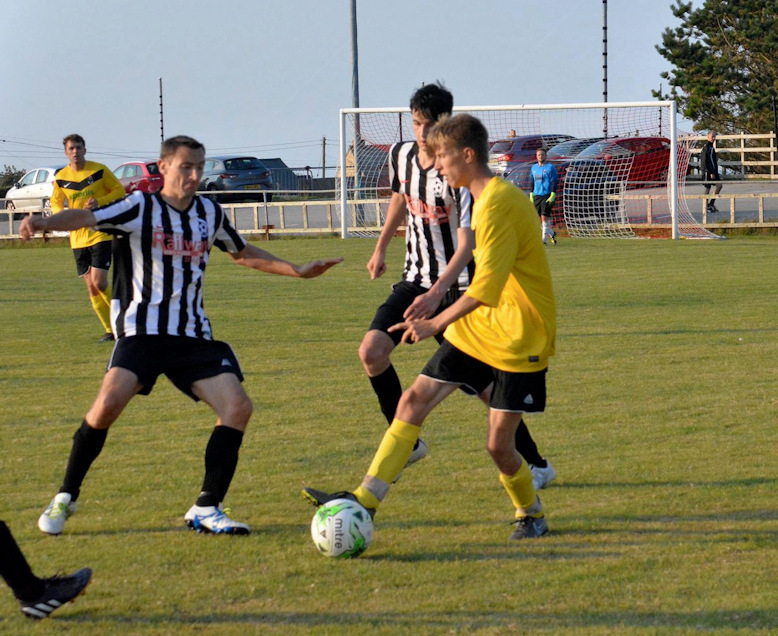 Fitness and age prevailed as the St Agnes boys mustered themselves to finish the match at a 3-3 draw. 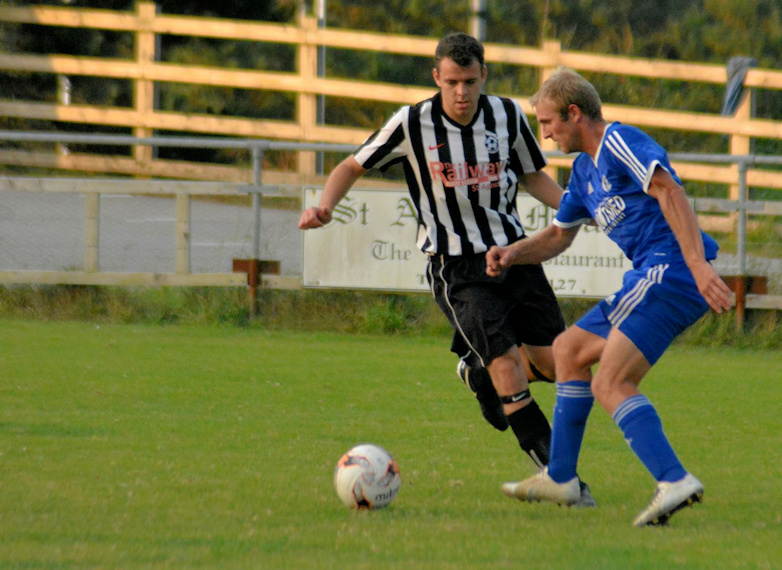 Next year a special fixture is planned to celebrate the Elstead 10th Anniversary Tour and any players who have featured against them for St Agnes over the years are welcome to get in touch to play a part in the fixture. 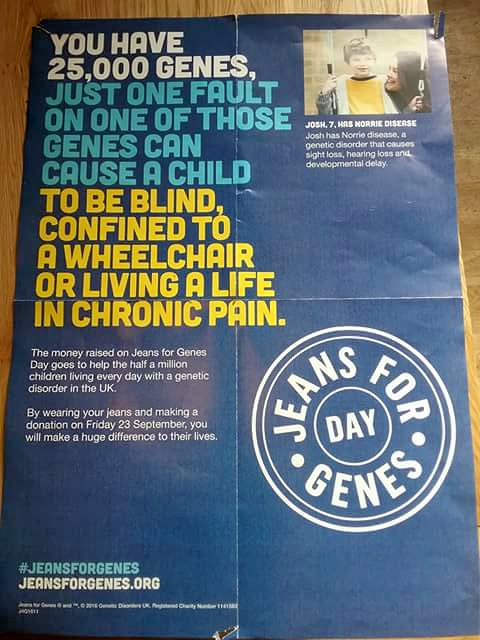 Please contact Martyn Kimmins on 07974 370666. Photos courtesy of Becky Hunter. 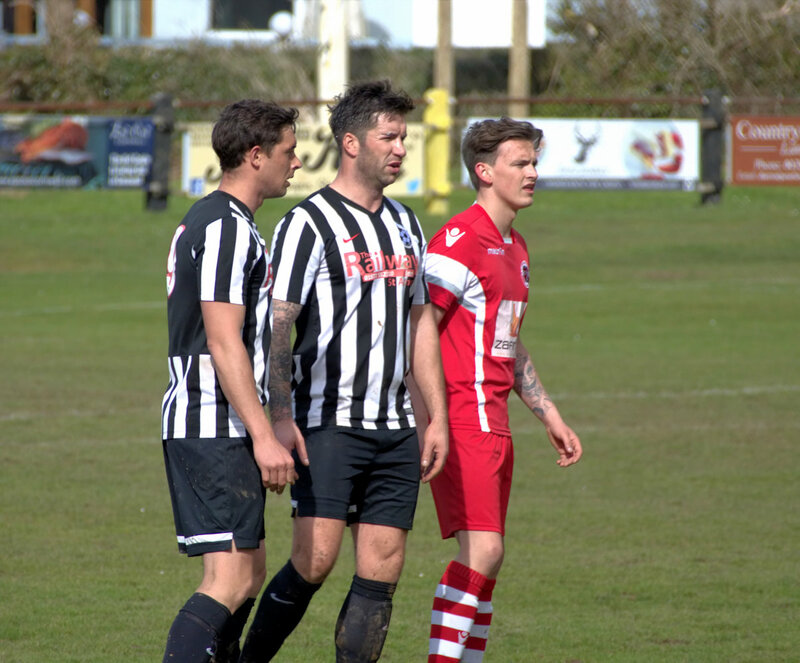 St Agnes AFC Bolster Veterans launched their new black and white strip with logo supporting the Merlin MS Centre in an inter-club friendly. 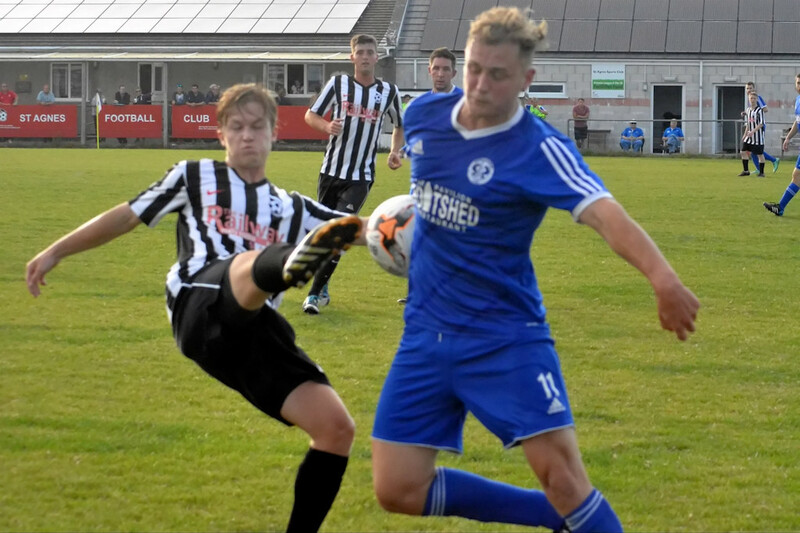 Following the match a players collection and raffle raised £110 for the Merlin Centre a place of support, therapy and information in Cornwall for people with multiple sclerosis. 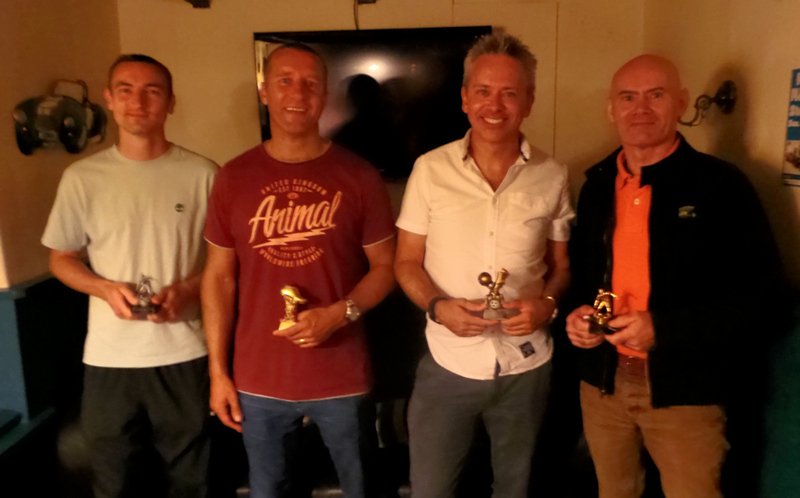 www.merlinmscentre.org.uk The Bolsters then held their end of 2015/16 Season presentations with Dan O’Toole Players Player, Steve Bayley Managers Player, Trevor Whisker Top Goal Scorer and Brendon Curran Loyalty Award. 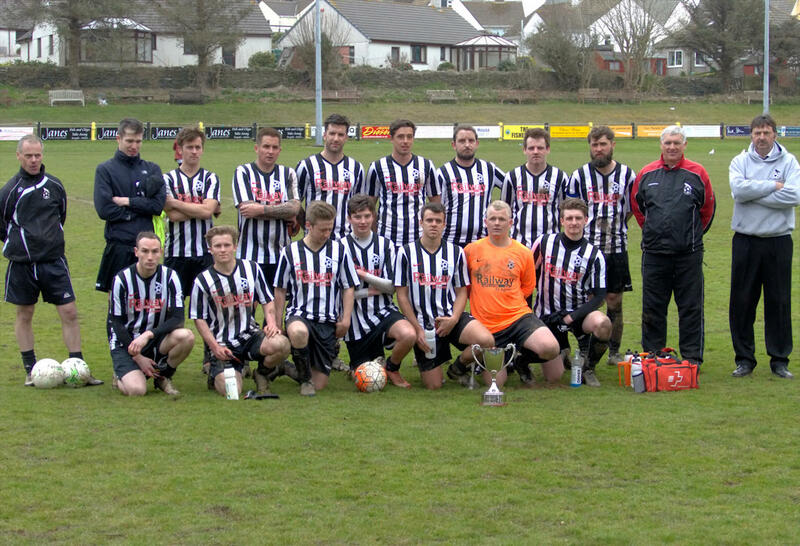 Any players 35 and over interested in joining St Agnes AFC Bolster Veterans is welcome to contact Steve James on 07969 928287 or Martyn Kimmins on 07974 370666. St Agnes AFC Dynamo Girls had a really fun time entering St Agnes Carnival 2016 with the bonus of coming Runner's Up in their category. 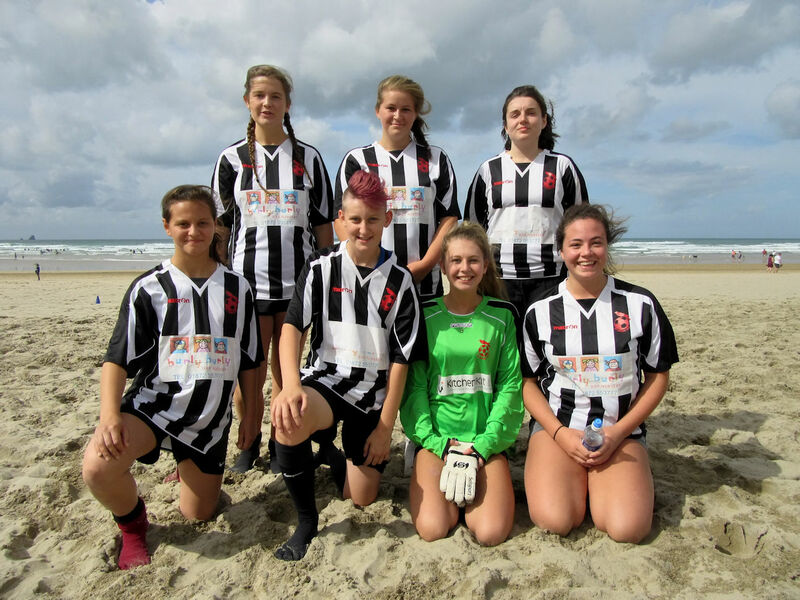 St Agnes AFC Ladies have been busy pre-season raising over £1000 for Cancer Research UK across 3 events their 1966 World Cup 50th Anniversary evening, Ladies Tournament and team entry into the Truro Race for Life. 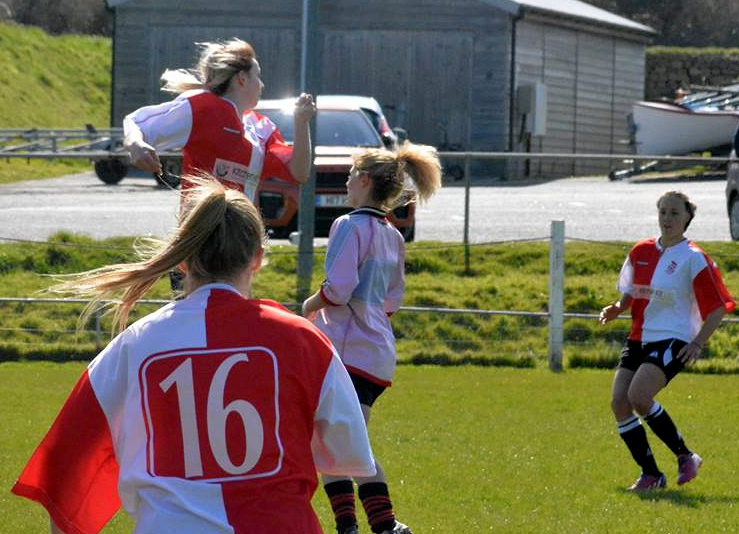 They played their first pre-season friendly on Sunday hosting SWWFL team Callington at Enys Parc. 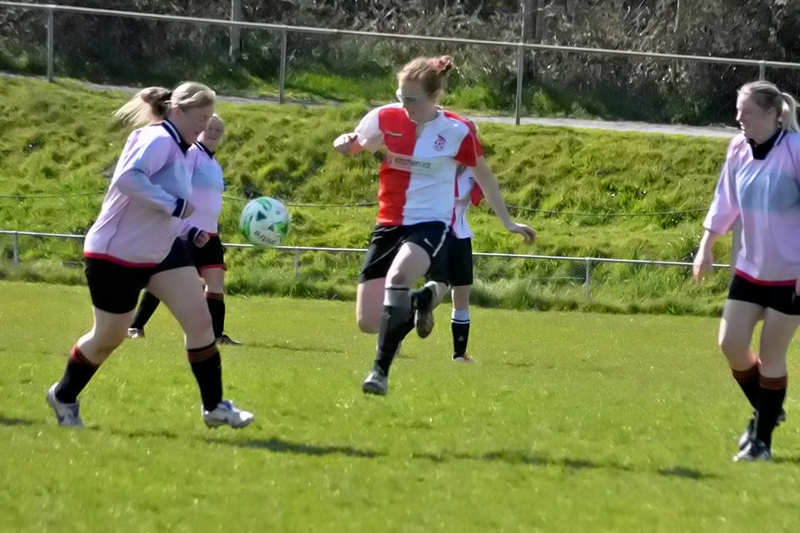 The St Agnes scoring was opened by Jodie Hood her first goal for St Agnes with Debbie Duncan scoring her first and a second before halftime the score 3-2. Lexi Riley scored the fourth St Agnes goal 25 minutes from the end which proved the winner with the final result 4-3 to St Agnes. 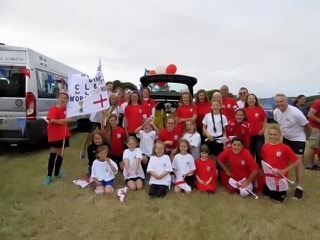 As part of an FA and Cornwall County FA initiative, to mark and remember the 50th Anniversary of the 1966 World Cup England v Germany win, St Agnes AFC ladies & girls held an event at Enys Parc re-staging England v Germany fixtures. 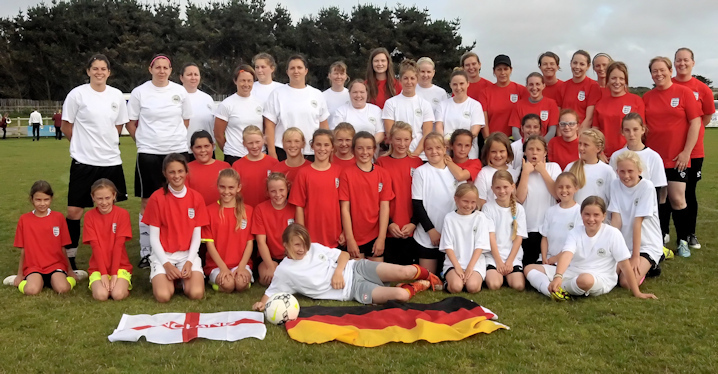 Three fixtures took place with an under 10's and 12's match and a Ladies fixture with teams dressed in England v Germany t-shirts. St Agnes Silver Band supported the event giving brilliant renditions of both the German and England National Anthems. 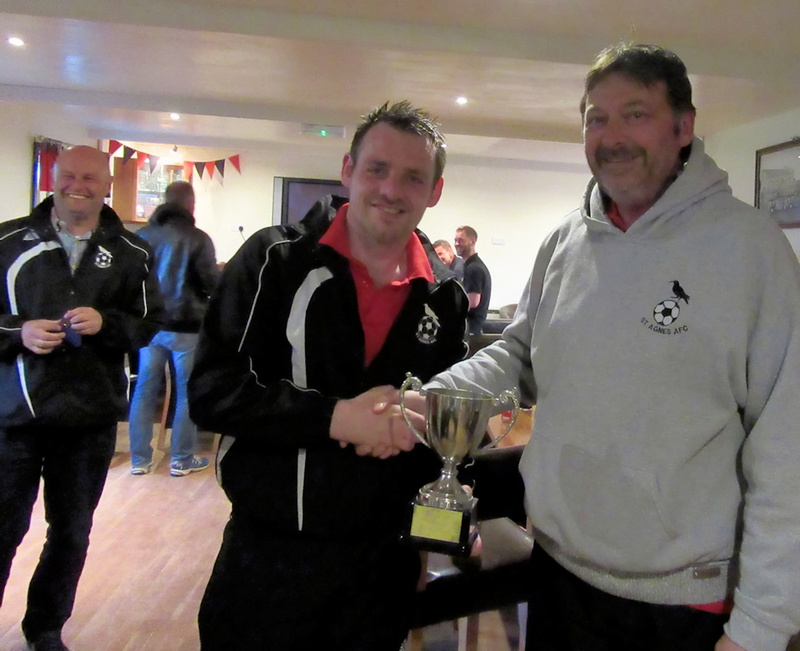 The club was presented with a cheque for £250 and a plaque to mark the occasion by Ian Annear from the CCFA. A raffle and colllection on the evening raised over £150 for the Bobby Moore Cancer Research Charity. 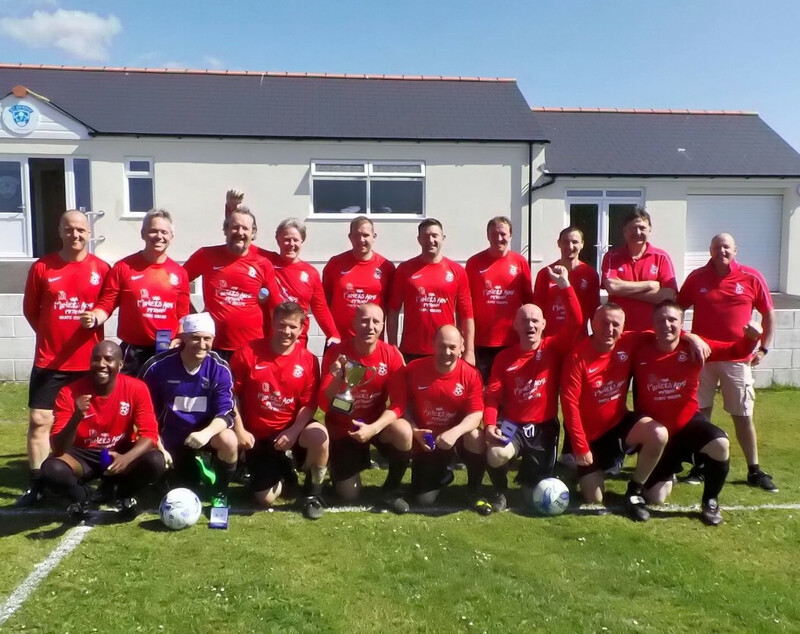 A fantastic day of ladies football took place at Enys Parc on Sundsy as fourteen teams entered the Annual St Agnes AFC 7-a-side ladies charity tournament. 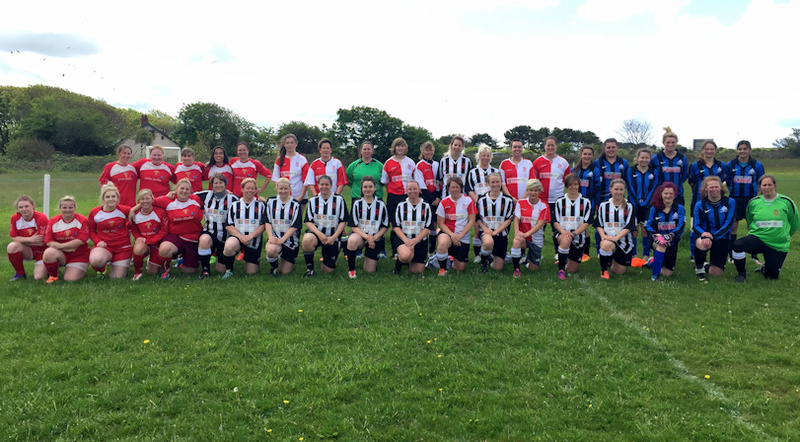 Played across two pitches the competition was keen with the top teams on each pitch of Mousehole Ladies and CTLFC (Callington Town LFC) facing each other in the final. 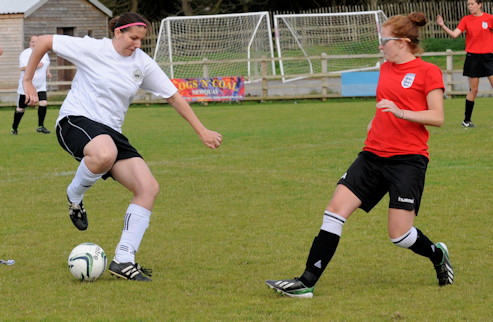 Mousehole put up a spirited performance against their higher league opponents with CTLFC running out 2-0 winners. 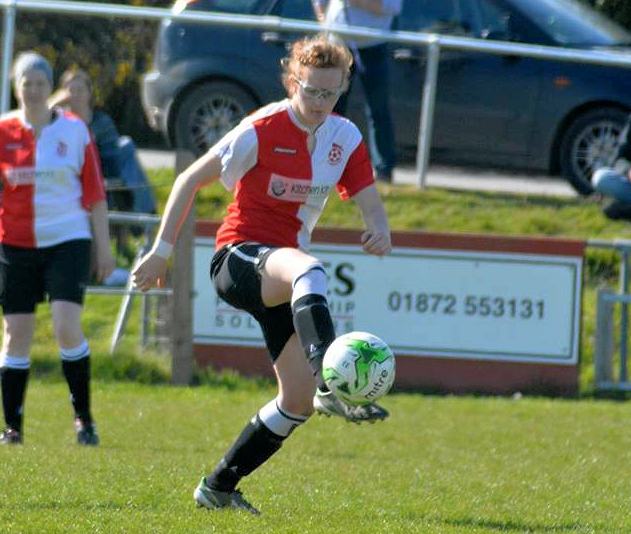 Kat Marment from CTLFC won the referees award as player of the tournament. 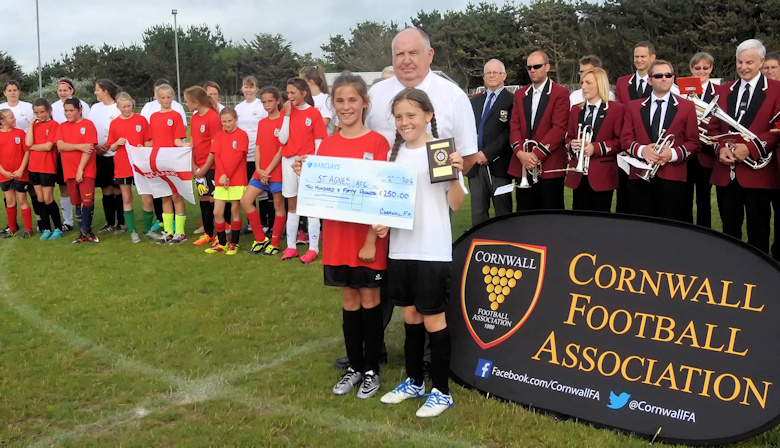 Presenting the trophies St Agnes AFC Chair Mandy Kimmins said "What a great advert for ladies football today has been. Almost 140 ladies playing some excellent football with a wonderful atmosphere. 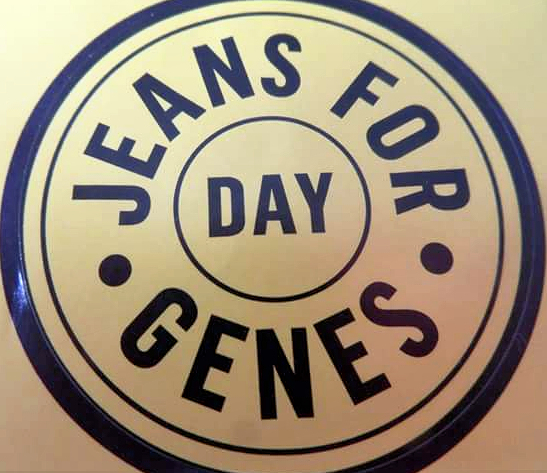 Half of today's proceeds will be donated to Cancer Research UK. Thank you to everyone who supported in every way”. 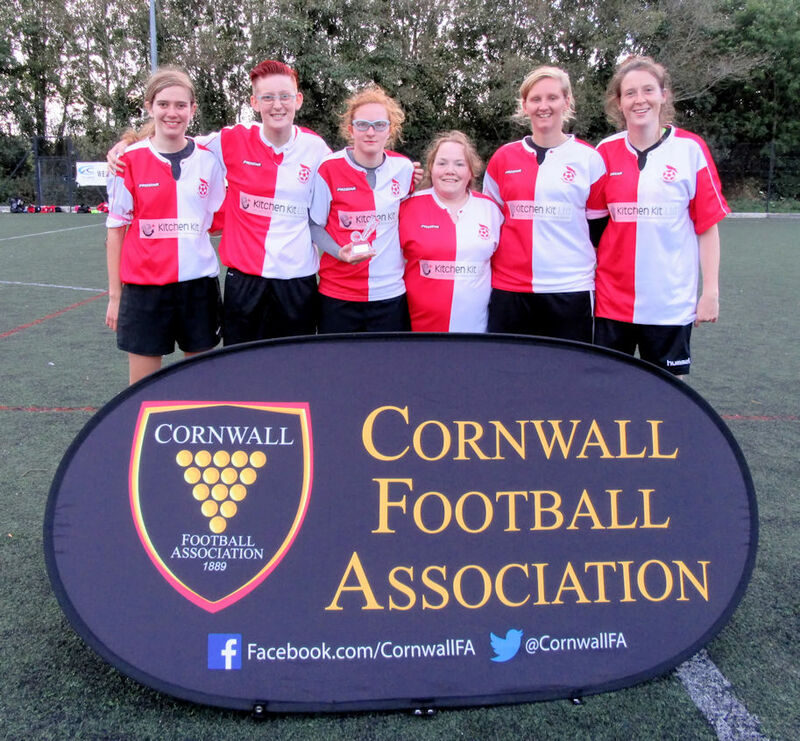 Any ladies aged 16 years and above interested in playing ladies football in Cornwall are welcome to contact CWFL secretary Denzil Lobb 01872 552091 or email d.lobb48@btinternet.com who will signpost you to the nearest team. Members of St Agnes AFC Ladies took part in the Truro Cancer Research UK Race for Life raising almost £700 to help beat cancer! 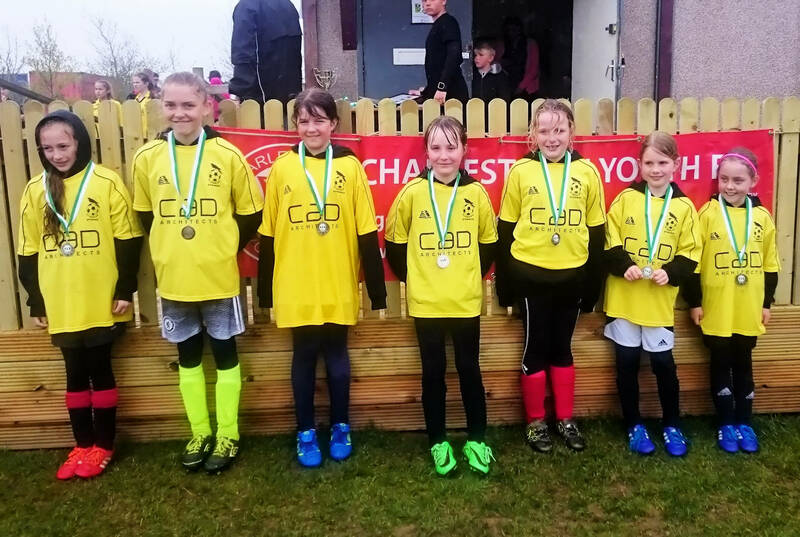 St Agnes AFC Dynamo Girls gave an amazing account of themselves at the Charlestown Tournament with the under 10's playing some amazing football and finishing runners-up in their group. 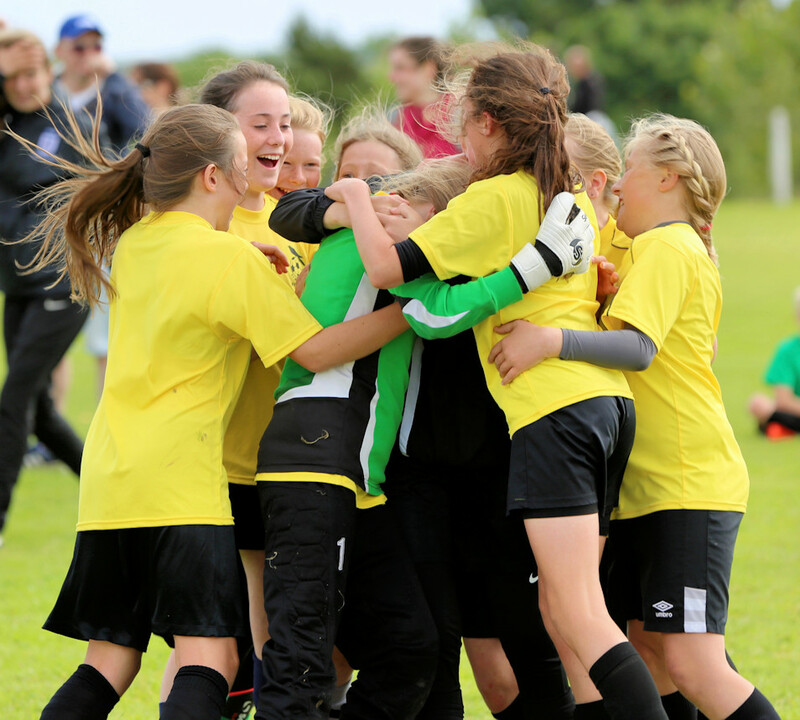 The under 12's reached the final in their group facing their nemesis Charlestown girls who had beaten them two weeks previously. This time however, with the score 0-0 after extra time, an exciting penalty shoot out followed with St Agnes Dynamos the winners bringing their first trophy home after their first season together. 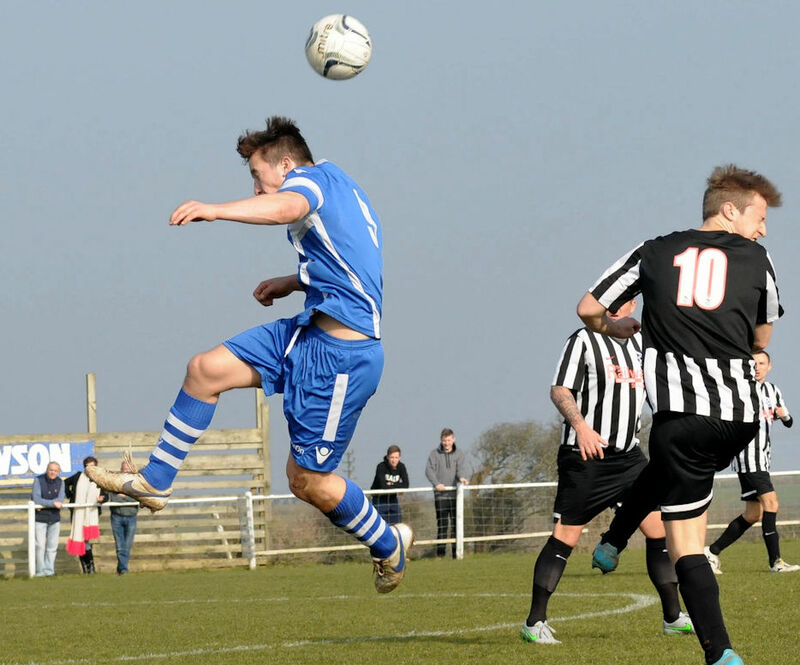 Photo’s courtesy of Chris Power. 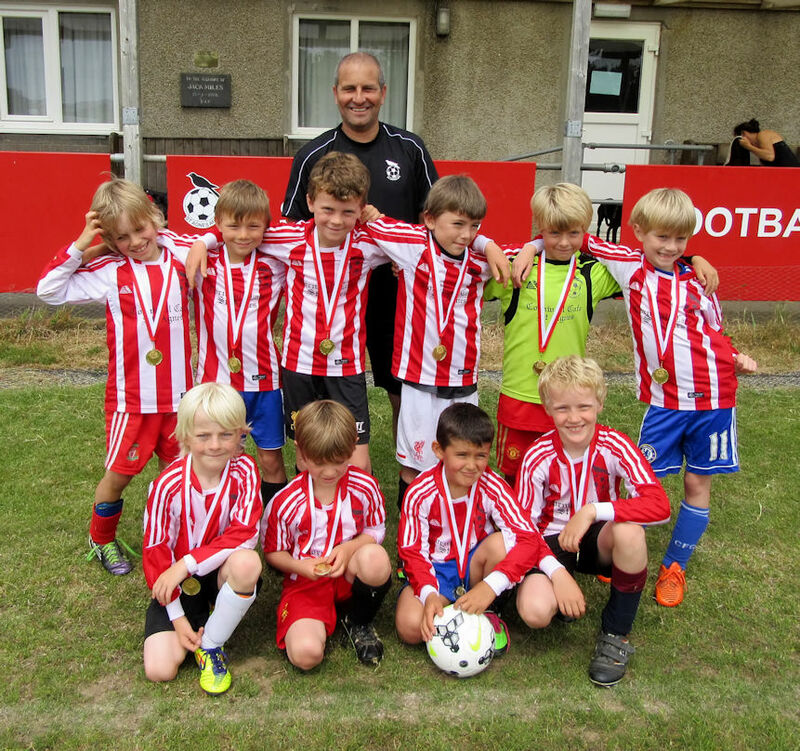 St Agnes AFC Under 8's and Under 10’s finished off the 2015/16 Season. 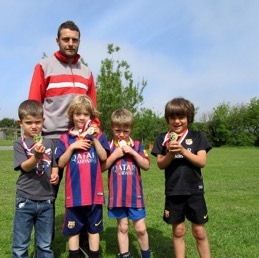 Members of the St Agnes AFC Under 8's team enjoyed their end of season kick about with refreshments before being congratulated by coach Paul Luke on a great season and presented with their medals. 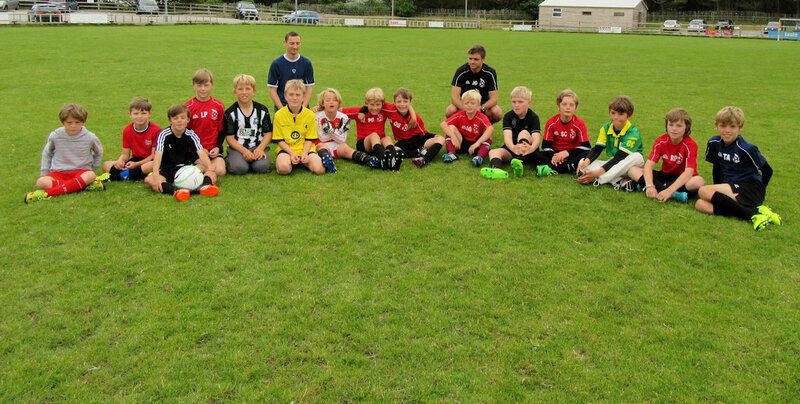 Members of St Agnes AFC Under 10's are pictured with their coaches Dan O’Toole and Jimmy Gazzard before their end of season kick about and presentations. 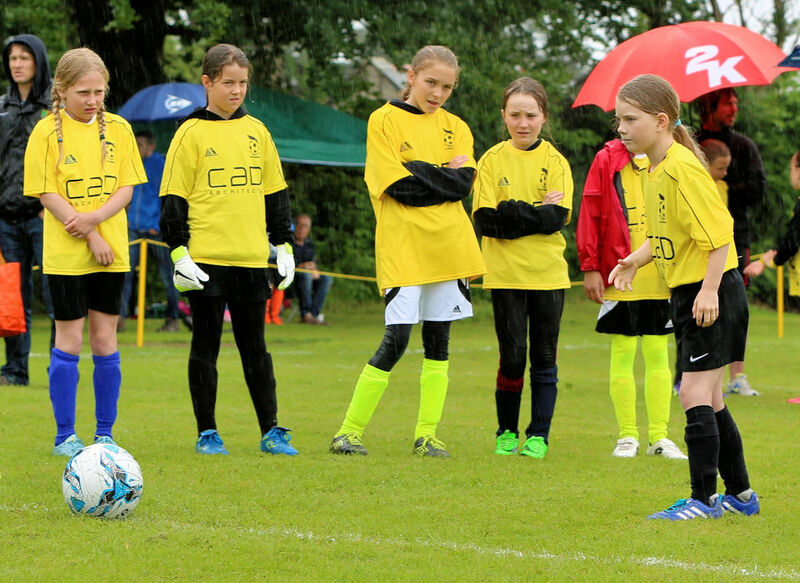 St Agnes AFC Dynamos sent a squad of Under 10's and 12's girls to the Bodmin Tournament with some amazing quality football being played in dreadful wet weather conditions. St Agnes AFC Dynamo Girls gave an amazing account of themselves at the Charlestown Tournament with the both age groups playing some amazing football and the Under 12’s finishing runners-up in their group. Training will resume in July. 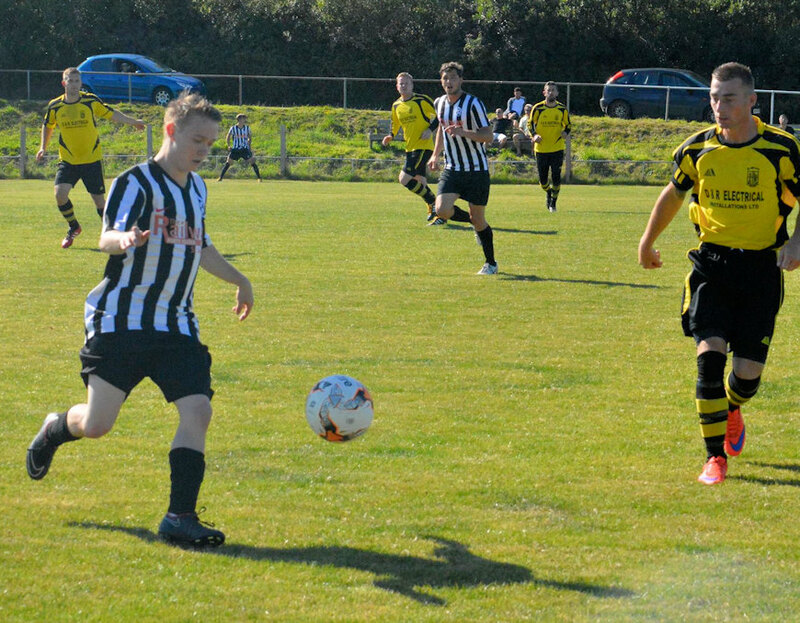 St Agnes AFC 3rd team finished their 2015/16 campaign with a draw, a 5 all thriller -v- Lizard at Chiverton Park. 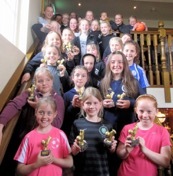 St Agnes AFC Dynamos Girls hosted their End of Season Awards with a slap up breakfast at The Green Parrot in Perranporth followed by speeches and awards. 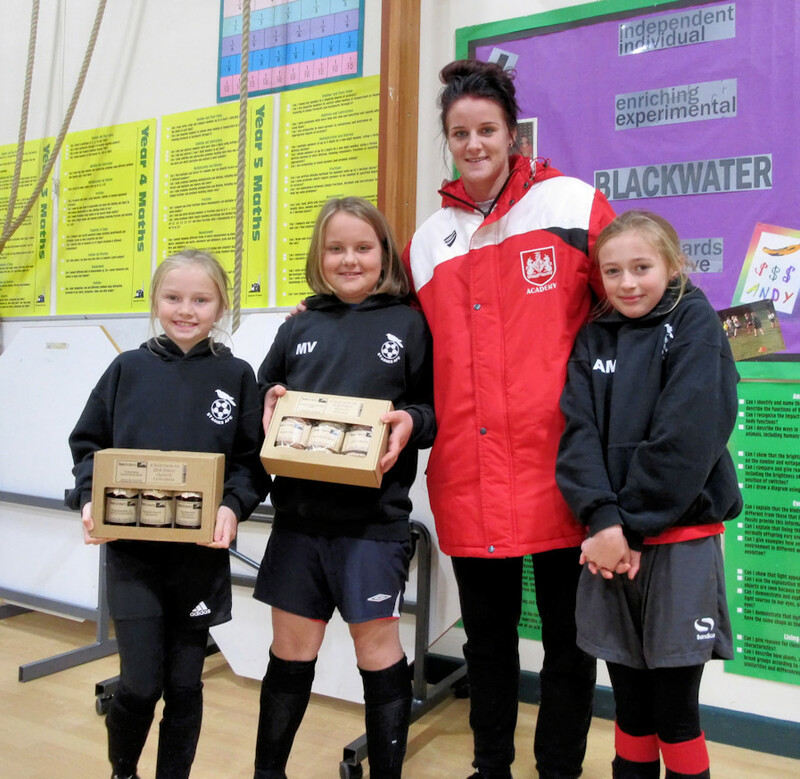 St Agnes Lady’s captain Julie Windram addressed the girls explaining how football had been important in her life helping make friends, play sport and feel like being part of a family. Coach Charlotte Collier gave an inspiring speech and showed the girls a video she had made of their trip to Wembley to see the Women's FA Cup. 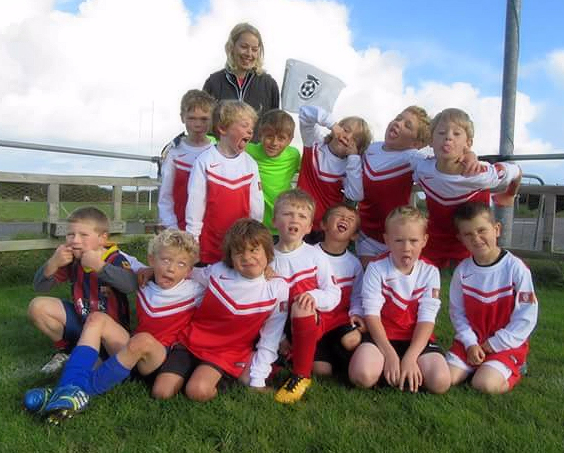 Coach Zoe Arundell-Lethbridge had prepared a video of the season including pictures of special occasions, fixtures, training sessions, coffee morning, water fight football and more. 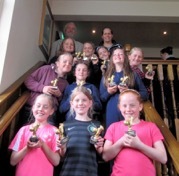 Club President Ian Doble then assisted with the awards for the Dynamos first season with recipients including Millie (under 12's) for being a great role model, Faith (under 12's) for confidence and commitment, Lucie (under 10's) most improved and Joanna (under 10's) for her energy and enthusiasm! 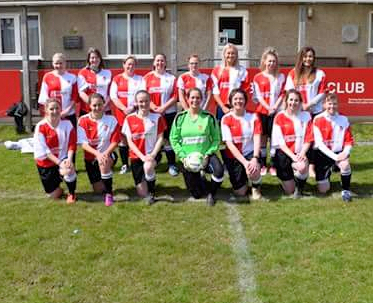 Summing up the season Club Chair Mandy Kimmins said "What a fantastic season, the girls have been inspiring throughout and achieved so much both on and off the pitch. 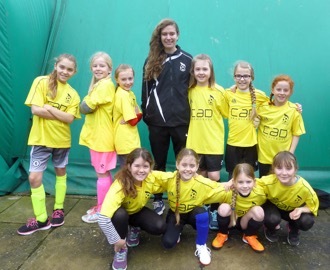 Congratulations also to Charlotte as their coach who has grown and developed massively in confidence and ability." 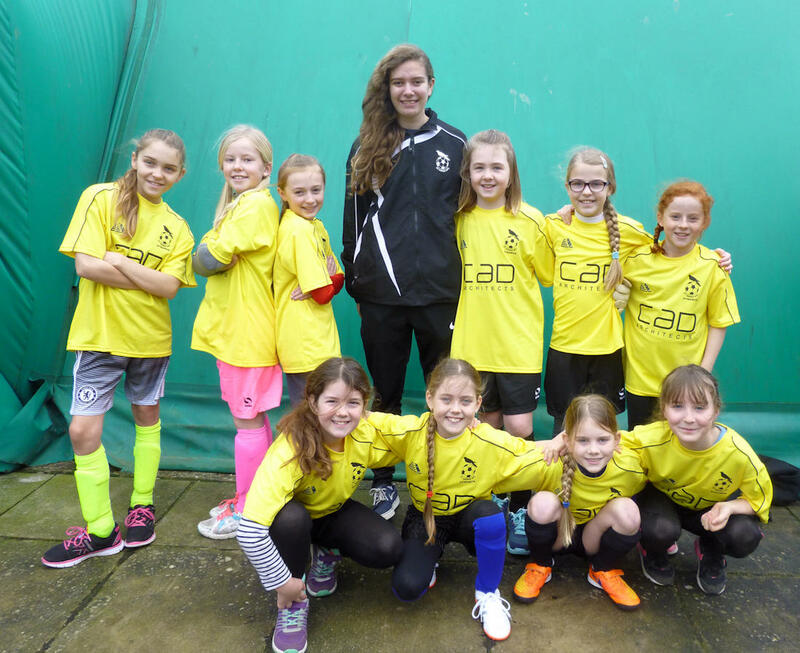 The girls were asked to feedback anonymously what the season had meant to them: "I have experienced new ways of playing football (futsal). Going to Wembley was the highlight of my year." 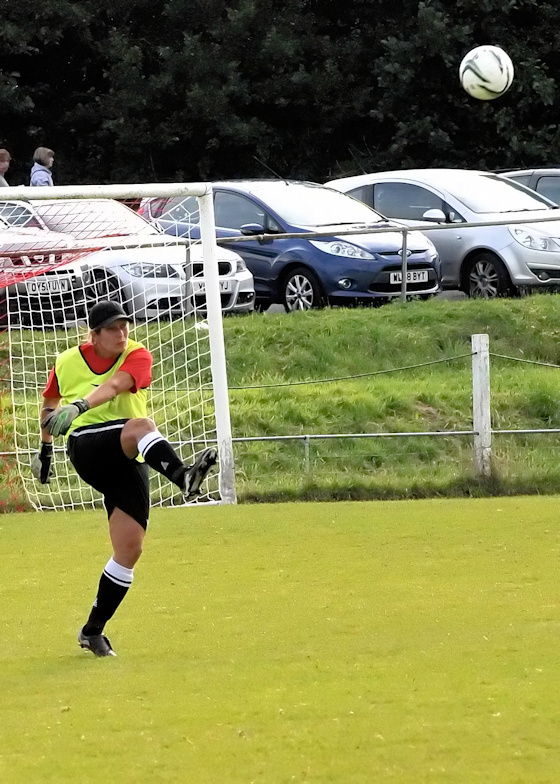 "I have really enjoyed football and it has given me a lot of my confidence back. I felt like part of a family again as i met up with old friends and made new ones." "This is a club that I will love all my life. 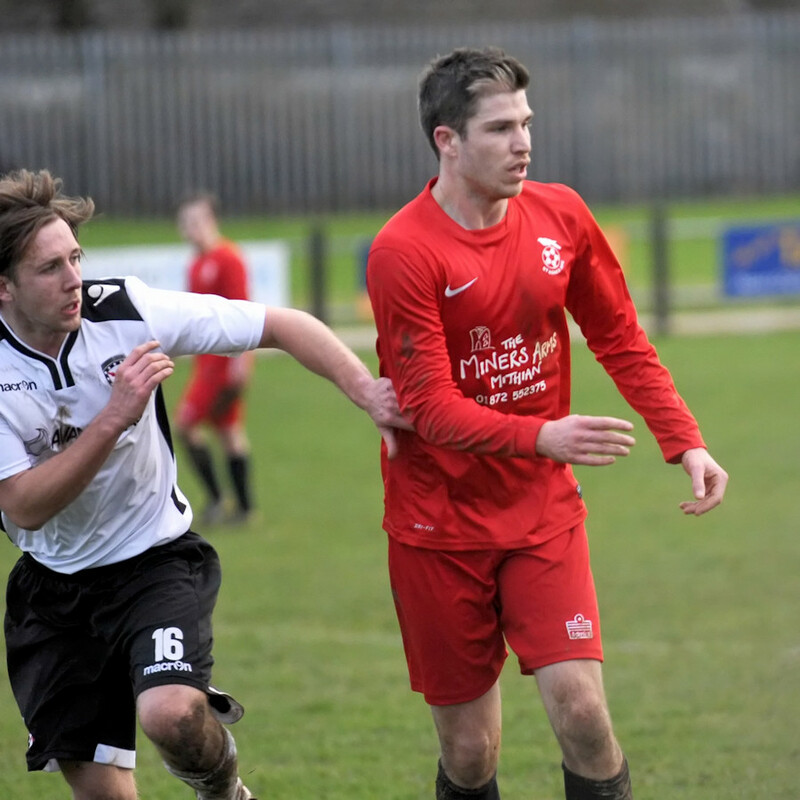 I want to be a professional footballer." 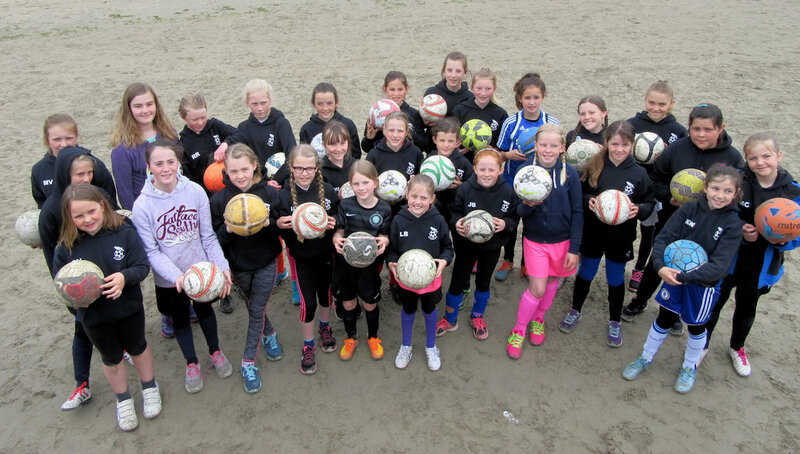 St Agnes AFC Dynamos Girls decided to have a sponsored Beach Dribble at Perranporth beach at the weekend as a way of finishing their first season. 29 very excited girls took part on a mizzley wet morning having huge fun dribbling their balls to the tide line and back followed by beach soccer in the rain! 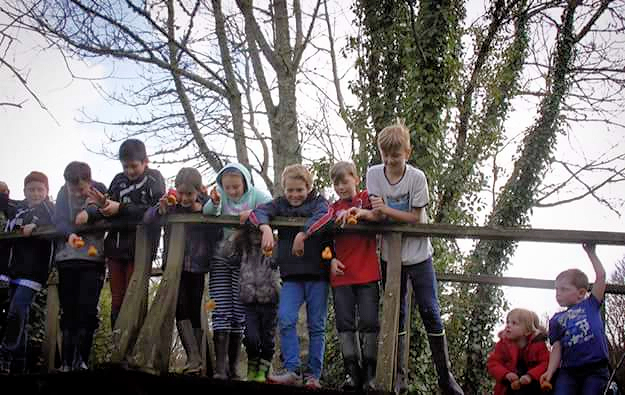 To ensure they were completely soaked some ended up paddling in the sea and the river. 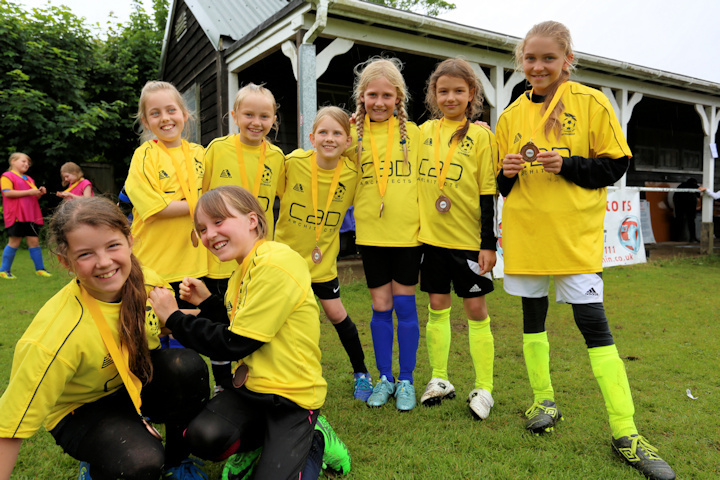 The event raised a whopping £500 with the monies being split between charities Sport Relief and the Awutu-Winton School in Ghana supporting football in an underprivileged area. 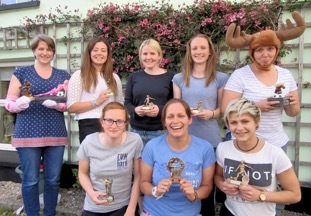 Rachel Blackham Loyalty Award and Maid of the Season, Best Newcomer Natalie Tonkin, Managers Player Amy Brooks, Most Improved Helen Jones, Moose of Season Laura Hockett (collected by Kirsty Dilley in her absence). 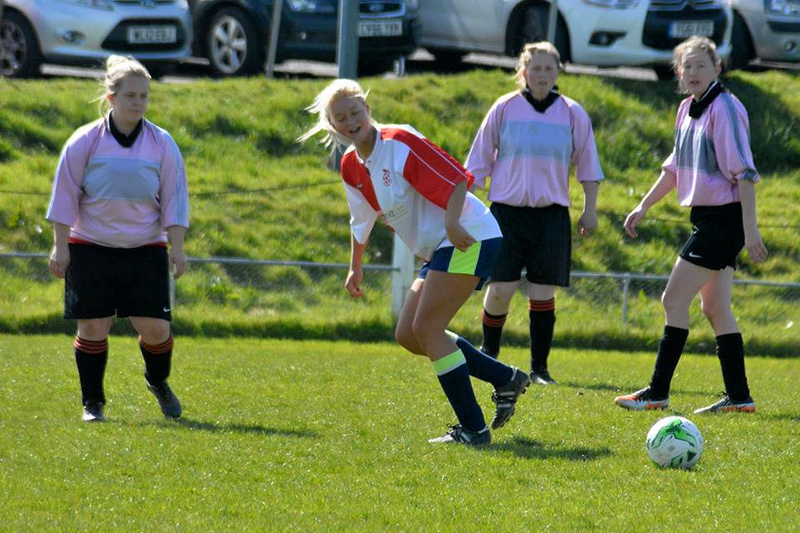 Front L-R Top Goalscorer Zoe Arundell-Lethbridge, Coaches Player Julie Windram, Players Player Lexi Riley. 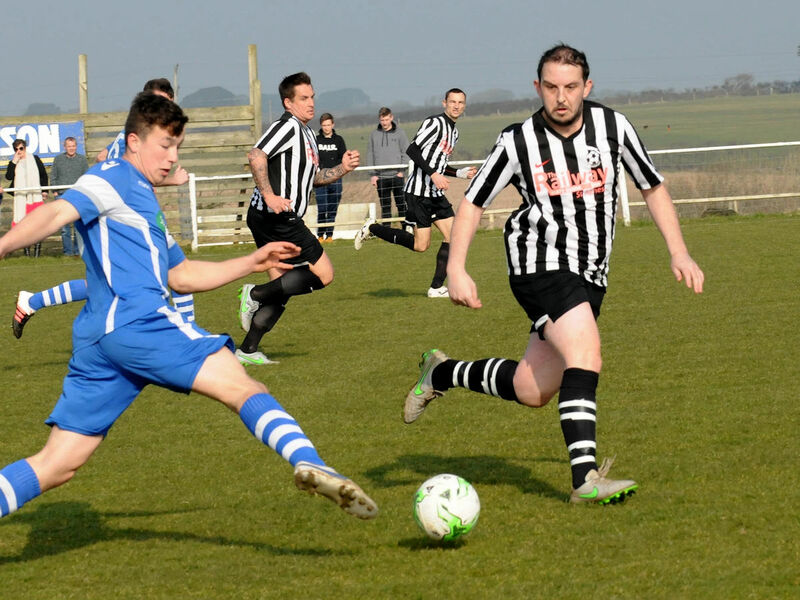 The St Agnes AFC Bolster Veterans went into the final held at St Dennis on Sunday as the underdogs with their opposition Downderry Rovers having beaten them previously and being unbeaten in 12 matches! 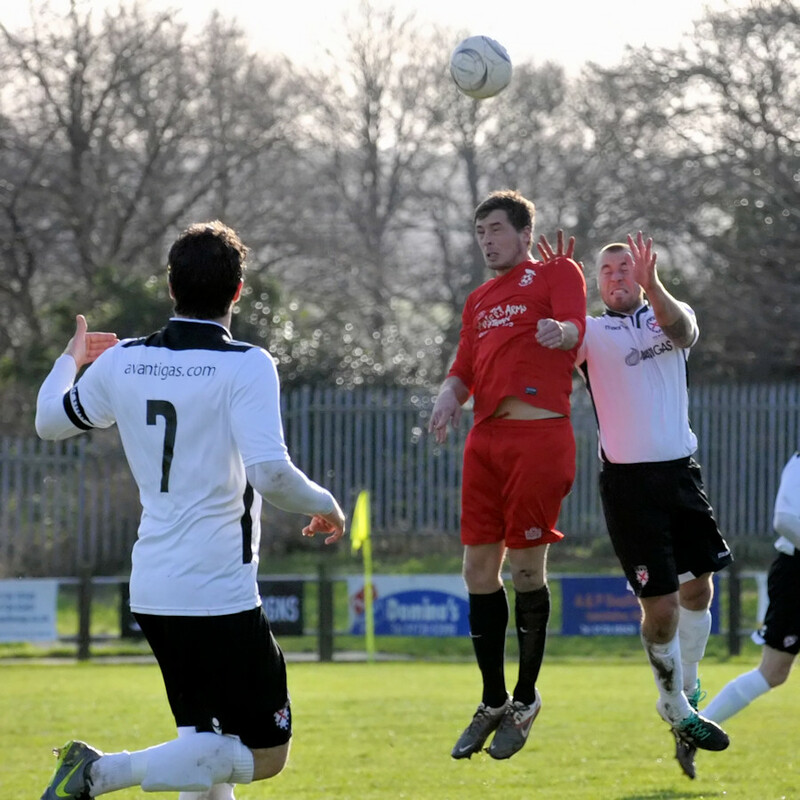 The Bolsters took Downderry by surprise as they started the match playing five in midfield, with lone striker Colin Kettle up front, and dominated the opening ten minutes. 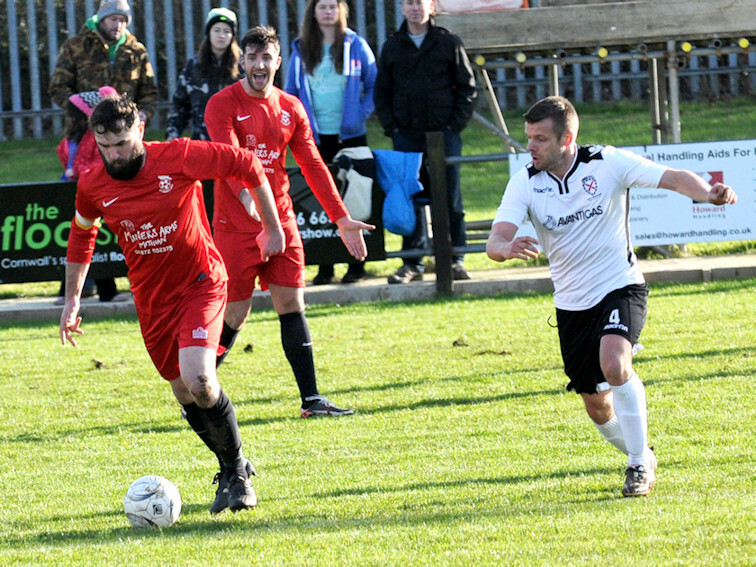 Twenty minutes in saw the Bolsters take the lead with a fine run down the right by Dan O’Toole who crossed the ball into the box for Dave Turner to score. 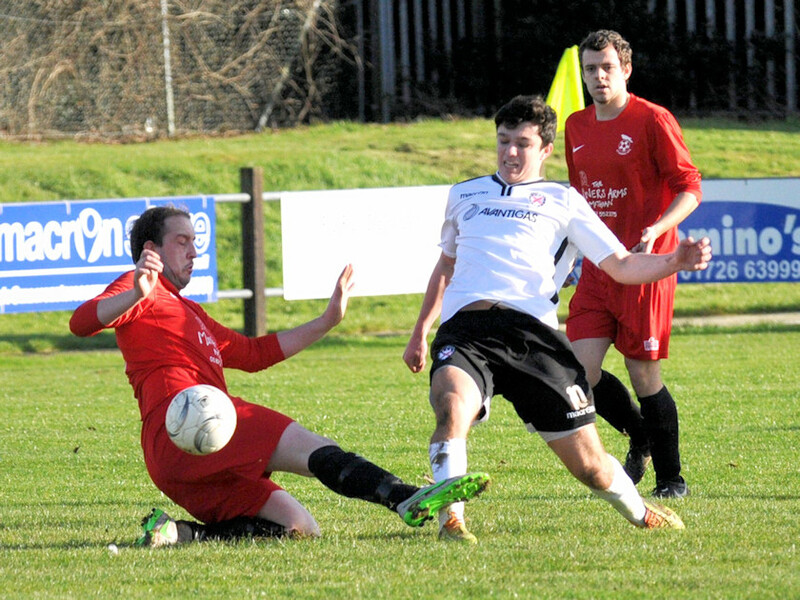 Downderry came back into the game without really threatening the St Agnes goal. 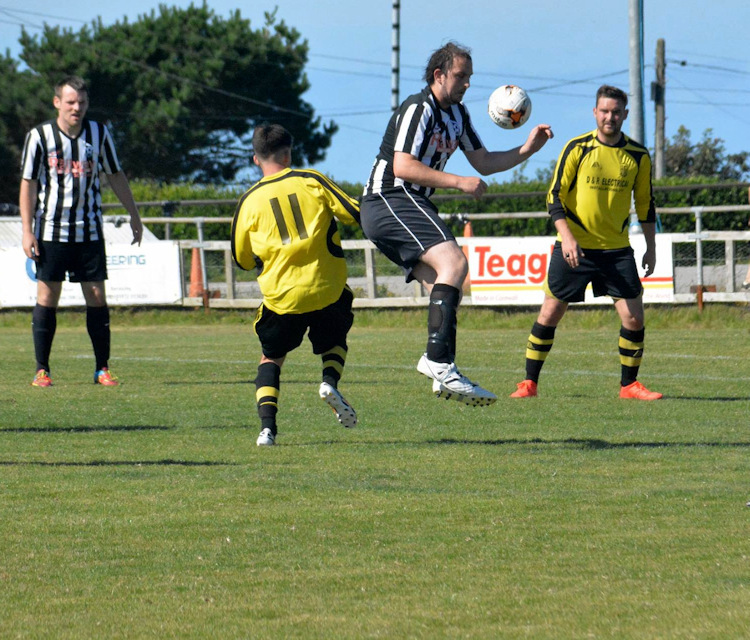 Again Dan O’Toole caused havoc down the right putting in another dangerous cross, which lead to a Downderry handball in the box. 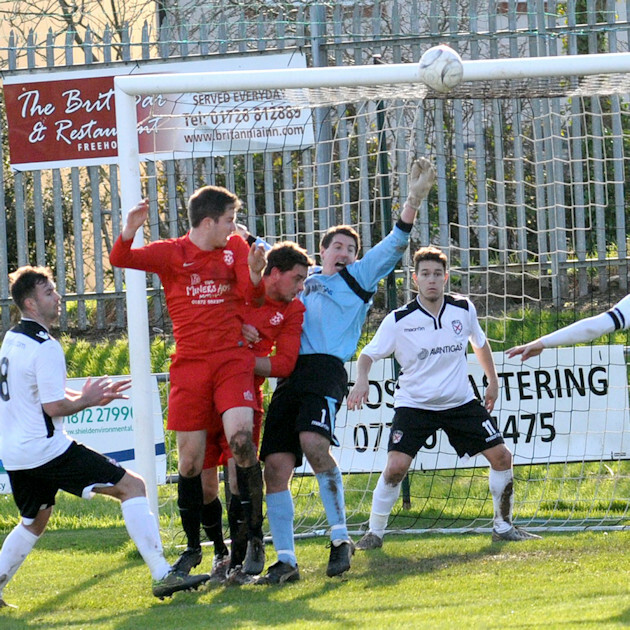 Justin Miles made no mistake as he blasted the resultant penalty into the net to give a 2-0 lead at half time. 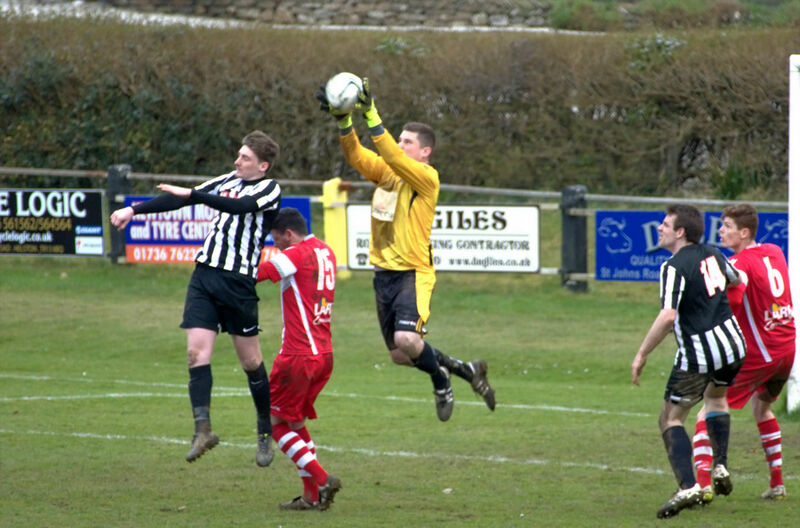 The second half saw Downderry come back at The Bolsters forcing Mark Norgate to pull off some crucial saves. 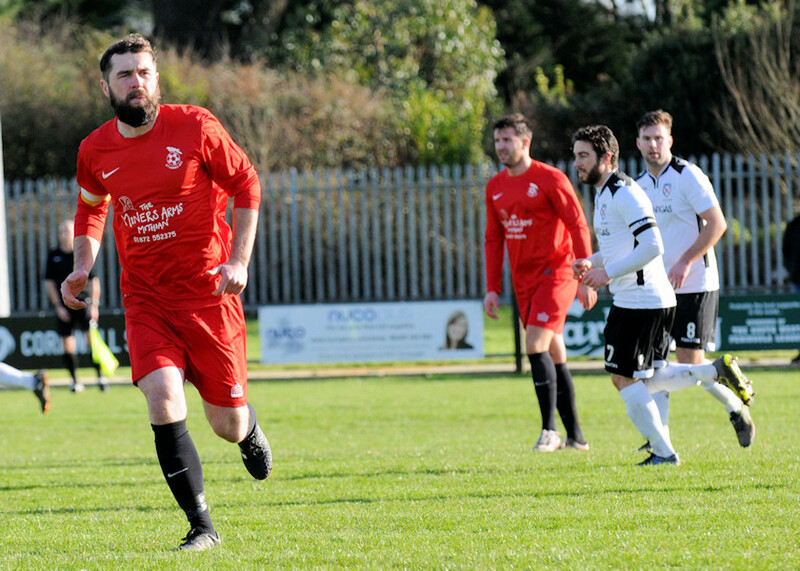 The Bolsters caught Downderry on the break with Trevor Whisker slotting the 3rd goal home to end the scoring fifteen minutes from the end of the match. 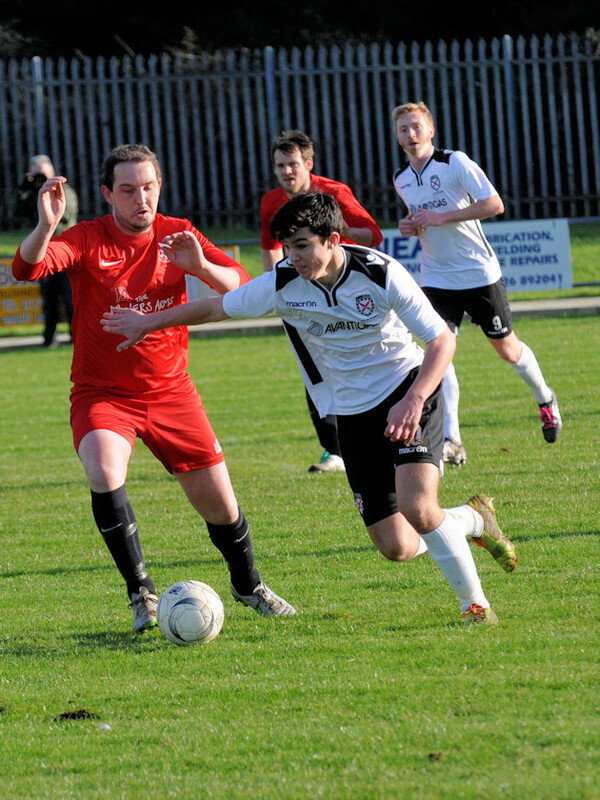 From then on the St Agnes veterans played a fine possession game keeping Downderry at bay and ran out deserved winners. 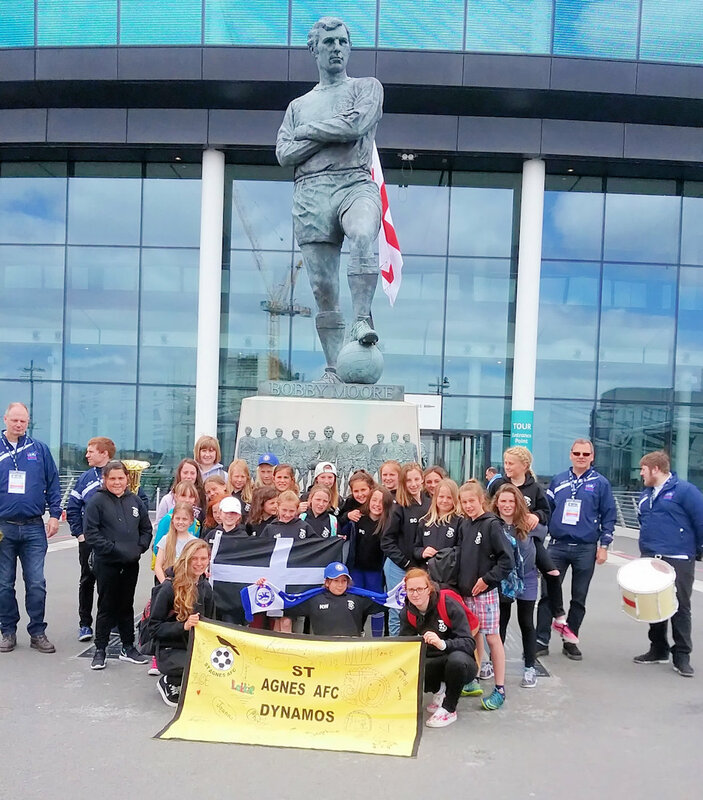 St Agnes AFC Dynamos Girls had an amazing trip to the Women's FA Cup Final at Wembley on Saturday 14th May. 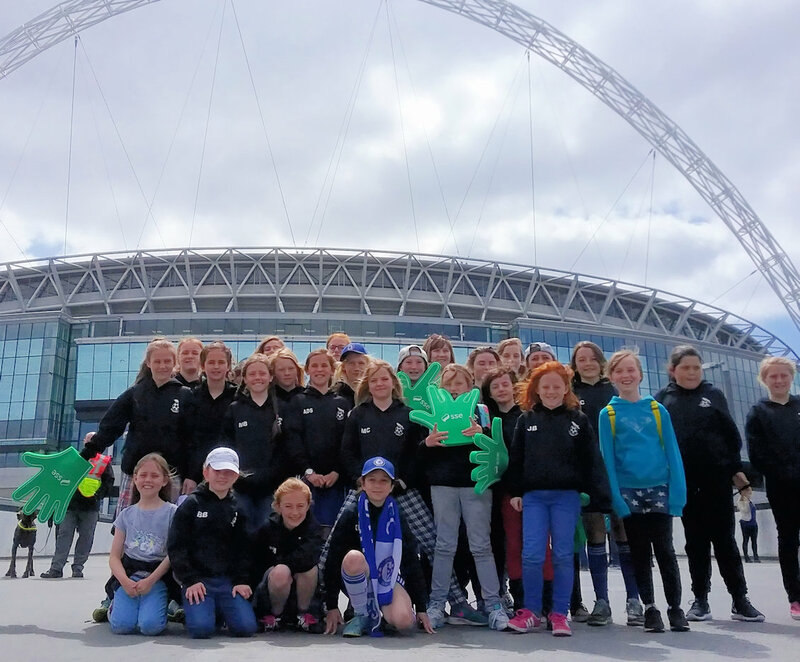 Taking advantage of the fantastic offers for group bookings, 48 excited Dynamo players with their coaches and parents made the early start for their bus trip to Wembley. Taking time to explore and pose for photos at the Bobby Moore statue the girls had an experience to remember as part of a record Women's FA Cup crowd of over 32,000 watching Arsenal Ladies beat Chelsea Ladies 1-0. As one of the youngest on the trip 9 year old Lucie, who had been too excited to sleep the night before, said, "I had a really great day!”. 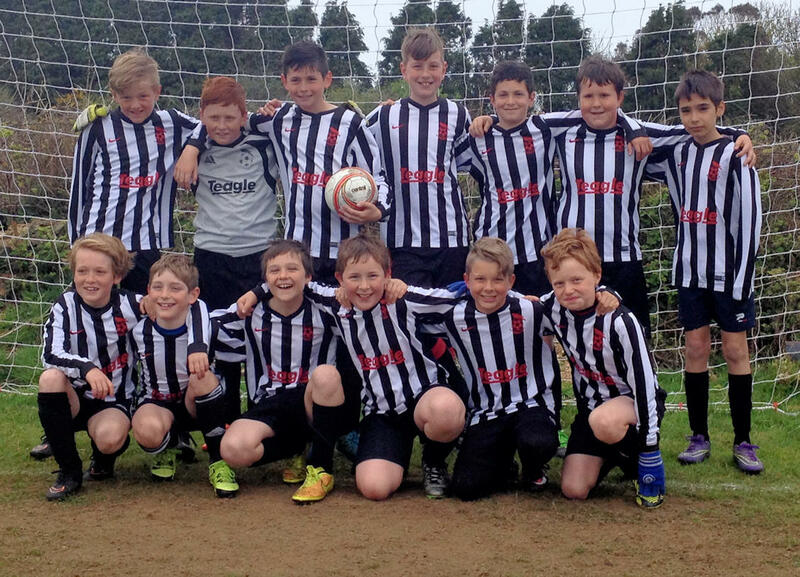 St Agnes AFC Under 11's (photographed) ended their 2015/16 Season on a high with a 4-1 win against Illogan. 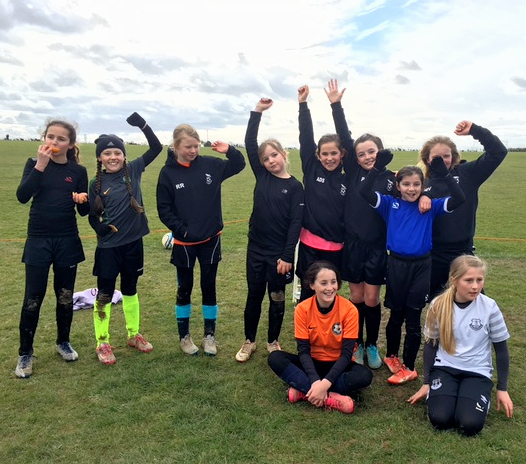 The Dynamos attended the CGFL end of season event at Charlestown on Sunday 1st May and had a fantastic time playing some brilliant football in the rain! 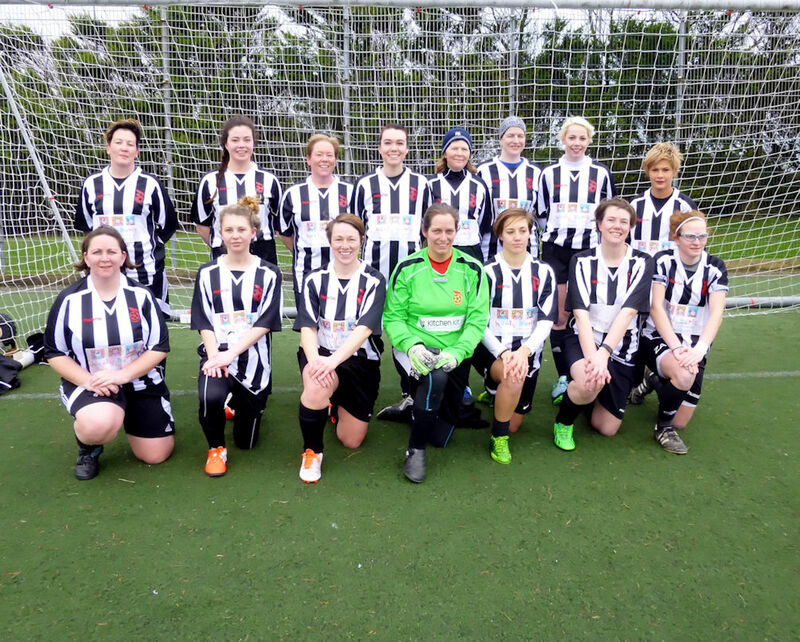 St Agnes AFC Ladies finished their 2015/16 Season on a high with a solid 8-0 win at home against a determined, battling St Breward side. 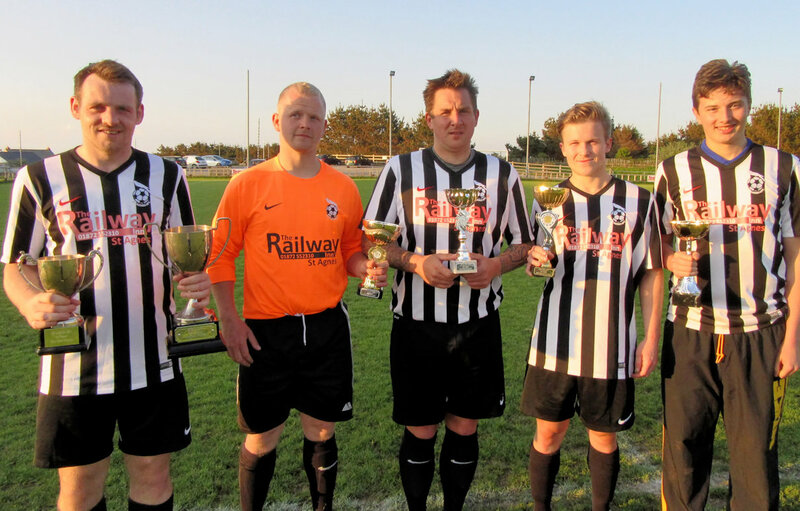 Having struggled to even start the season with eight players retiring at the end of the previous season and numbers very low, the squad has recruited and expanded to find themselves in Runners-up position in the league at the end of their fixtures! 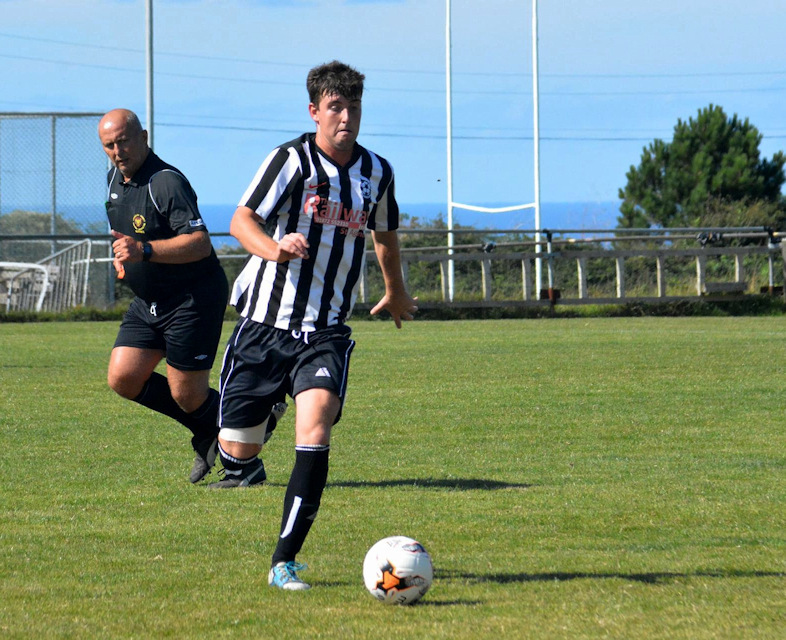 With other teams still having games in hand and points to play for St Agnes are unlikely to retain that spot, but have had a really positive campaign this year after a wobbly start. The ladies will hold their end of season event at Chiverton Park pitch with a ‘round robin’ against new sides for next season, Wadebridge and Liskeard, on the 22nd May and a slap up roast and team presentations at the Chiverton Arms pub afterwards. 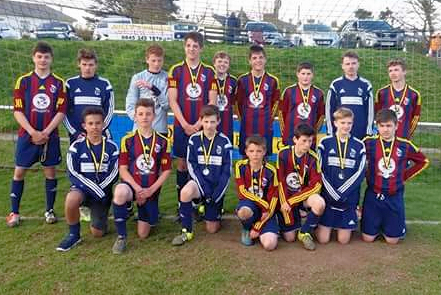 St Agnes AFC Under 14's under the management of Barry Taylor gave a tremendous performance playing Truro in the CCFA County Cup Final played at St Day on Sunday. 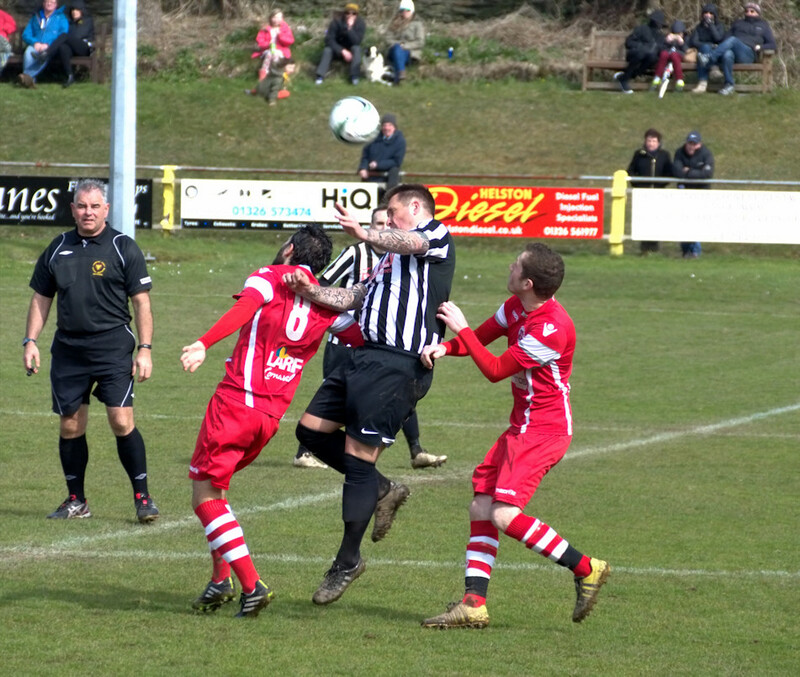 With the score 0-0 after ordinary time and after extra time the teams faced a penalty shoot out with Truro running out the winners. 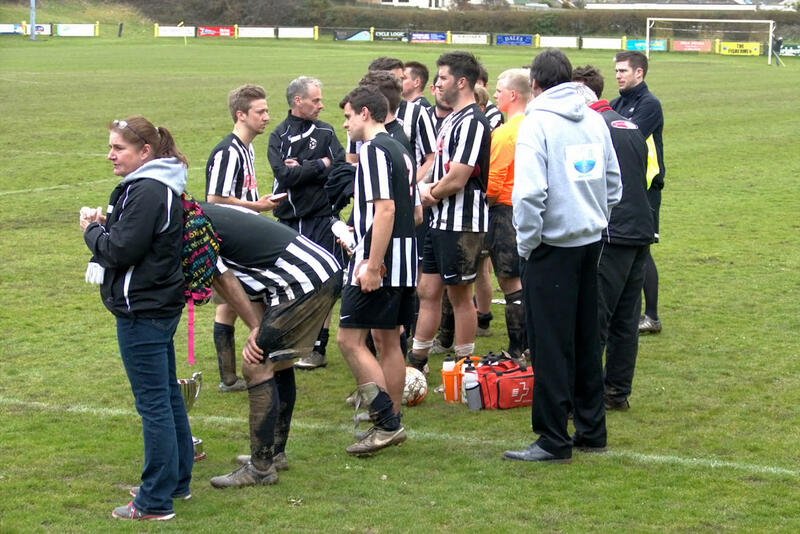 A fantastic effort by the St Agnes team: it’s never an easy way to end a final on penalties. 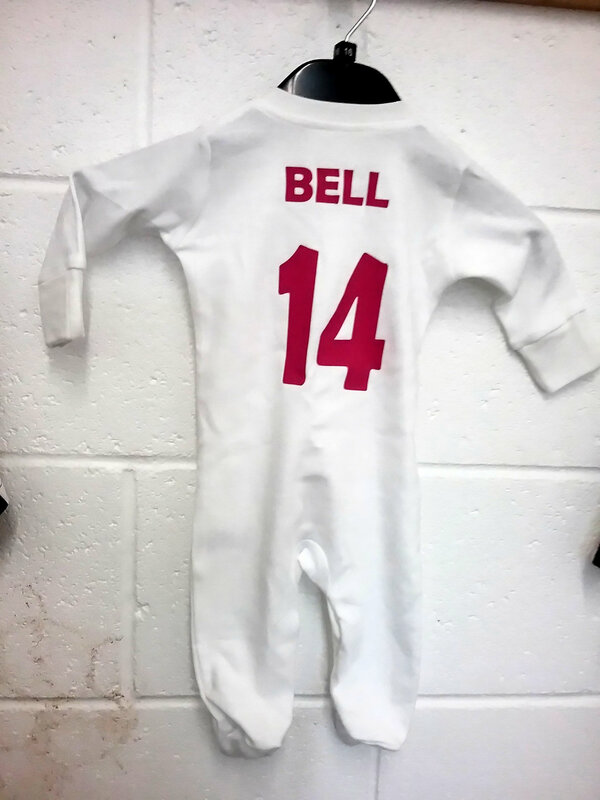 Congratulations to Mark & Kelly Bell on the birth of baby Elodie-Bea! 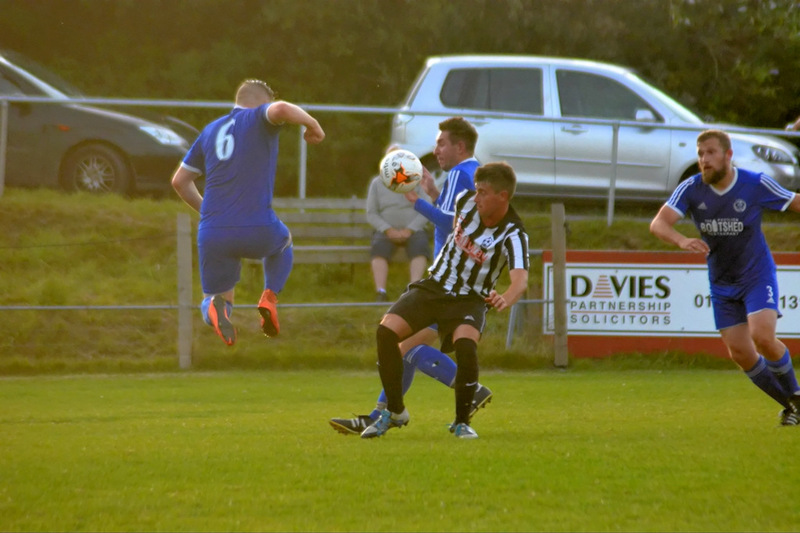 There were almost perfect conditions for this semi-final encounter between St Agnes Bolster vets and Packhorse vets at Enys parc. 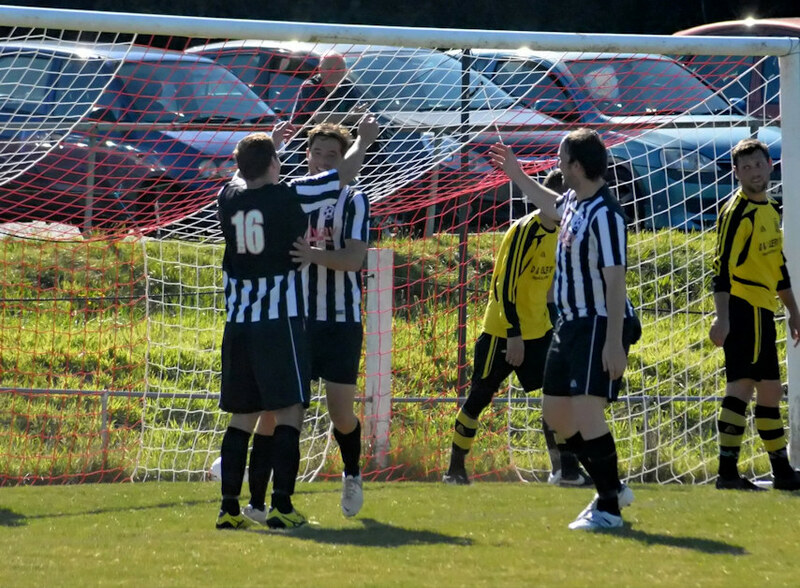 The Bolsters were quick to take control of this match knowing the reward would be a place in the final! 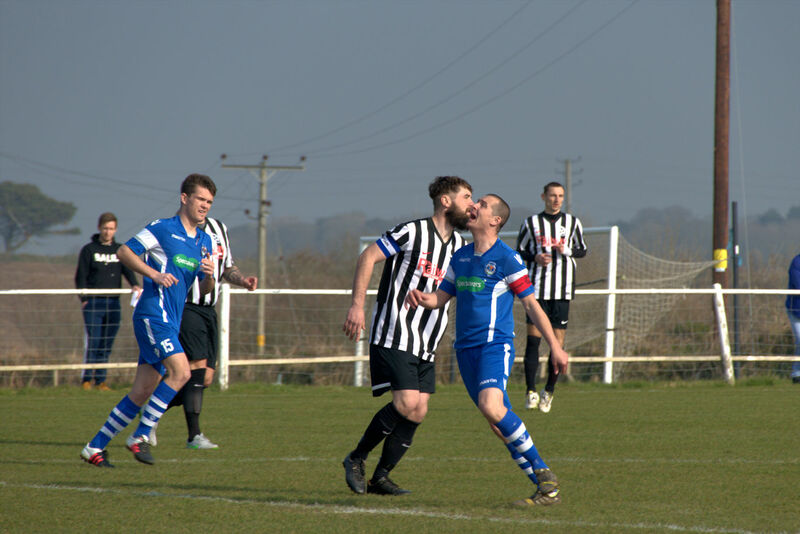 10 minutes into the game and Trevor Wisker put the Bolsters in front, but this was short lived as four minutes later that man looking for 2000 goals Mark Rapsey popped up and pulled Packhorse level. 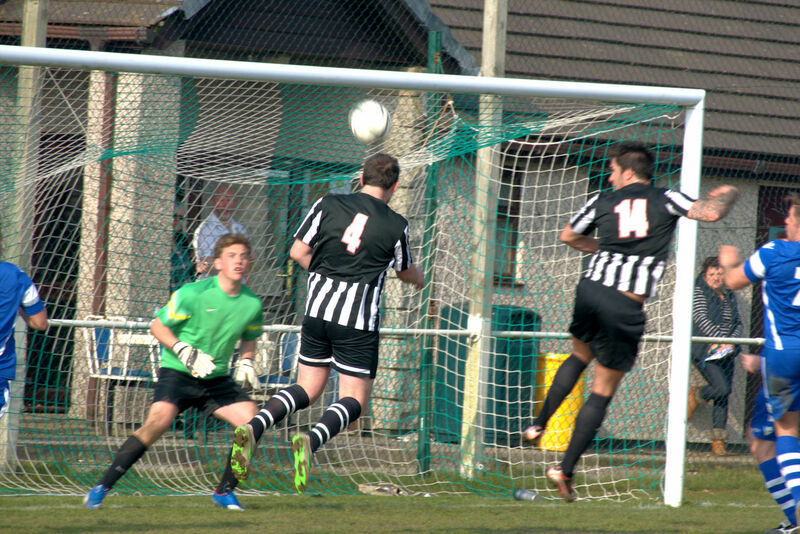 The Bolsters were in good form and three minutes later scored again this time Dan O’Toole slotting home. 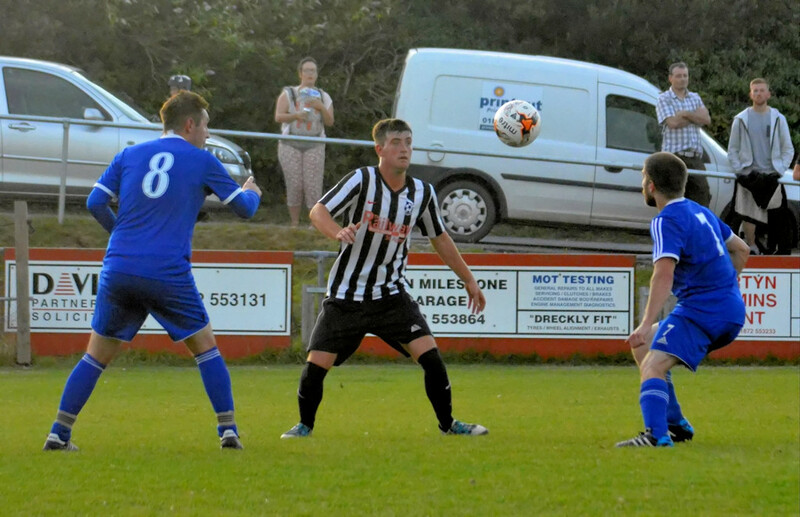 Six minutes later another by Trevor Wisker and, before Packhorse could settle, a minute later Trevor Wisker had his hat trick. 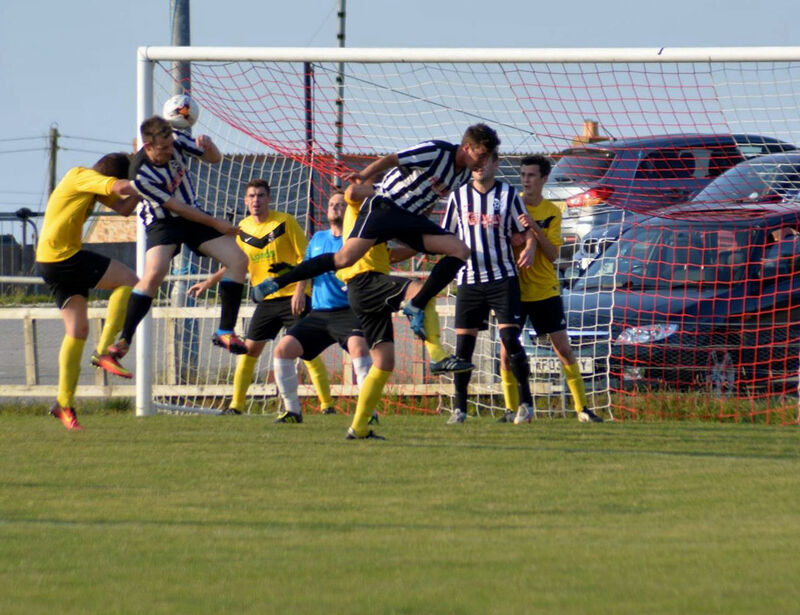 Packhorse were not going out of this cup match without a fight and four minutes later were awarded a soft penalty only for that man Rapsey to slot home. 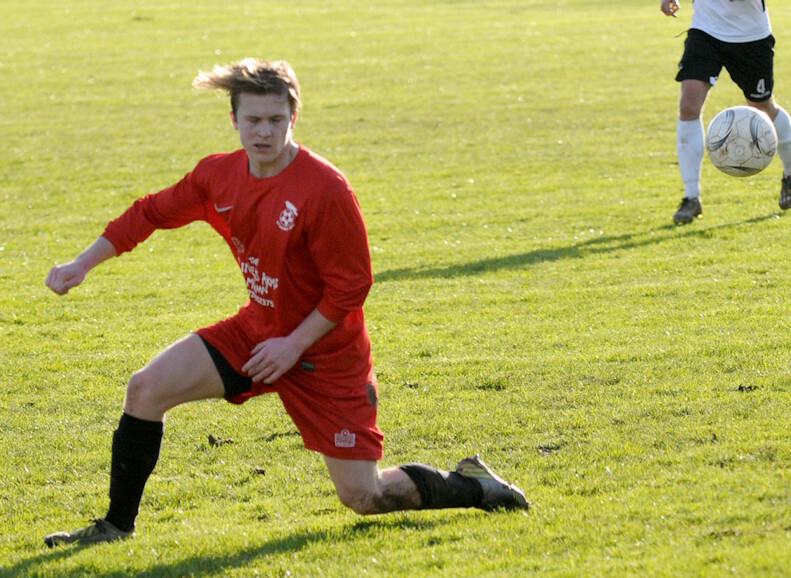 Half time 4-2 to the Bolsters. 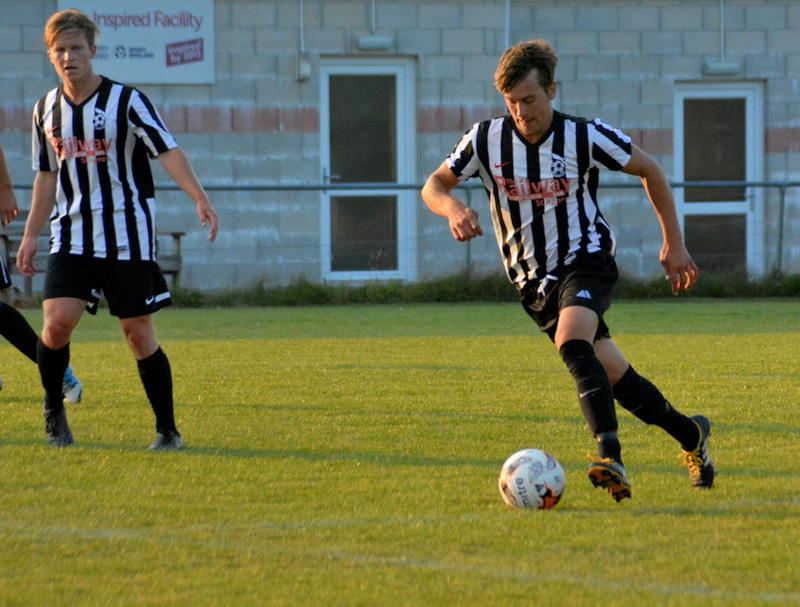 The second half started of pretty much as the first half and with only two minutes on the clock Trevor Wisker was back on the scoresheet Now at 5-2 the Bolsters seemed to be in control. 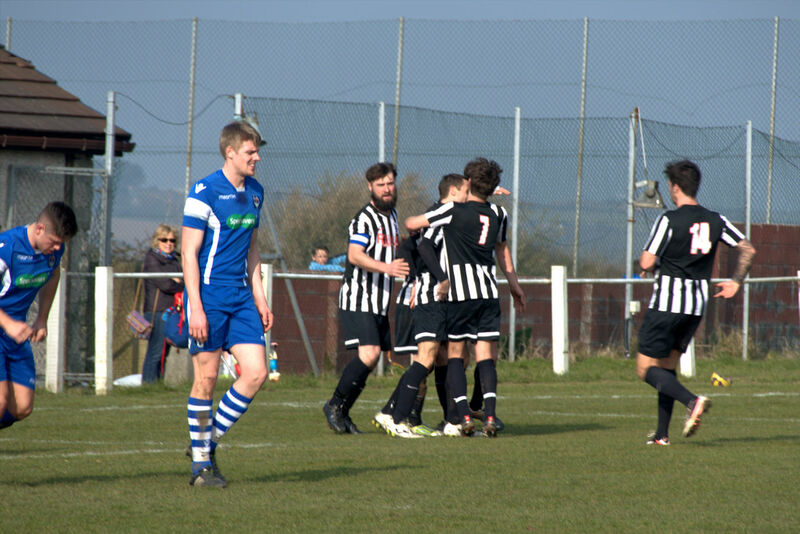 Packhorse changed formation to try to get back into the game, but just past the half hour mark Dan O’Toole scored his second of the day. 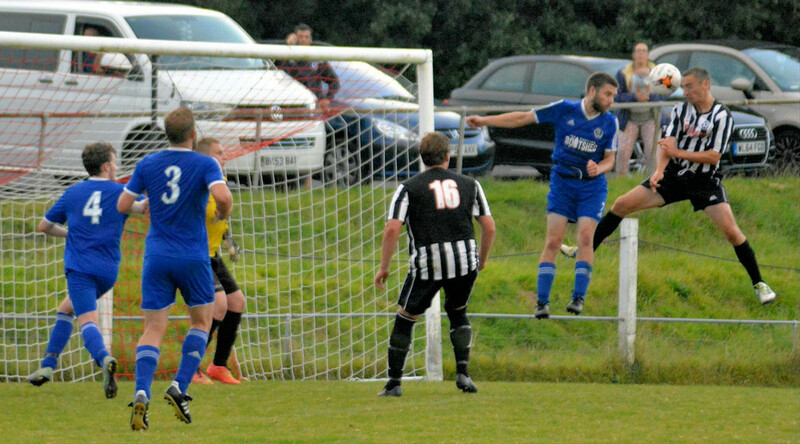 With time running out Packhorse were pushing on but couldn’t break down the Aggie resilience and with the last touch of the ball another Aggie attack ended with a goal, this time by Rupert Arch. The final score Aggie Bolsters 7-2 Packhorse. 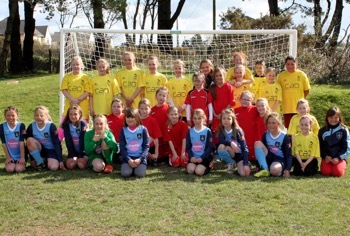 St Agnes AFC Dynamos Under 12's are photographed with Penzance girls before their CGFL fixture with St Agnes winning 4-2. 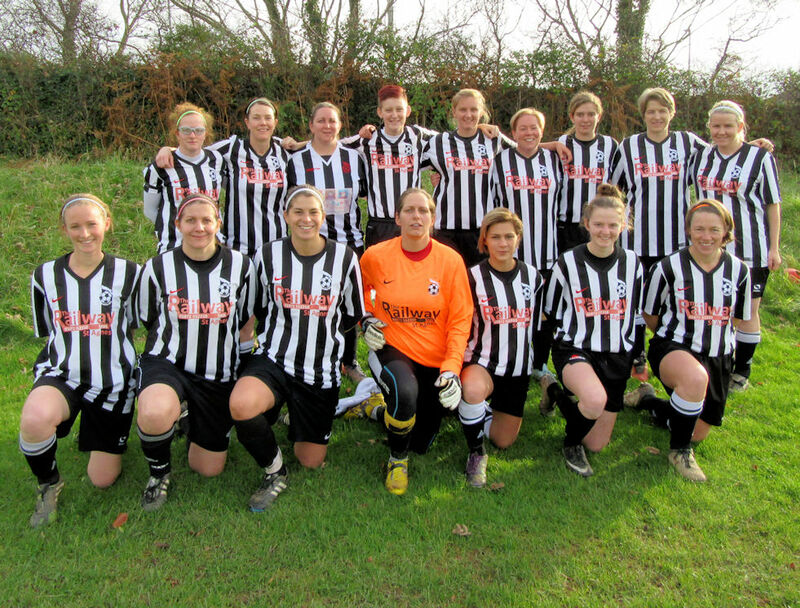 Any girls interested in joining the St Agnes AFC Dynamos are welcome to contact Mandy Kimmins on 07974 370666. 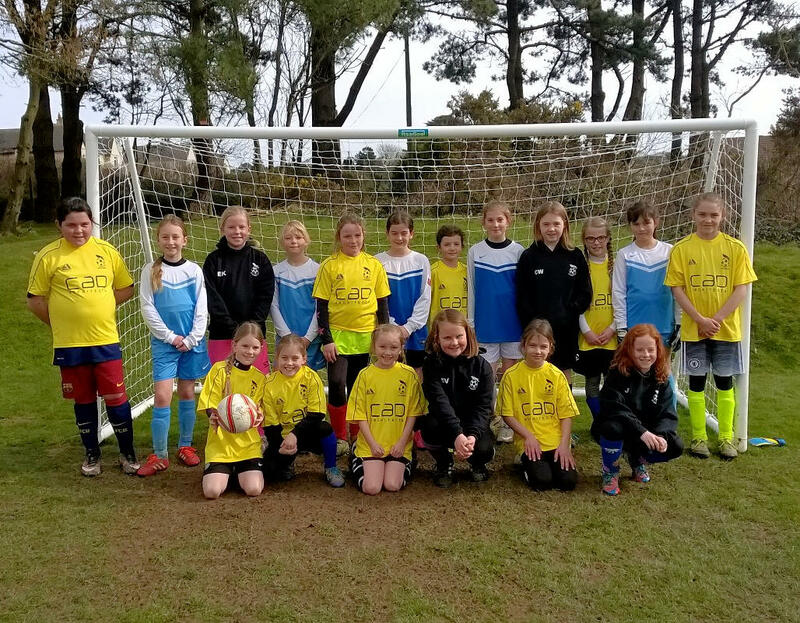 A feast of fantastic Under 10's girls football took place as St Agnes AFC Dynamos hosted Newquay and Culdrose girls in a round-robin event. 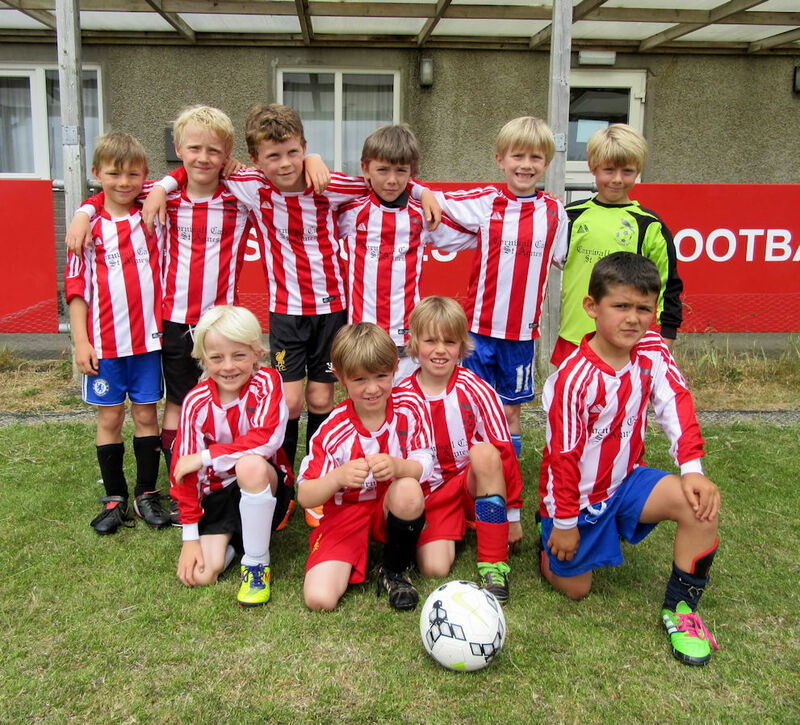 With St Agnes fielding two teams the four sides played three matches each, their smiles showing how much they all enjoyed themselves. 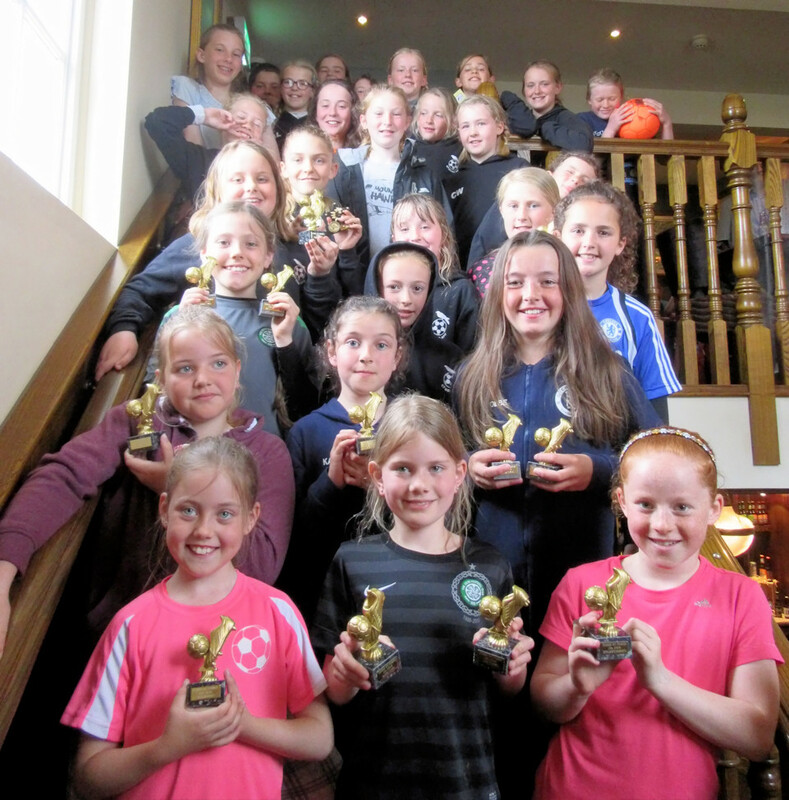 Any girls interested in joining the St Agnes AFC Dynamos are welcome to contact Mandy Kimmins on 07974 370666. It was touch and go if this game would go ahead, but luckily the game got under way. 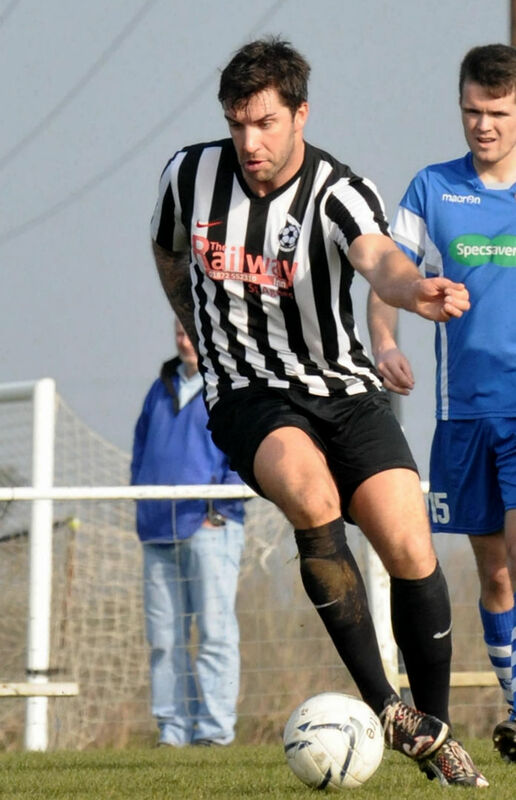 The pitch was pretty wet and the wind pretty gusty with both teams struggling to control the ball and neither side getting too many clear cut chances, but a shot by Dave Turner just managed to creep over the line to put Aggie Bolsters 1-0 up after 5 minutes. 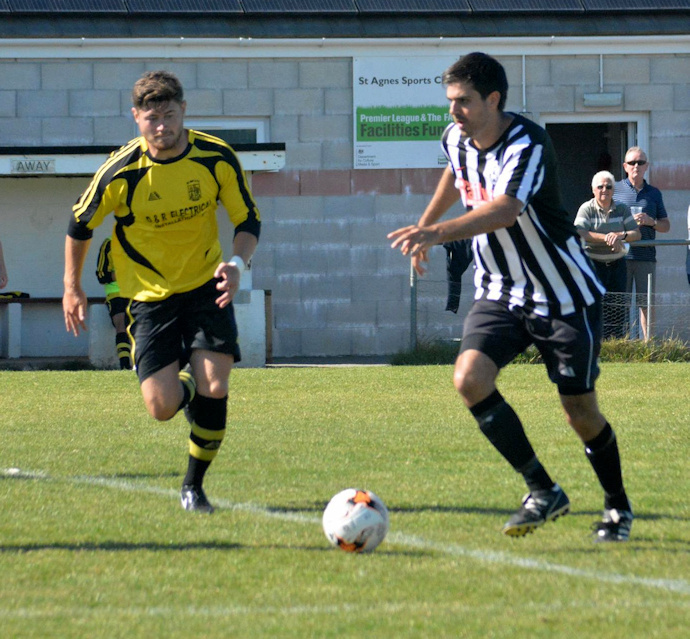 However, they only managed to hold the lead for 15 minutes when some poor defending saw Halsetown level the scores. 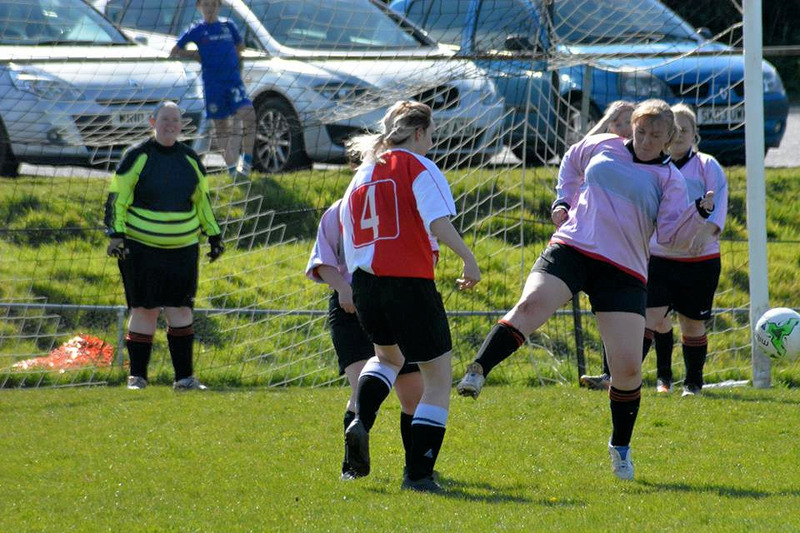 Both teams started to play some good football, but neither team could find the net, half time 1-1. 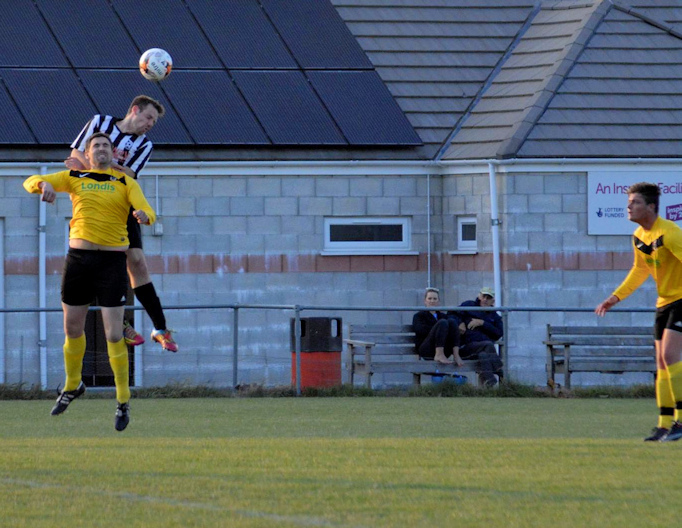 The second half started with Aggie on top and they had two or three good chances, but it was Halsetown who went into the lead 10 minutes into the second half. 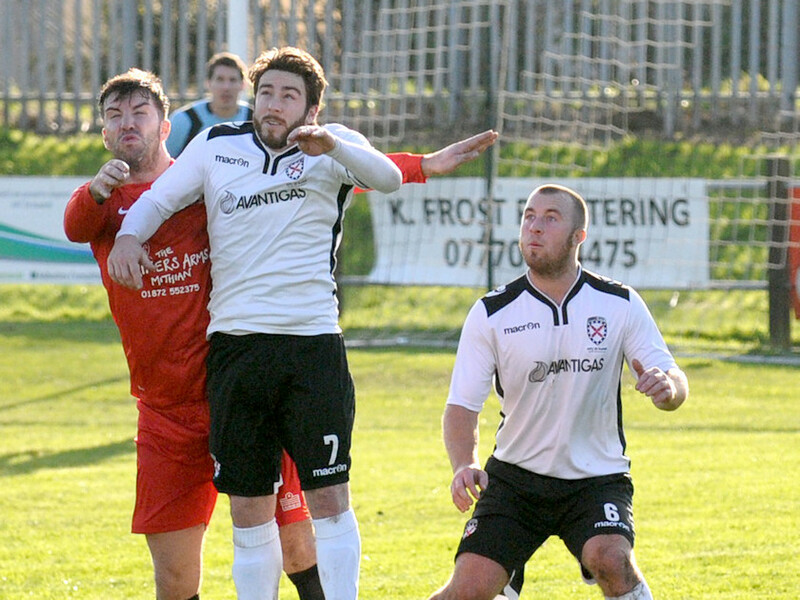 Aggie were pushing for the equaliser when the final whistle blew. 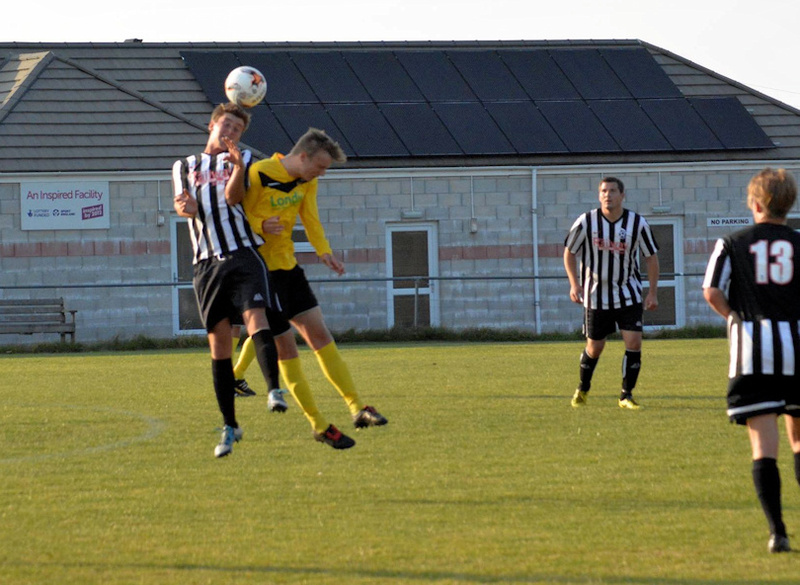 The game ended Halsetown 2-1 Aggie Bolsters. 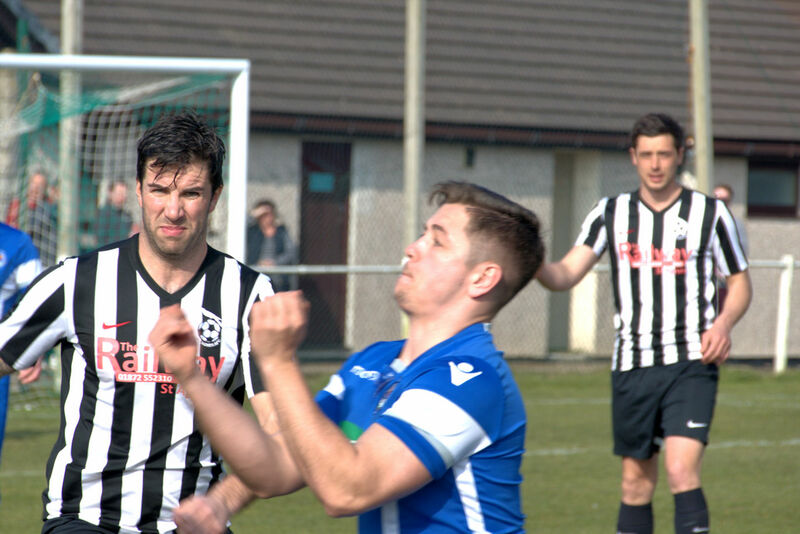 Better luck next week when we host Packhorse in the semi-final of the League Cup! 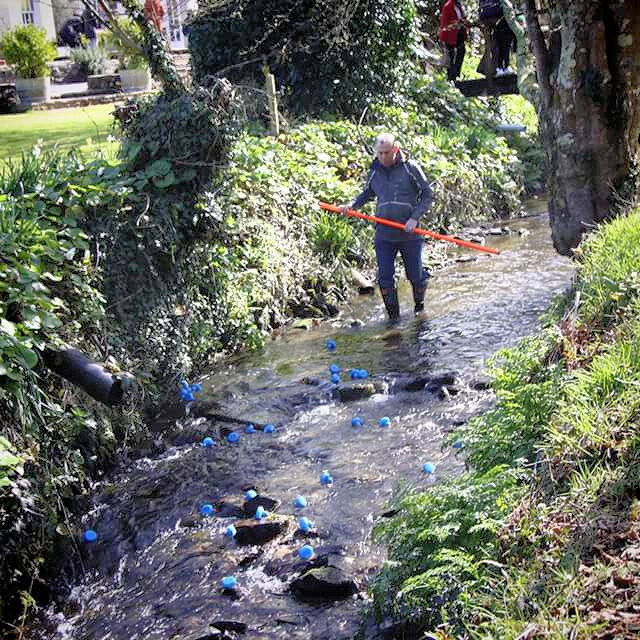 St Agnes AFC hosted the Annual Duck Race at the Rose in Vale, Mithian on Easter Sunday with a keen crowd of entrants of all ages eager to take part! 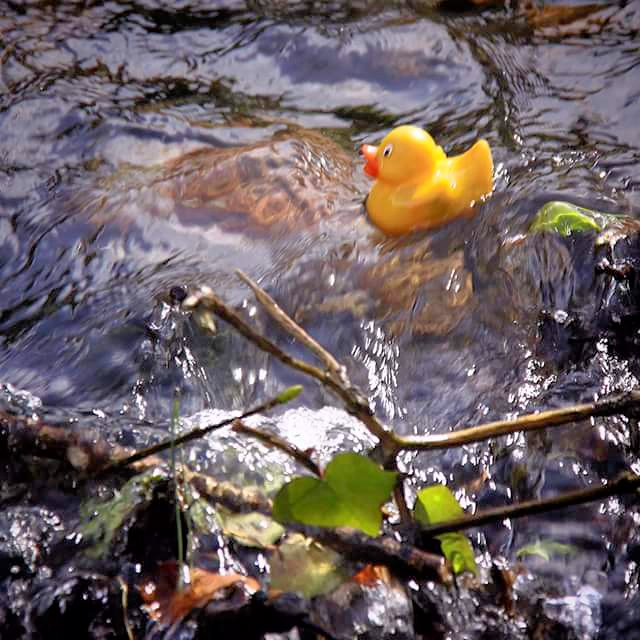 The first race was a sell out with 50 ducks entered, encouraged and eagerly followed down the river to the end in the beautiful grounds of the Rose in Vale. 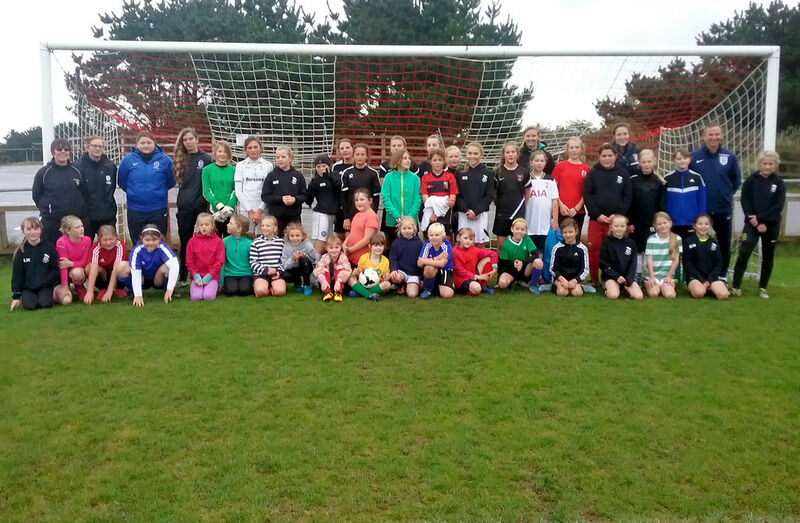 Easter Egg prizes were awarded and the raffle with tea and cakes were well supported with £256 raised for St Agnes AFC Youth teams. 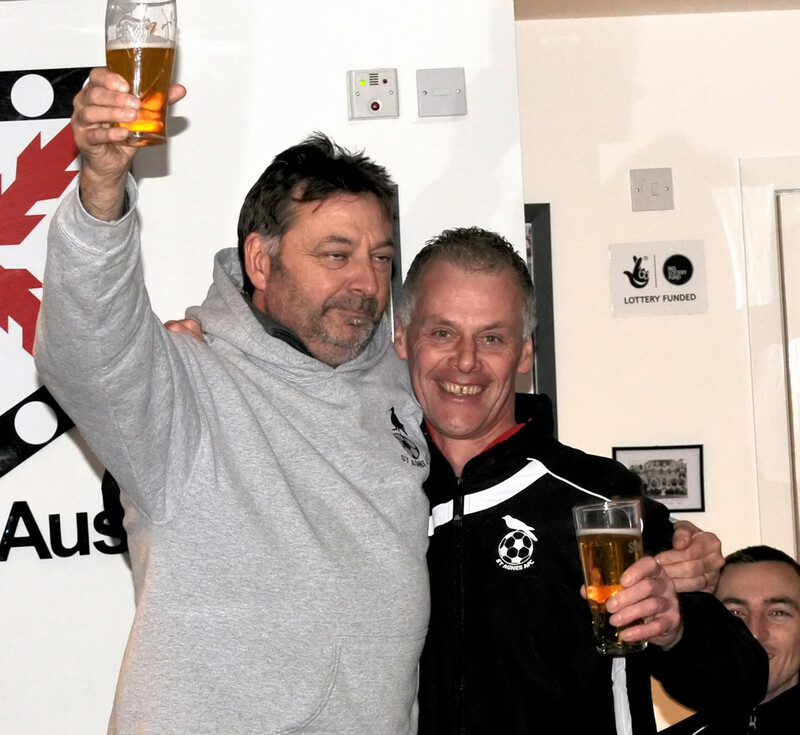 The event was generously supported by James and Sara Evans of the Rose in Vale who provided the venue, the Easter egg prizes and match funded the first £200 raised bring the total to £456. 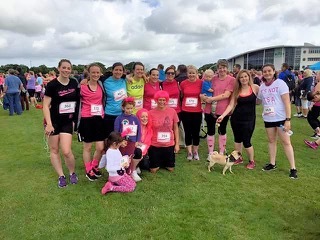 Club Chair Mandy Kimmins commented "What a lovely event to be part of, just delightful! Thank you to everyone who supported in every way especially all at the Rose in Vale”. 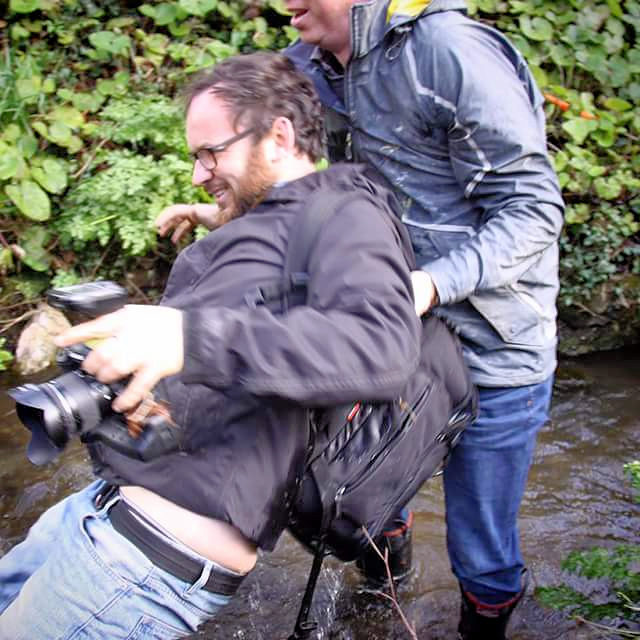 A late unexpected 'entrant' into the Duck Race was the West Briton photographer who borrowed some wellie boots in his efforts to get a good photo only to fall into the river and is photographed by Ellie Llljin being helped out of the river! 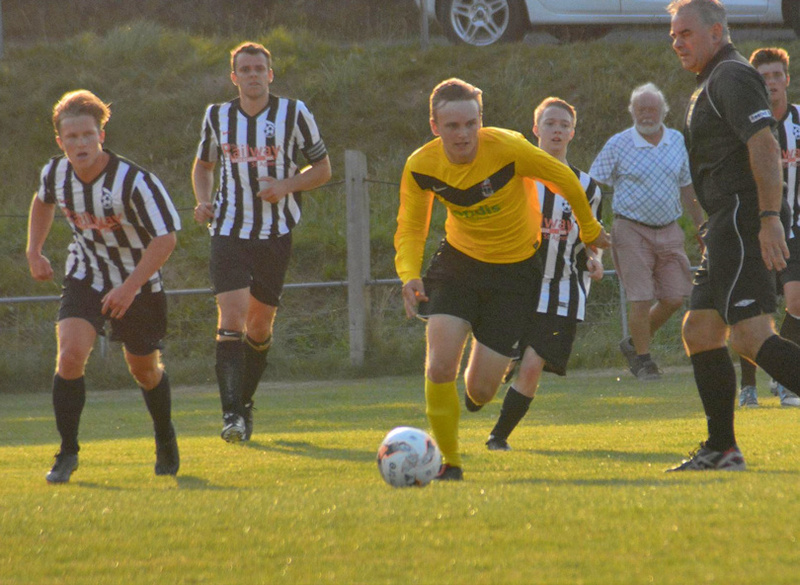 A below-par performance saw St Agnes lose 3-2 against Carharrack in the League Cup Final, played at Gala Parc, Porthleven. 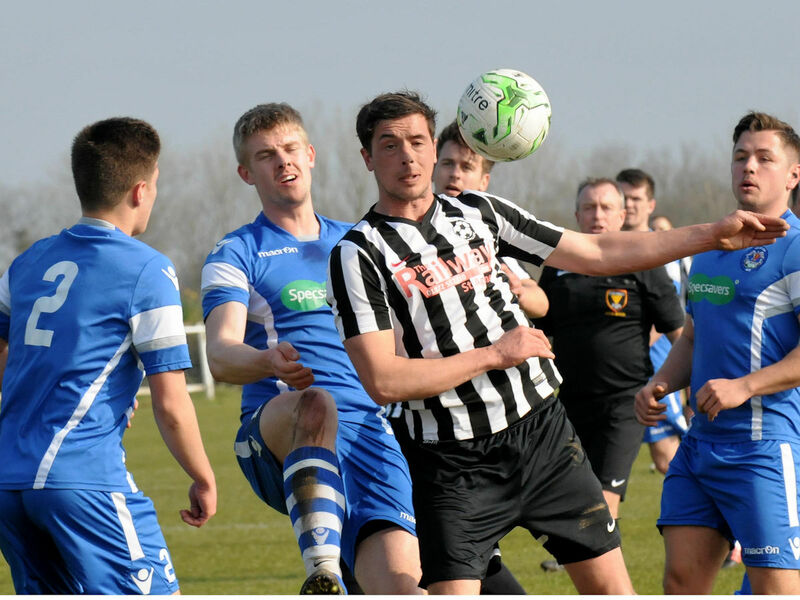 Squad: Ryan Bull, Jack James, Dave Goundry, Mark Bell, Sam Hatfield, Martin Bennets, Dan O’Toole, Sam Connolly, Ross Maynard, Andrew Miles, Adam Barnicoat, Alec Penrose, Sam Mansfield, T J Wilson, Curtis Pay, James Springall. 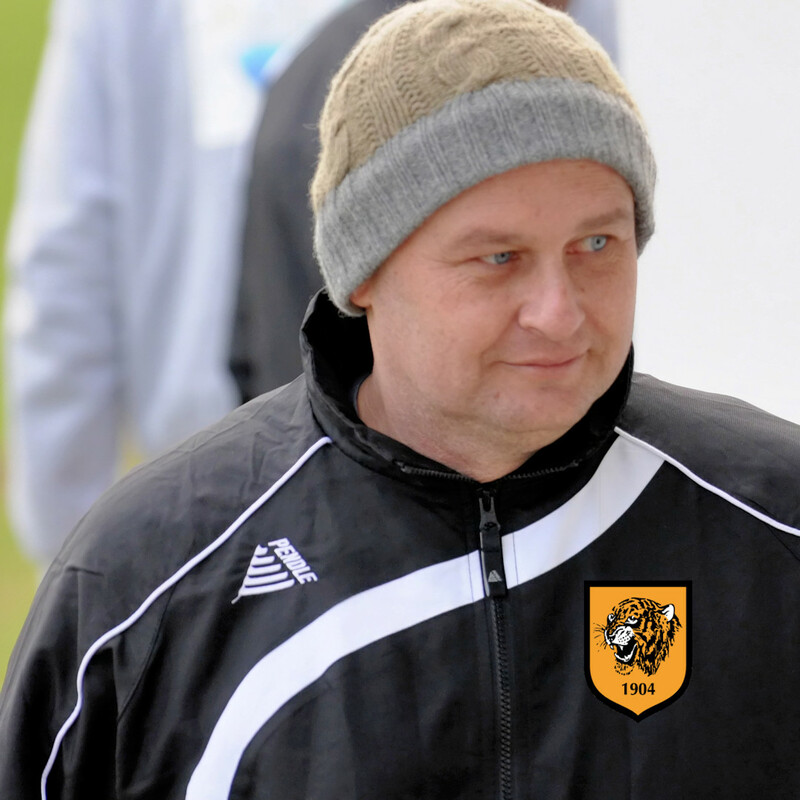 Manager: Martyn Kimmins; Assistants: Dave Kevern; First Aid: Chris Collins. 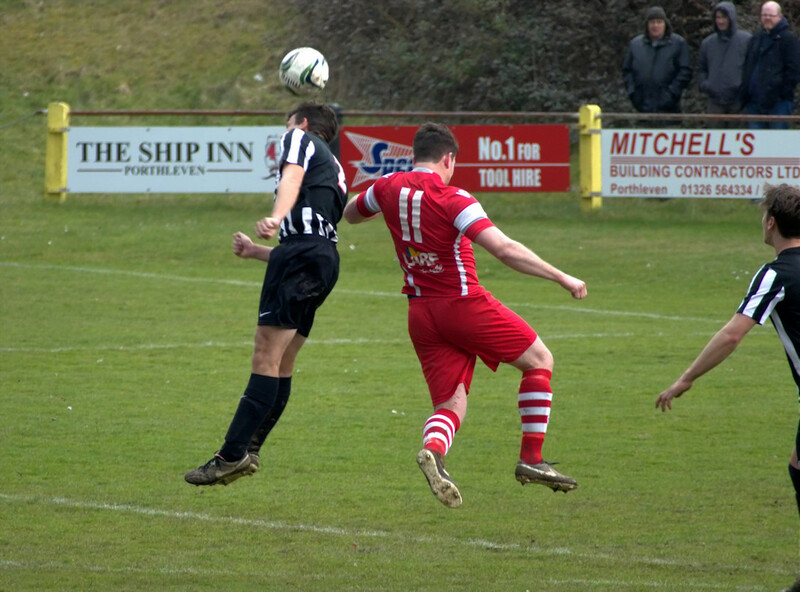 Photos below courtesy of Alan Pitts. Following a request from parents St Agnes AFC hosted a taster football session for toddlers. 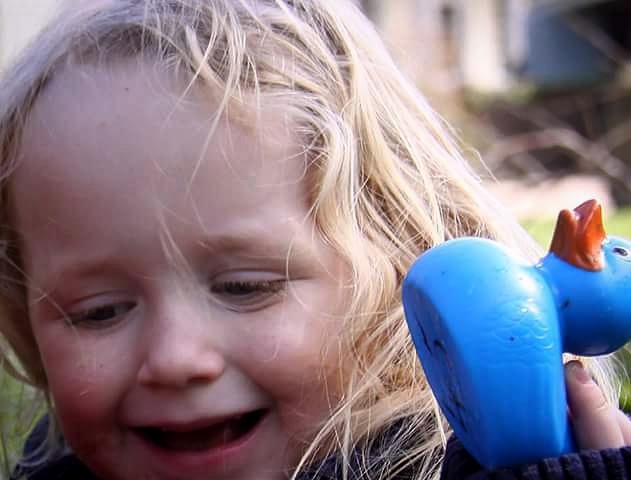 With eleven keen 3 year olds attending and entering into activities with pirates in the sea, mountains to climb and a caterpillar it was a great fun, if chaotic, morning. 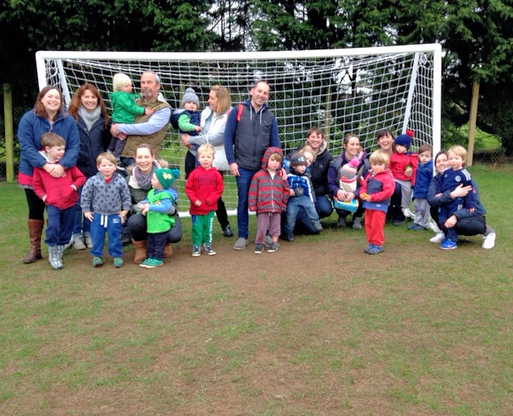 The session ended with a penalty shoot out with loud cheers as every toddler scored beating club coaches in the goal! Further sessions are planned for after Easter. 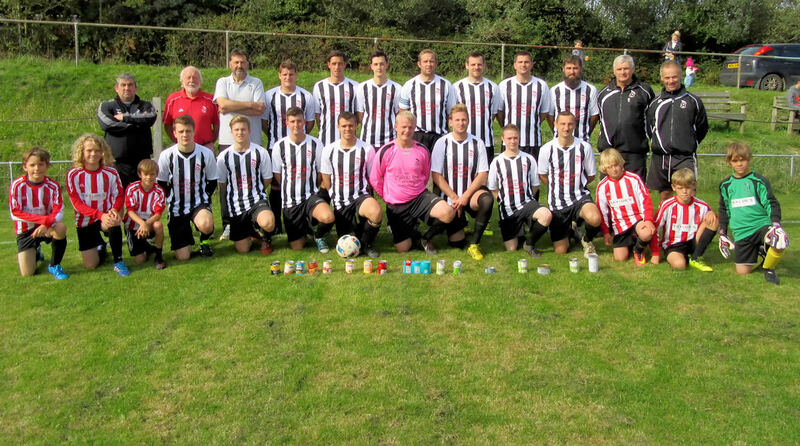 St Agnes AFC 1st team held their Annual 'Tins for The Foodbank' collection yesterday at Enys Parc prior to their 3-1 win against Mullion. Over 50 tins were contributed by players and supporters. Photographed with the tin collection are 1st team keeper Ryan Bull and Captain Ross Maynard. 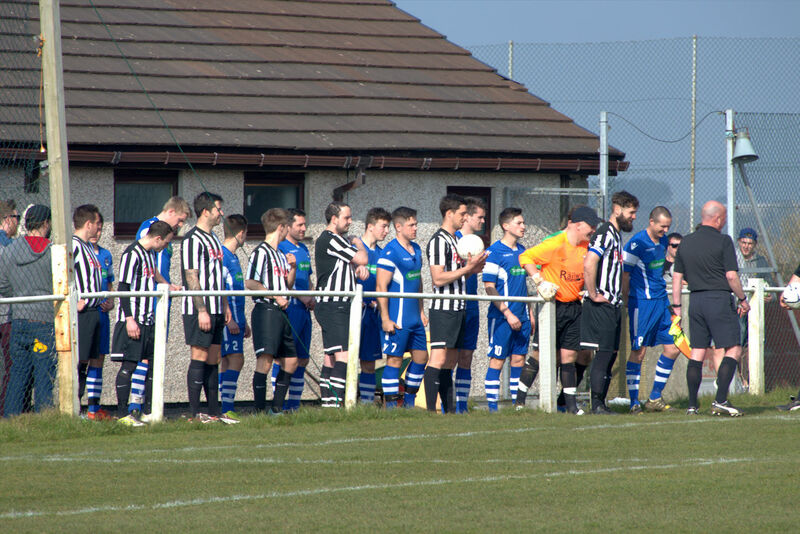 St Agnes Chair Mandy Kimmins said "A great effort today by the players and supporters of our first team in donating more than 50 tins for the Foodbank. It's double what we collected last time!" 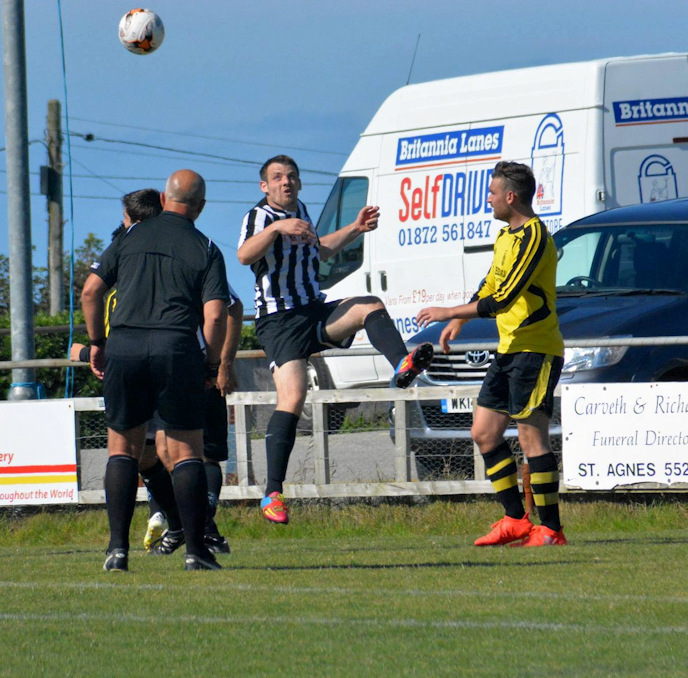 The tins have been donated by St Agnes AFC to the Camborne Foodbank, which was established in 2010 to help those in the Camborne/Redruth area affected by the economic down turn. 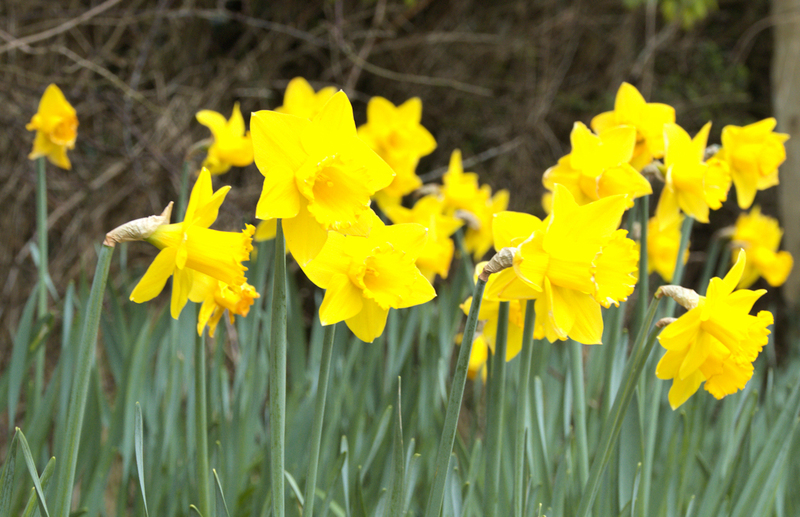 Saturday was the first day of Spring 2016 and the daffodils around the grounds at St Agnes AFC were in full bloom. The bulbs were planted by players, friends and family to create a living memory bank for club stalwart Sylvia Chapman who lost her life to Breast Cancer. 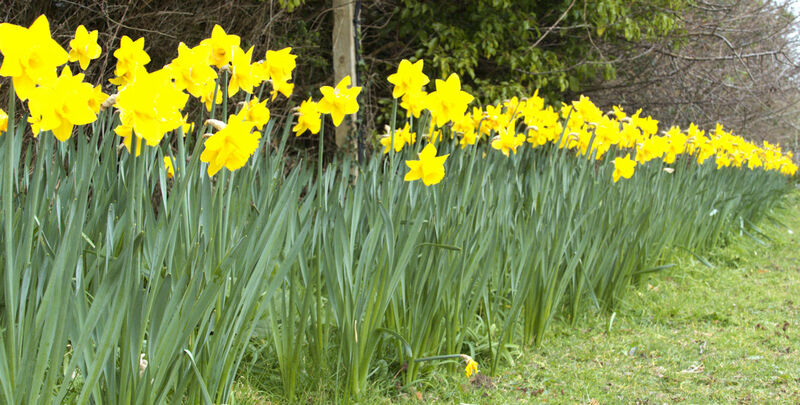 Club Chair Mandy Kimmins said "Sylvia was an important part of our club and community and every year when the bulbs come up and bloom its a lovely way to remember her”. Photo: Sylvia Chapman who lost her battle against Breast Cancer in 2010. 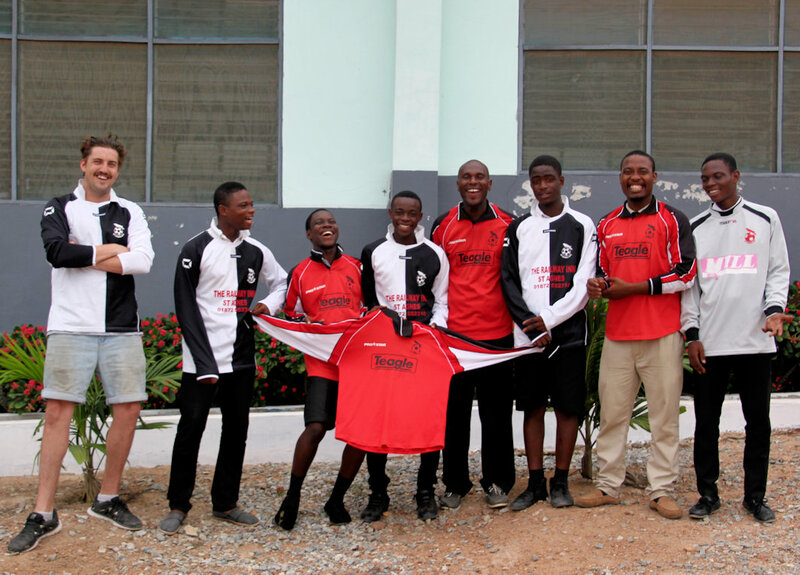 St Agnes AFC in Cornwall has formed a link with Awutu-Winton Senior High School a fee free senior secondary school for underprivileged, disadvantaged students 50 kilometres west of Accra in Ghana, West Africa. The mission of the school is believing that education is the only route out of poverty and despair and is the gift that no child in our world should be denied. It opened in 2010 and is providing education and many other opportunities for 480 pupils aged 14 - 21 years. 25 year old David Maloney from St Agnes, whose mother is Chair of St Agnes AFC Mandy Kimmins, is presently spending 6 months at Awutu-Winton volunteering as a project coordinator working under the project manager. David is working with the businesses in the school as well as the English school visits, sports and maths departments and overseeing the learn to swim program on behalf of EDP for the princess of Monaco foundation amongst other things. As part of his preparation for his trip David collected and took with him some mathematical equipment including calculators and geometry items and sporting equipment including footballs and football kits from St Agnes AFC. 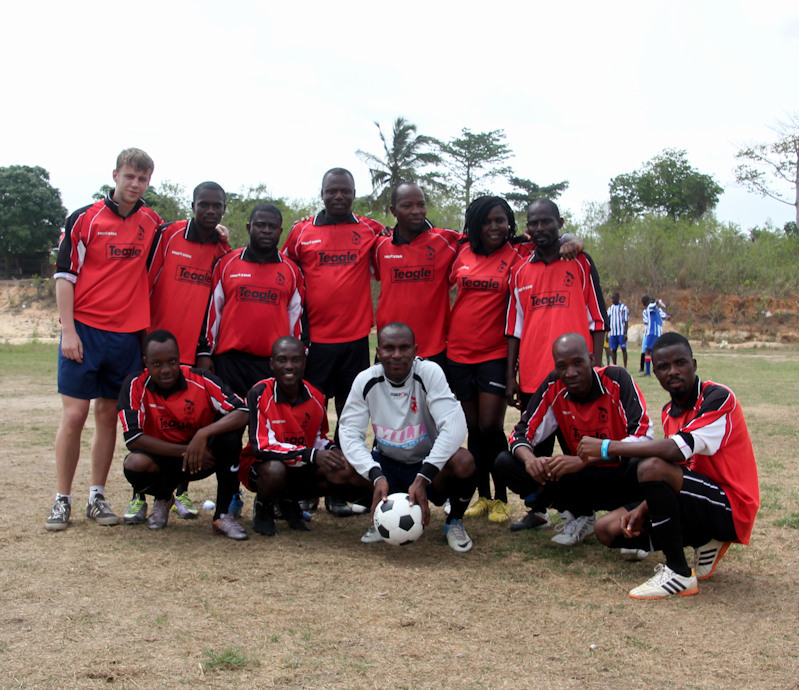 The football kits are already in use and photographed during a school sports day with the leavers year students playing the staff in a jolly pre-exams fixture. 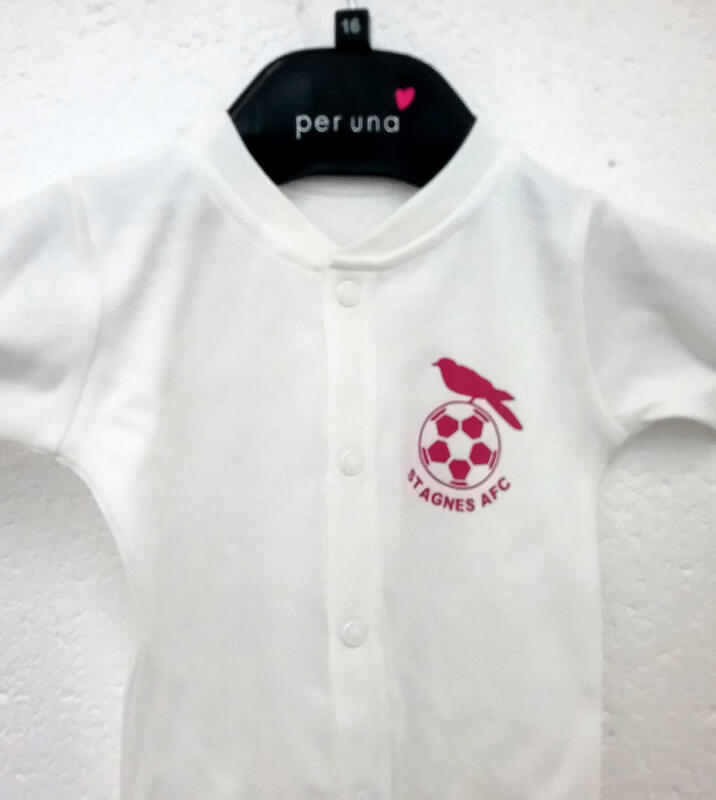 Mandy Kimmins said "St Agnes AFC is delighted to be supporting Awutu-Winton School and to see our old football kits recycled and used is amazing. All clubs have old kits over the years that sit in cupboards redundant and never used and I know our sponsors of these kits will be thrilled to see them still in use!" 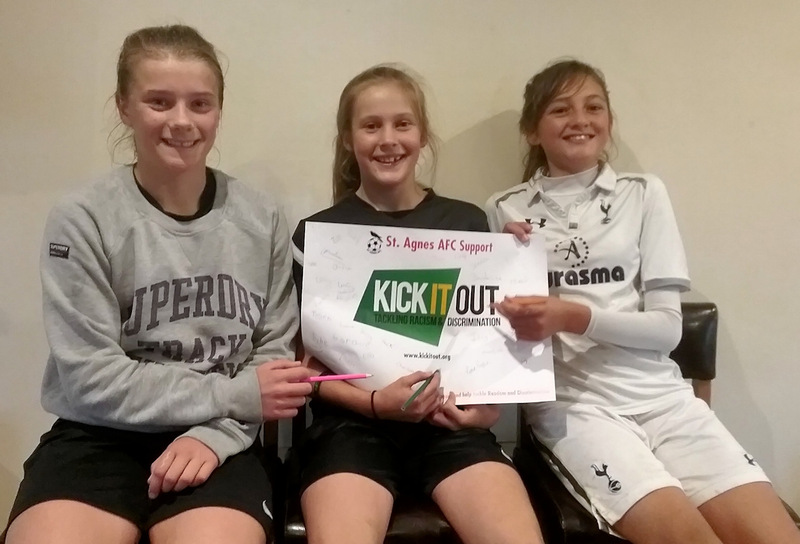 Over the next 6 months St Agnes AFC will be looking to support the school further by fundraising and collecting items such as nearly new football boots, trainers and running shoes suitable for 14-21 year old boys and girls. The school pupils would also value mathematical equipment and any musical instruments. 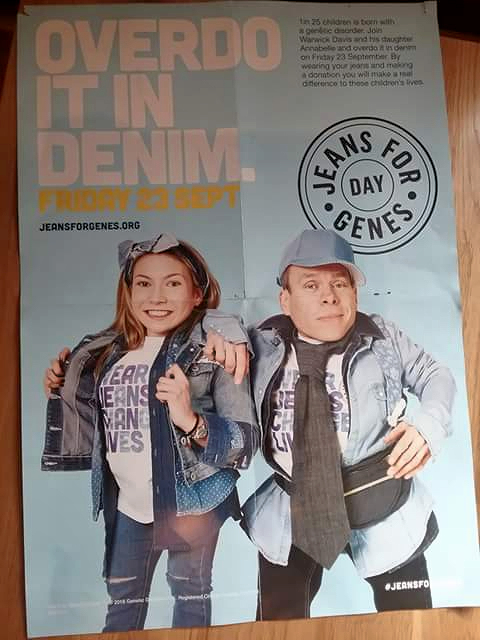 Anyone with any suitable items is welcome to contact Mandy Kimmins on 07974 370666 or email. 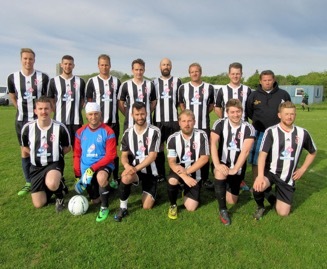 David Maloney back left in St Agnes AFC 1st team old black & white kit sponsored by Railway Inn, St Agnes with staff and pupils mixed up in red Teagle Machinery Kit. 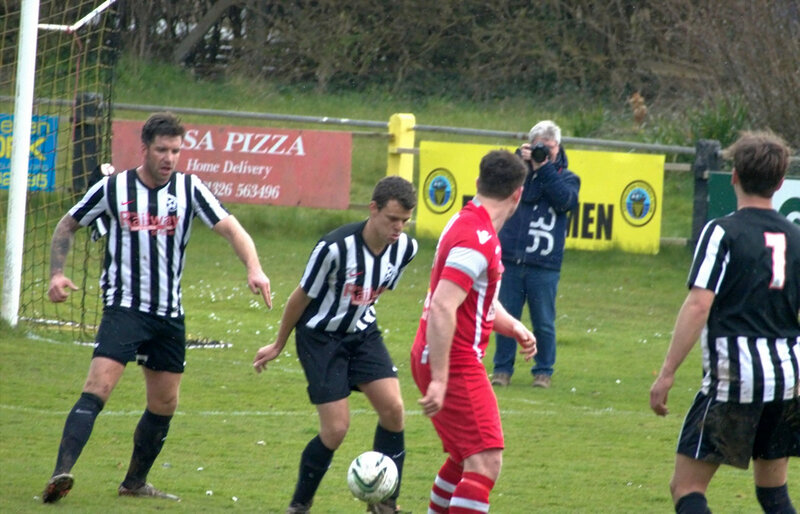 St Agnes played Helston Reserves at Hayle in the League Cup Semi-Final on 13 March 2016. 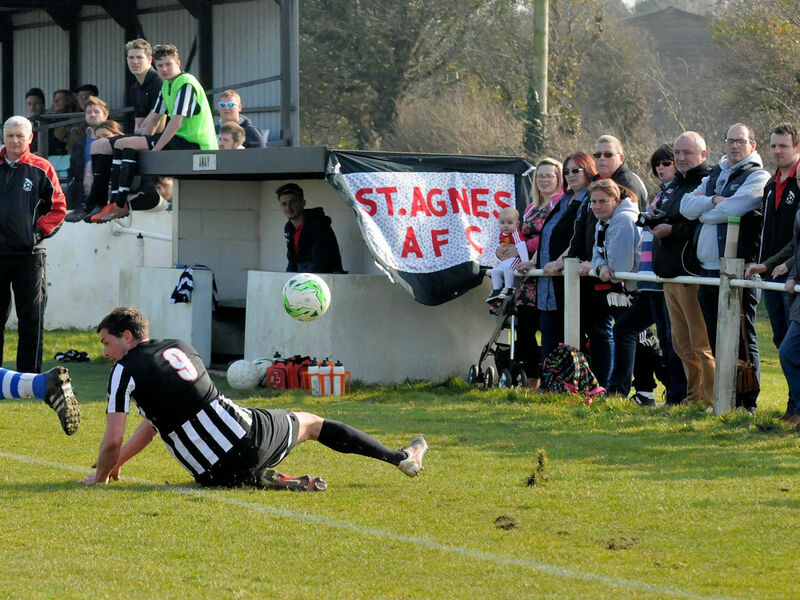 St Agnes controlled the first half and should have gone in at half time with a couple of goals advantage, but it was not to be. 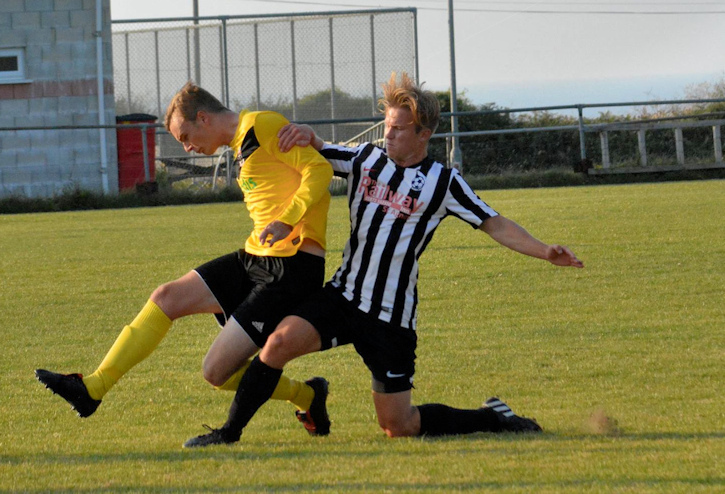 St Agnes took the lead twice, only for Helston to equalise twice. 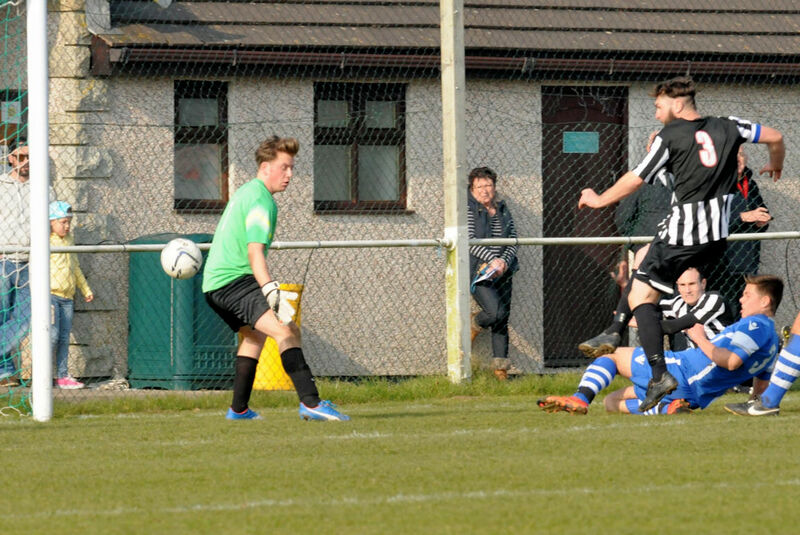 2-2 at full-time saw Helston take the lead 3-2 in the first half of extra-time and it looked to be all over with some tired St Agnes legs evident. 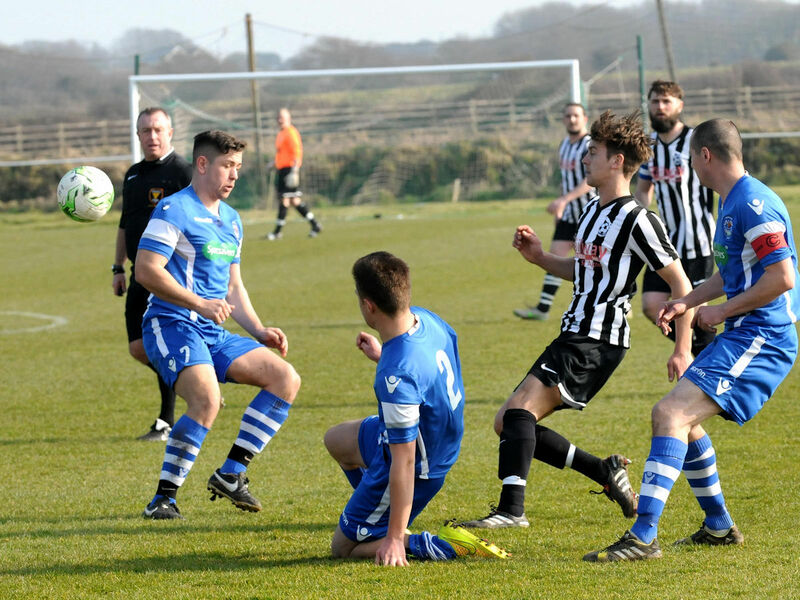 However, some timely substitutions breathed new life into the team and two goals in the last six minutes of extra-time saw St Agnes through to the League Cup Final, winning 3-4. 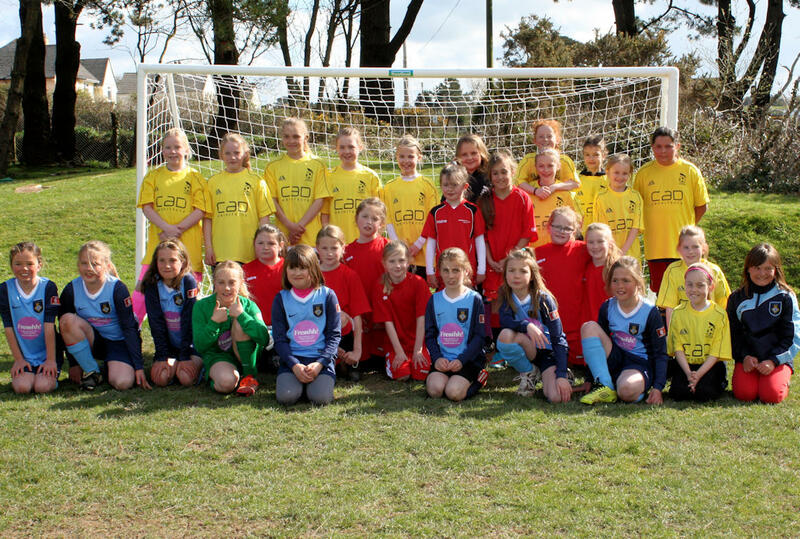 St Agnes AFC Dynamos Girls Under 10's team invited Biscovey girls to a ‘mixed-up’ friendly at their home pitch at Blackwater School. 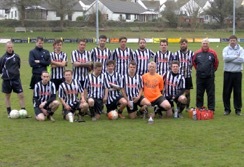 They are photographed at the end in a ‘mixed-up’ picture having played some great football. St Agnes AFC Dynamos Under 12's Girls are photographed after their convincing win away at Culdrose, in their first fixture of the Spring League. 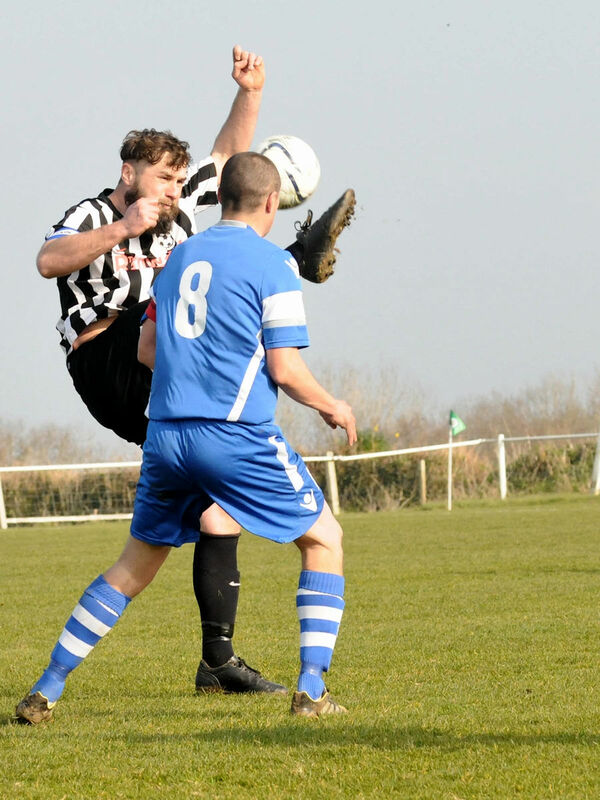 Fantastic day for a game of football and Aggie were away to St Dennis with only a confirmed 11 players playing against top of the table St Dennis. 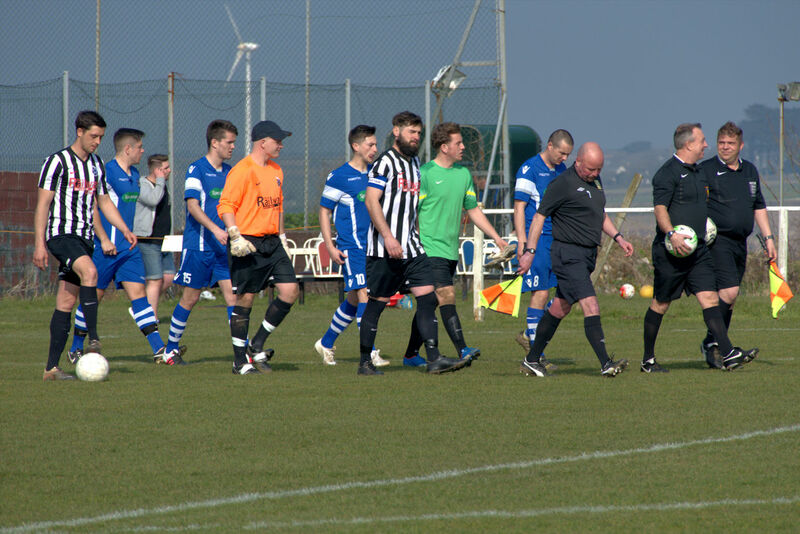 This was always going to be a hard fought game and to make matters worse only 10 players turned up, so with a reshuffled formation the game started. 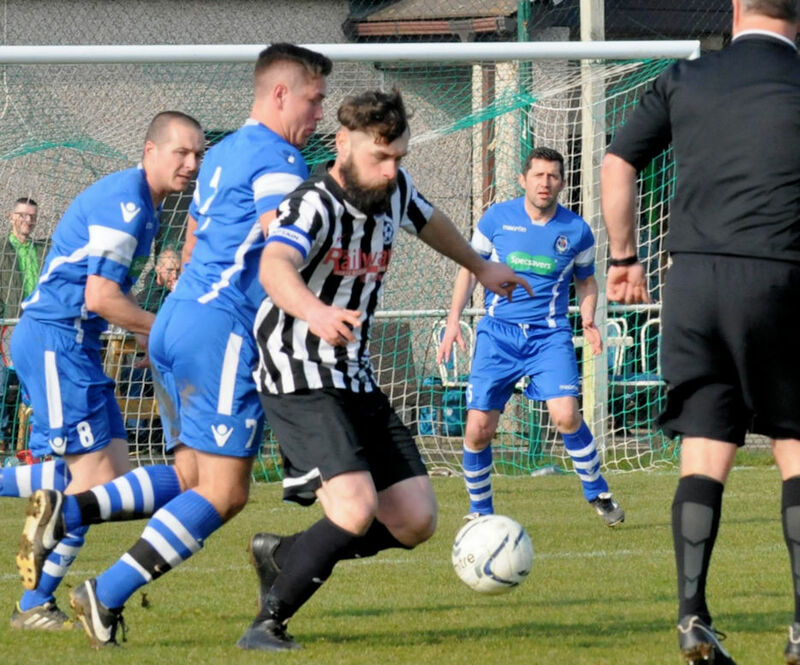 Aggie were surprisingly straight into the game from the kick off and the early pressure paid off when after only 7 mins they went 1-0 up through Trevor Wisker. 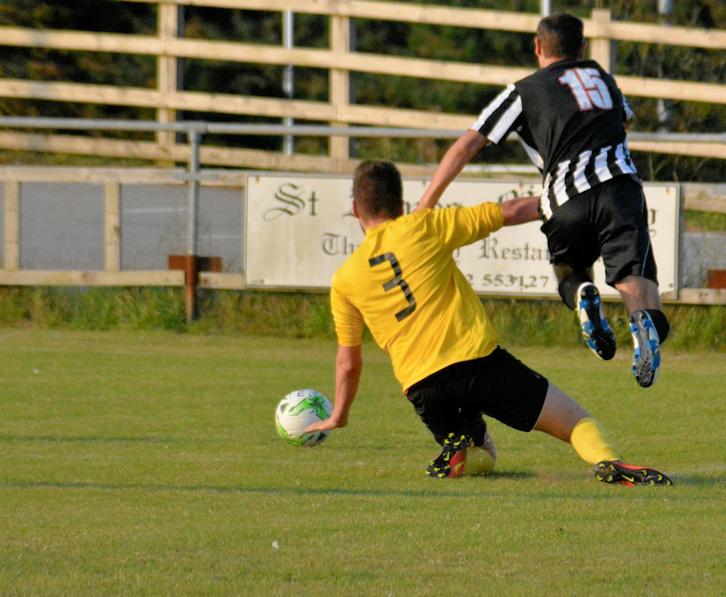 With Aggie matching everything St Dennis were doing there was a controversial penalty given against Aggie. The Aggie defender took the ball, but the ref gave a free kick only to change his mind after the players were trying to question his decision, to a penalty. 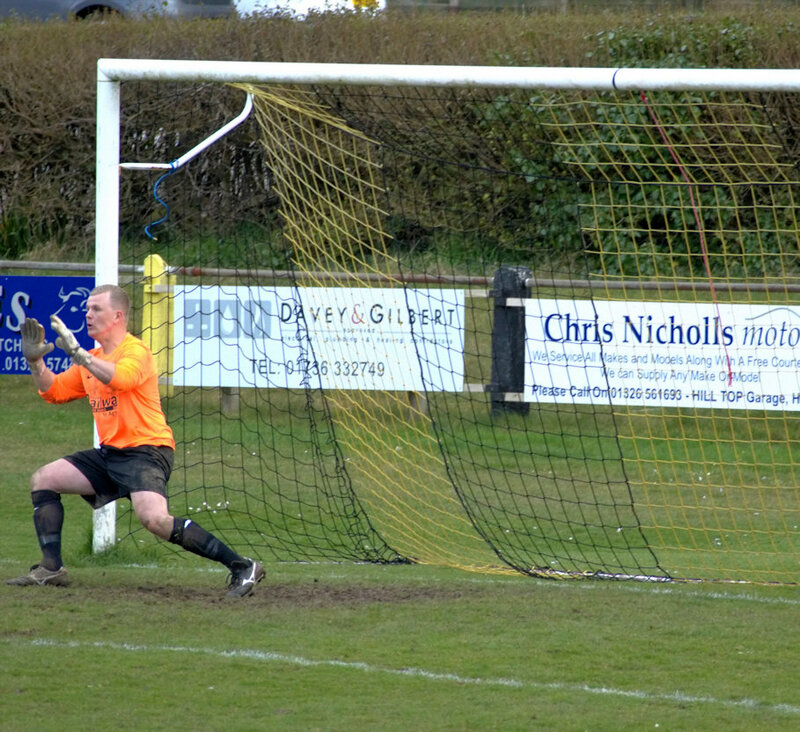 St Dennis calmly slotted home and things started to turn when the Aggie keeper got injured. 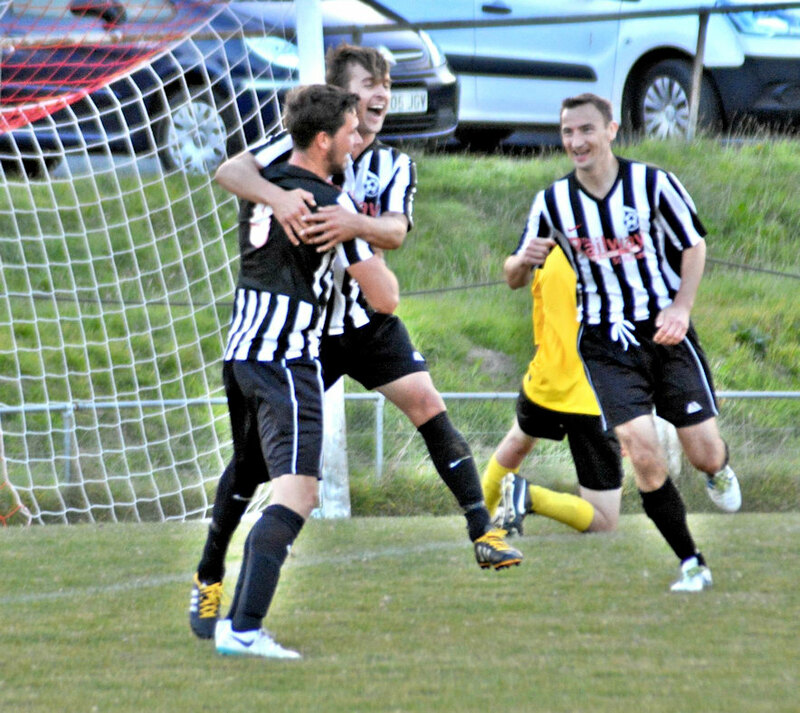 On 37 minutes St Dennis went 2-1 up and 4 mins later netted again to go 3-1 up at half time. 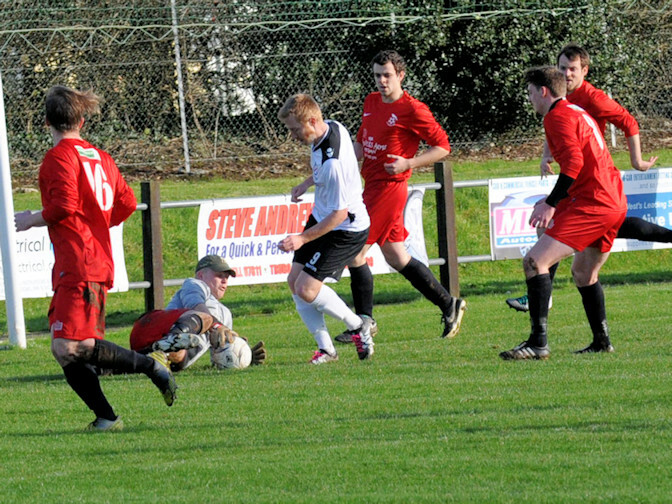 The second half started badly for Aggie and after only 1 minute in St Dennis were 4-1 up then 2 minutes later 5-1 up. 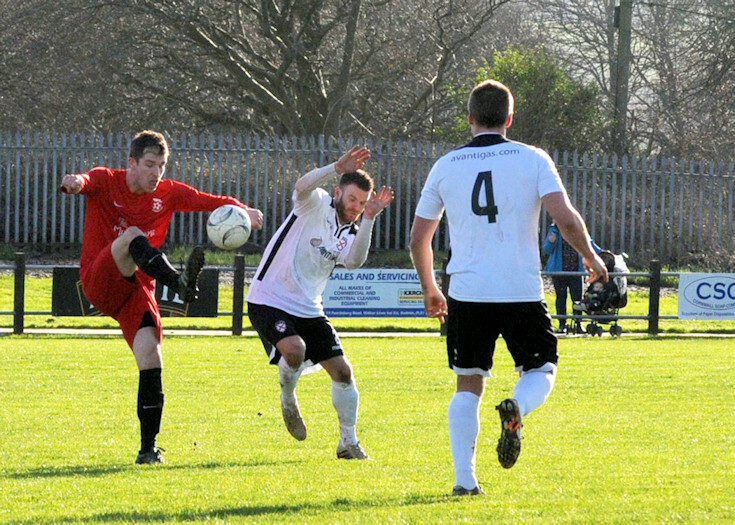 Aggie never gave up and had a few breakaway chances, but with legs tiring it was always going to be a struggle to get anything out if this game. 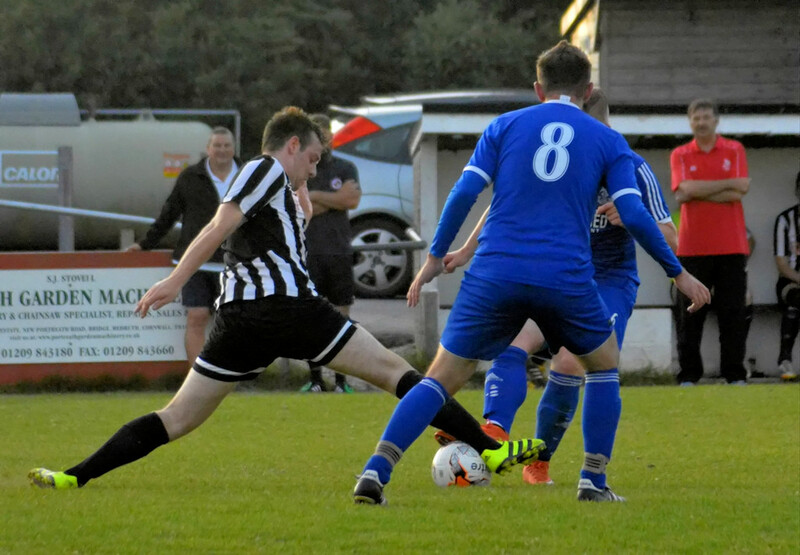 They had a penalty of their own turned down late on, but it was St Dennis who came out winners with another goal in the 37th minute of the second half. Final score St Dennis 6-1 Aggie Bolsters. 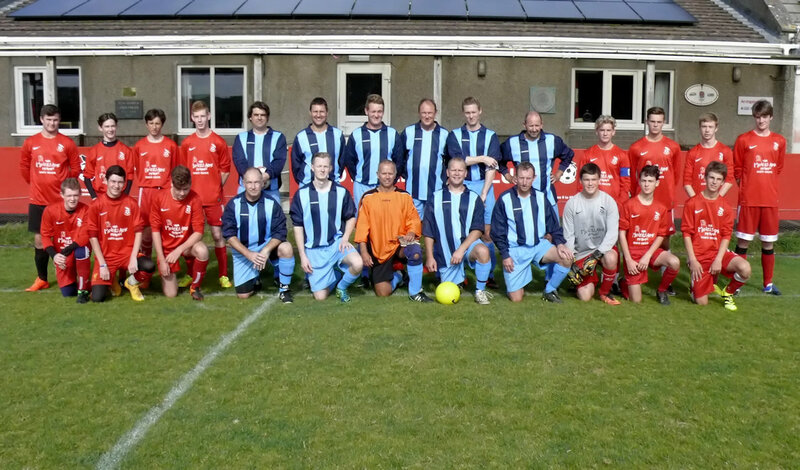 This cup fixture got switched to Holmans due to Enys park being unplayable, many thanks for Holmans hospitality for letting the game go ahead and for looking after us after the game, this is what veterans football is all about! 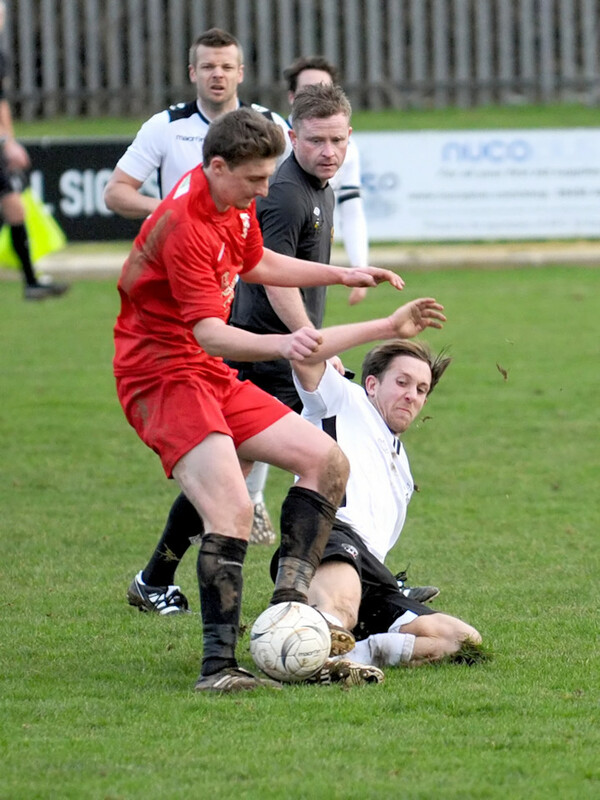 The game kicked off on a very muddy pitch and great credit to both teams for trying to play football, although at times there was some hoof ball being played. Aggie seemed to take control early on and had a couple of good chances to go ahead, but on 26 mins Holmans took the lead with some good passing and movement. Four minutes later a good ball by Matt Salmon met Spencer Hassell’s head and it was 1-1. 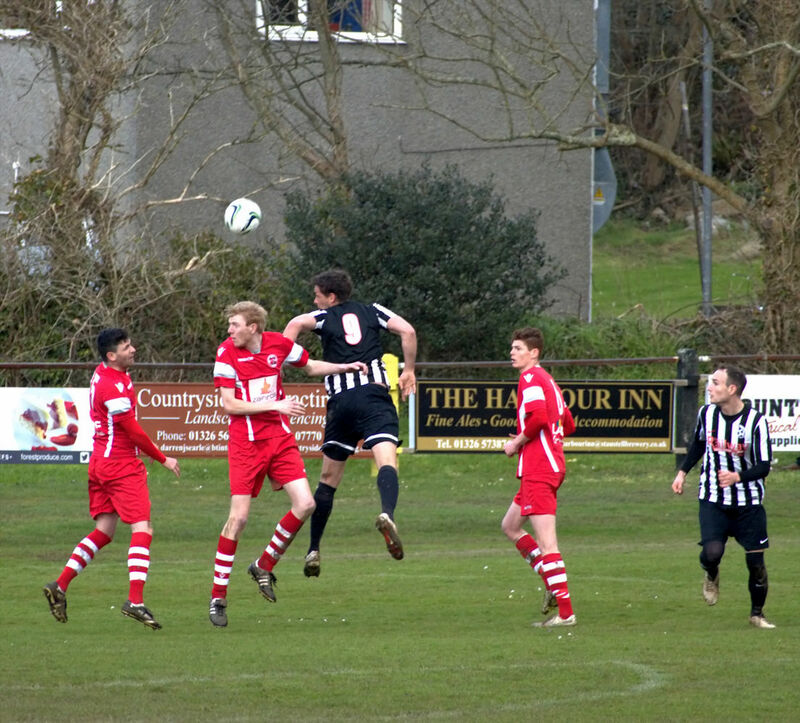 Three minutes later a fierce cross from Rupert Arch was met by the head of Ian Roberts the Holmans defender for an own goal. Half time 2-1 to Aggie. 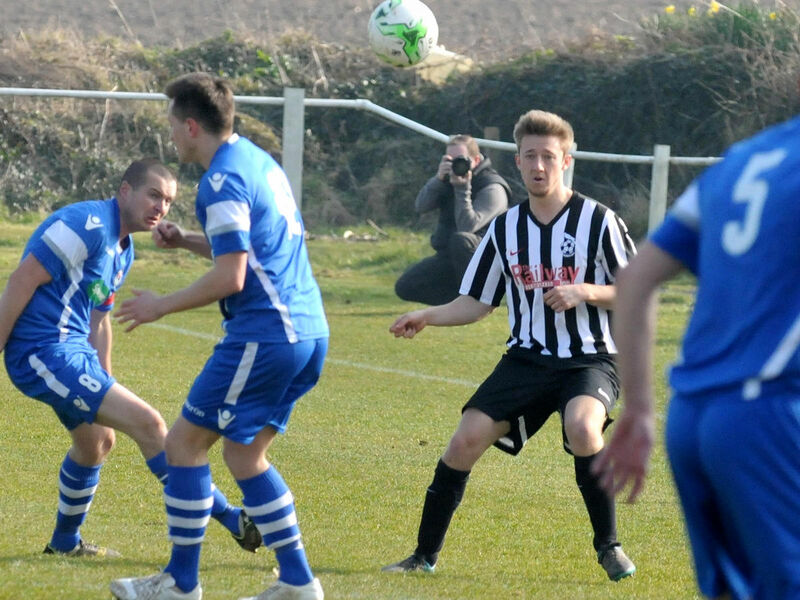 The second half got under way and 17 minutes in saw an equaliser for Holmans. Aggie showed good character and 2 minutes later a fantastic run by Dan O’Toole and a shot on goal gave the keeper no chance, 3-2 Aggie. 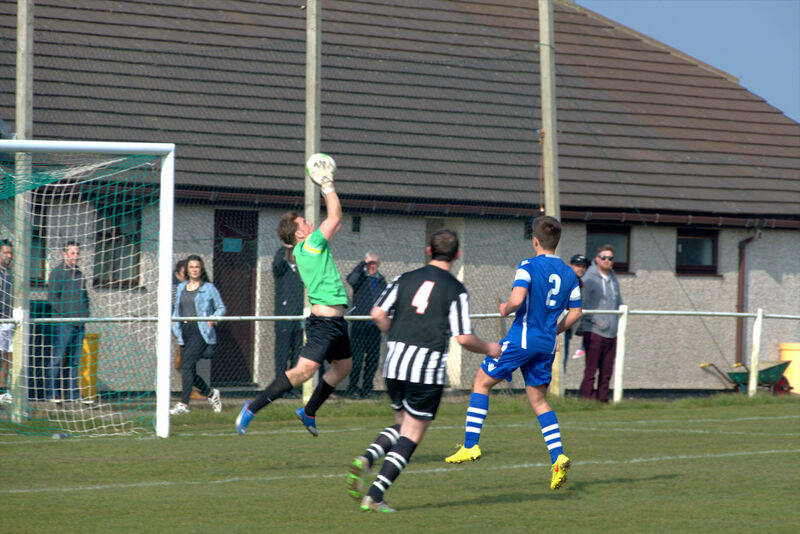 Holmans never gave up in this cup fixture and were awarded a close call penalty on 27minutes, which was slotted home, 3-3. With the game looking to go to penalties Aggie were not going to give up though and with 10mins remaining they were awarded a penalty and O’Toole stepped up and calmly guided the ball into the net, final score Aggie 4-3 Holmans. 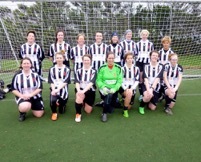 St Agnes AFC Ladies put in a great performance away to Newquay Ladies facing a side a league above them and playing a new formation with a sweeper in a 5-4-1. Every player in the squad carried out their instructions well, frustrating the opposition and coming out of the game with a lot of credit. 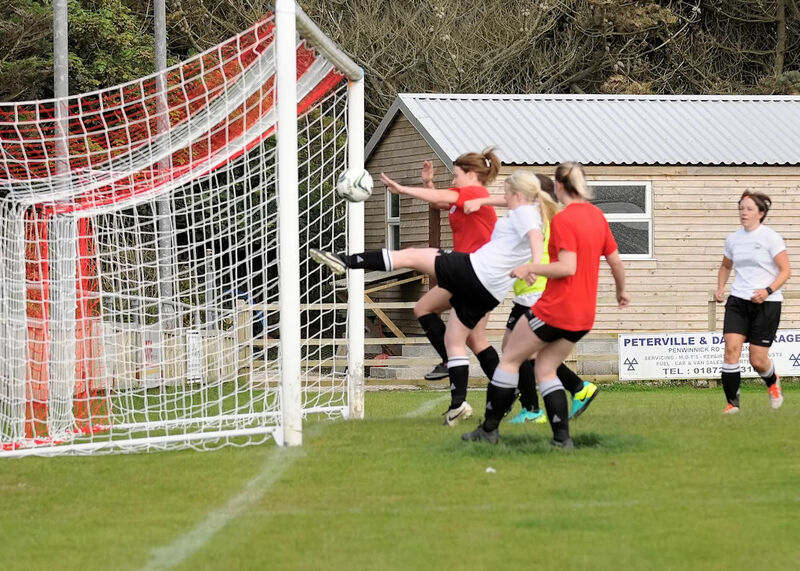 In the first half, often spent camped out in their own half, St Agnes defended brilliantly against their higher league opponents with Zoe Arundell-Lethbridge sweeping up everything Newquay attacked with and when they did get through Julie Windram in the St Agnes goal produced some great saves. 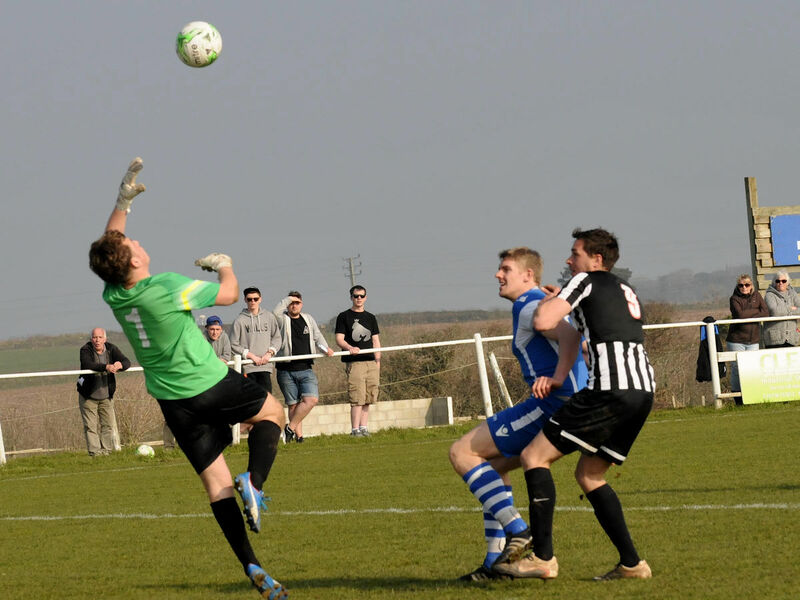 Newquay also missed a penalty sending the ball wide. 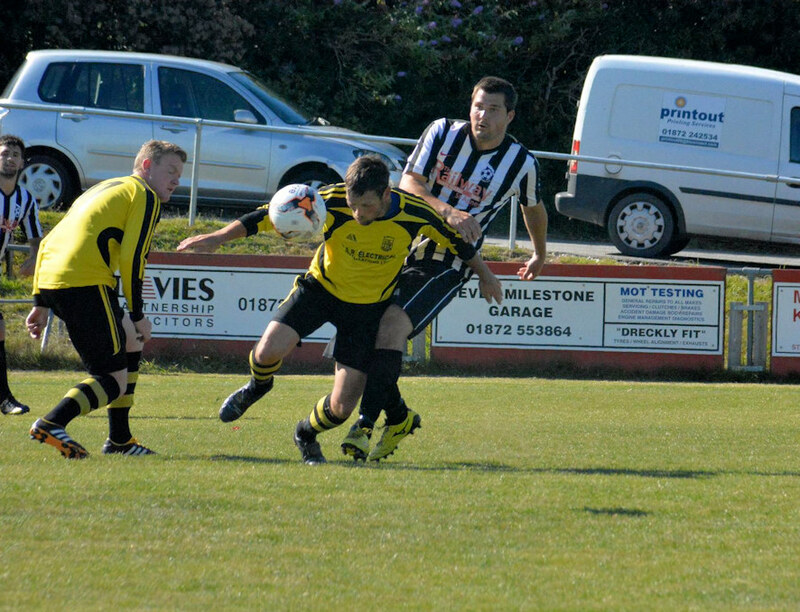 Half time 0-0. 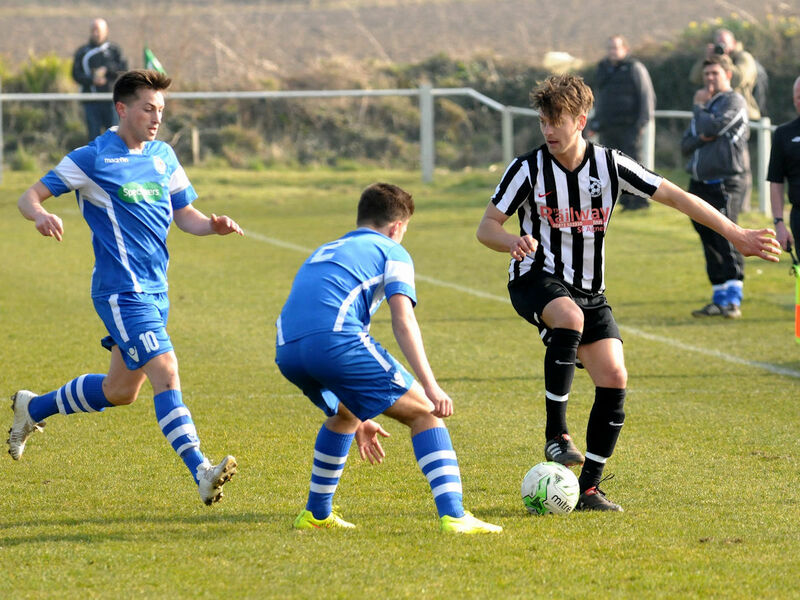 The second half went the same way with St Agnes managing to hold out until the 75th minute when Newquay scored from a cracking volley into the top corner. 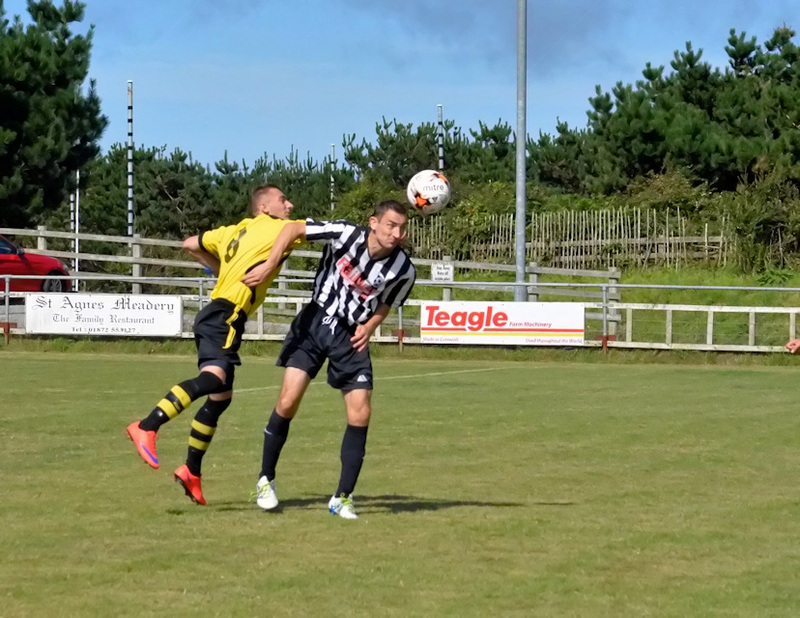 St Agnes continued to defend brilliantly until the last 5 minutes when Newquay scored a second from a corner. 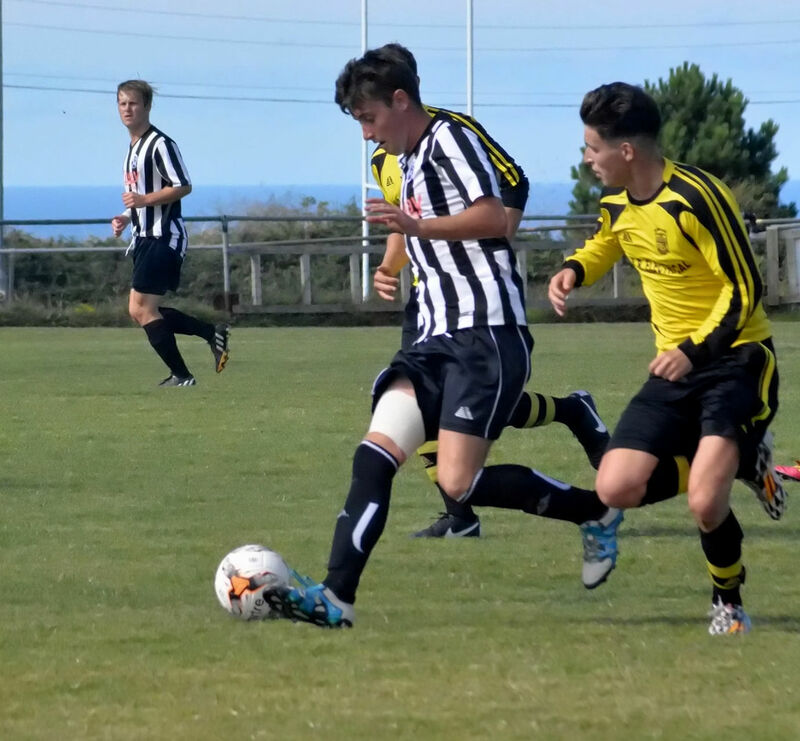 Overall a great effort from St Agnes against a higher league side expected to beat them by far more than the end result of 2-0. 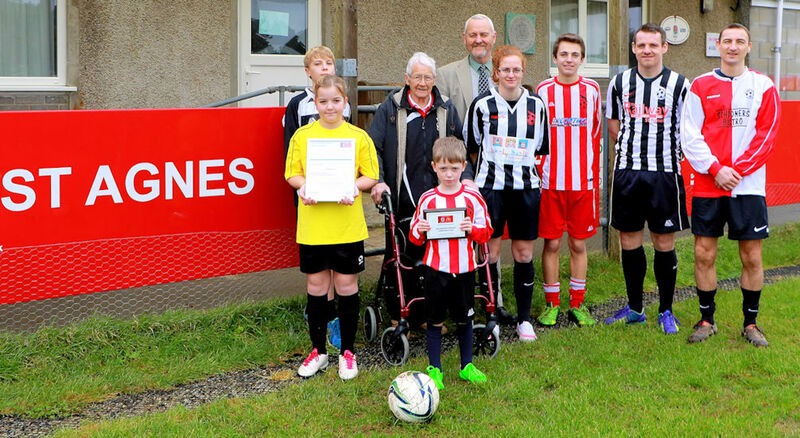 Past and present players marked the St Agnes AFC Charter Standard Community Club Award at Enys Parc with 89 year old Russell Fowler being central to the occasion. 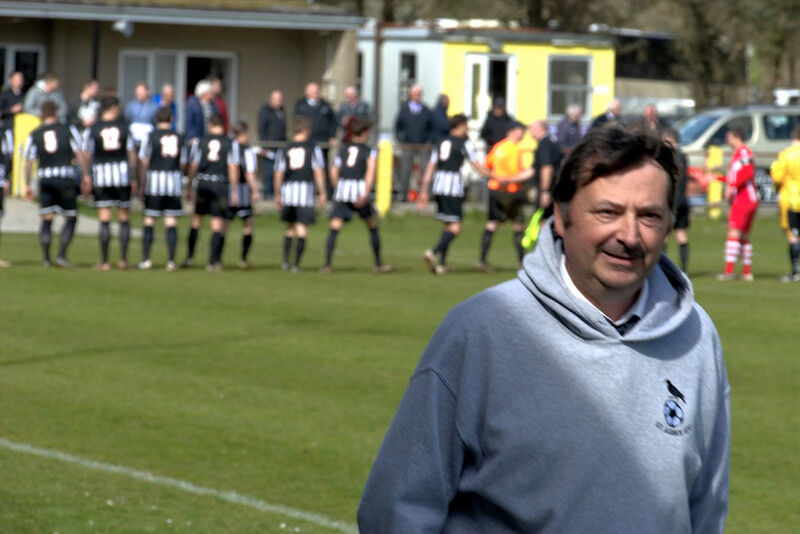 Russell, who still supports the club's first team every Saturday, explained that he had played within the St Agnes Parish during the 1940's/50's although no football was played during the war years. 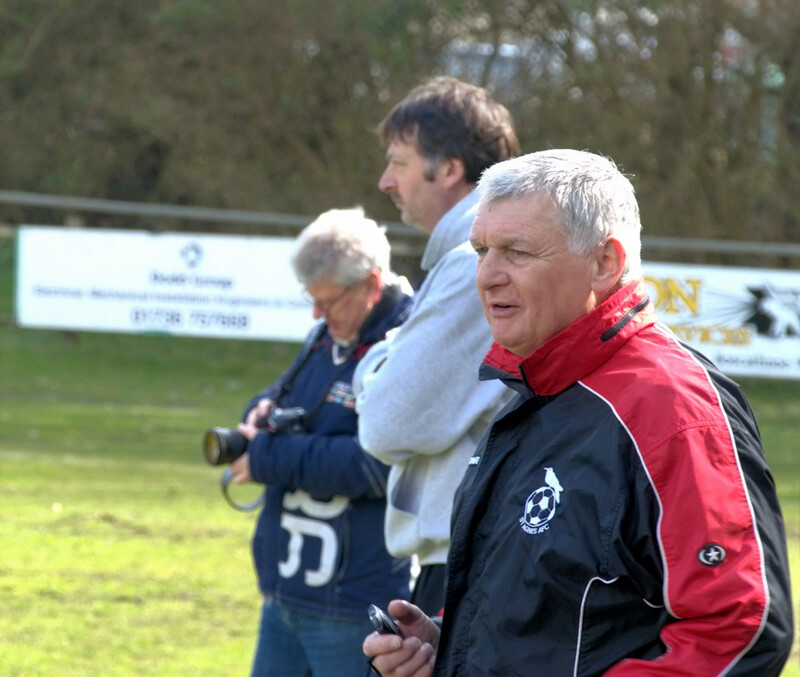 He then went on to represent the club at veterans football and manage during the 1960's/70's. 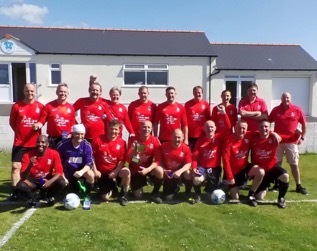 St Agnes AFC now field 18 sides and Russell is photographed with the club's proud President Ian Doble and representatives across all the various playing sections (mens, veterans, ladies, girls and youth). 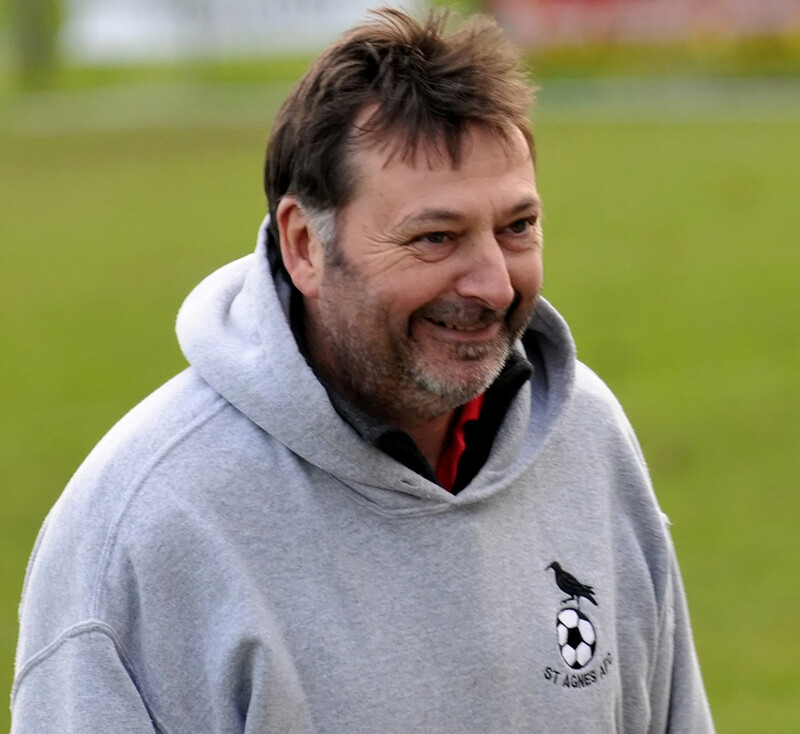 Russell complimented those now running the club by saying "There has been great progress within the club with the right people in the right places”. 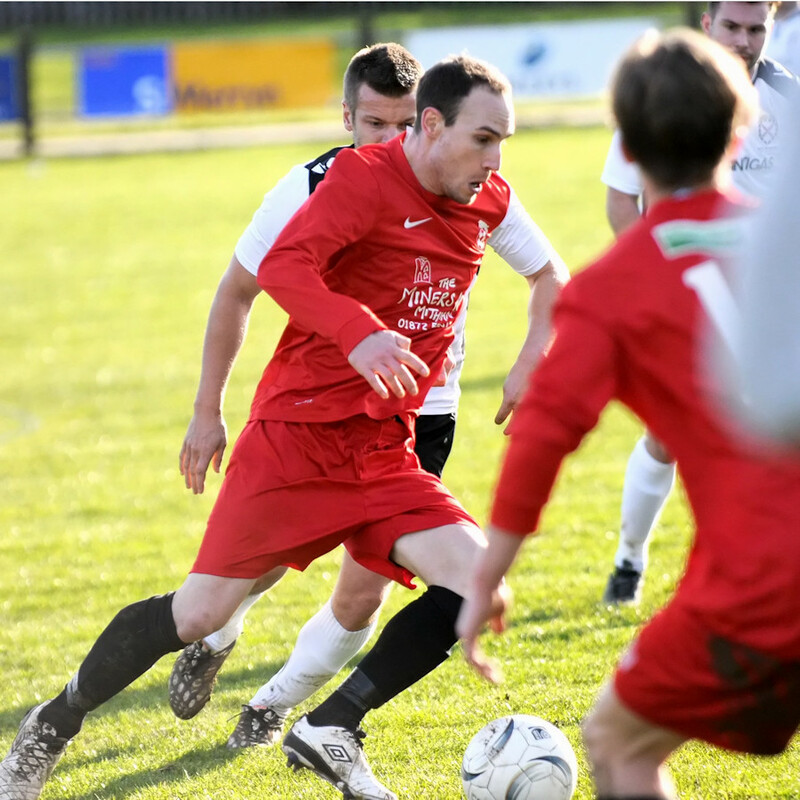 Player Dan O'toole a first team and veterans player, who has been with St Agnes AFC for 10 seasons and is now coaching within the youth section commented "I have enjoyed being at this club as it has a great atmosphere and good feel about it”. Seven year old Freddie said "I like playing football here as i see all my friends and we play lots of games!" 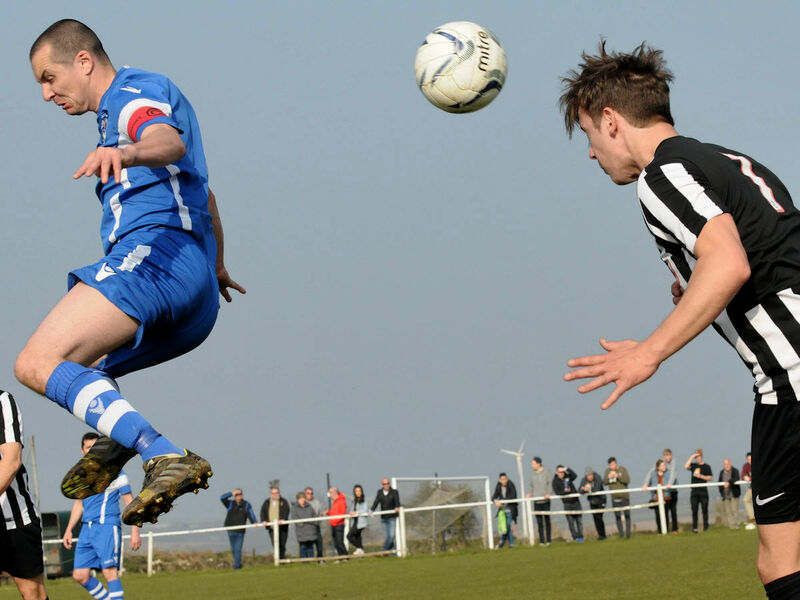 The FA Charter Standard is the quality mark for all local football clubs which is achieved by having qualified coaches and good practice codes of conducts for players, coaches, managers, parents, spectators. 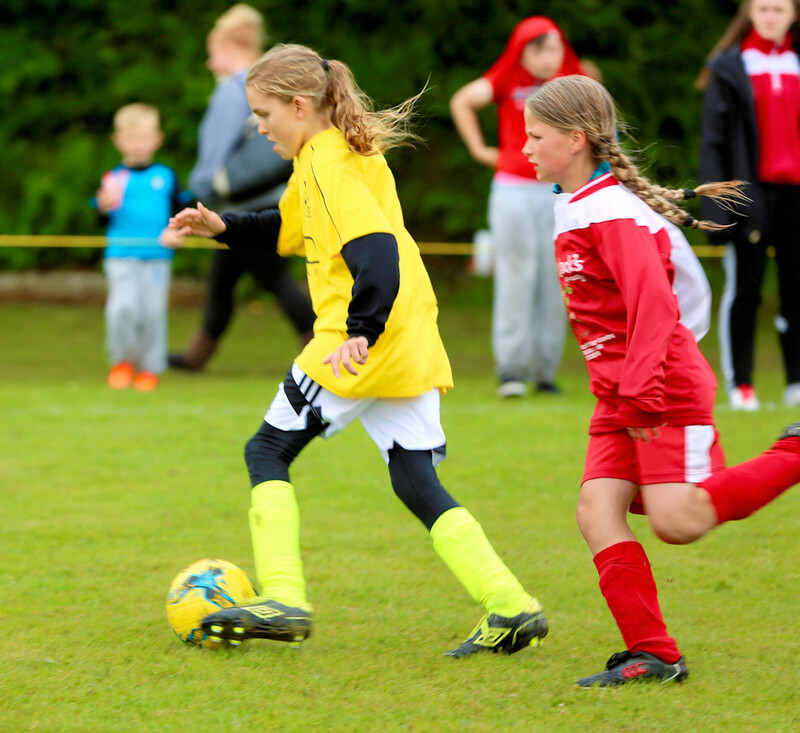 The Charter Standard Scheme is a best practice guide that sets standards of coaching, administration and child protection for all clubs outside the Football League and Premier League. There are three levels of FA Charter Standard Awards for clubs to recognise the different standards. 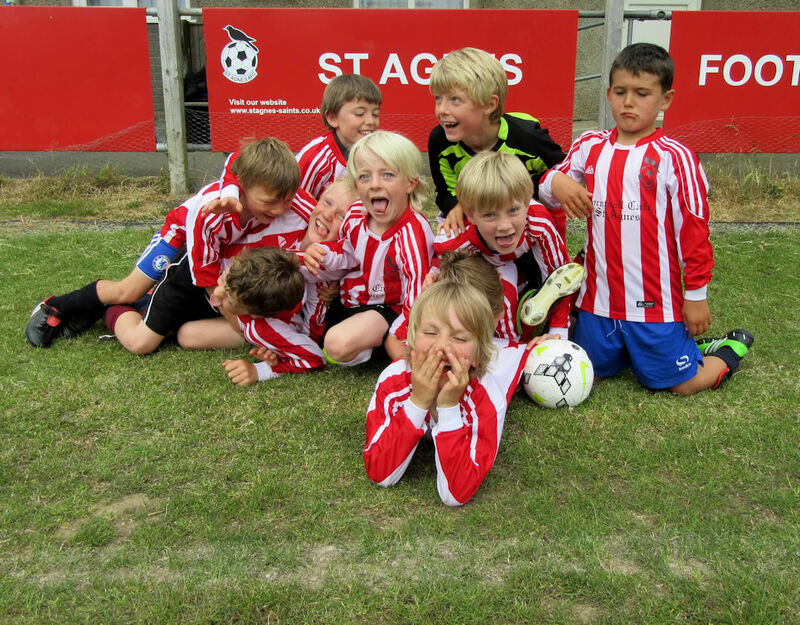 The entry level is an ‘FA Charter Standard Club’, the next level is an ‘FA Charter Standard Development Club’ and the most advanced which St Agnes AFC has achieved is ‘FA Charter Standard Community Club’. Each advanced level requires additional criteria to be met. 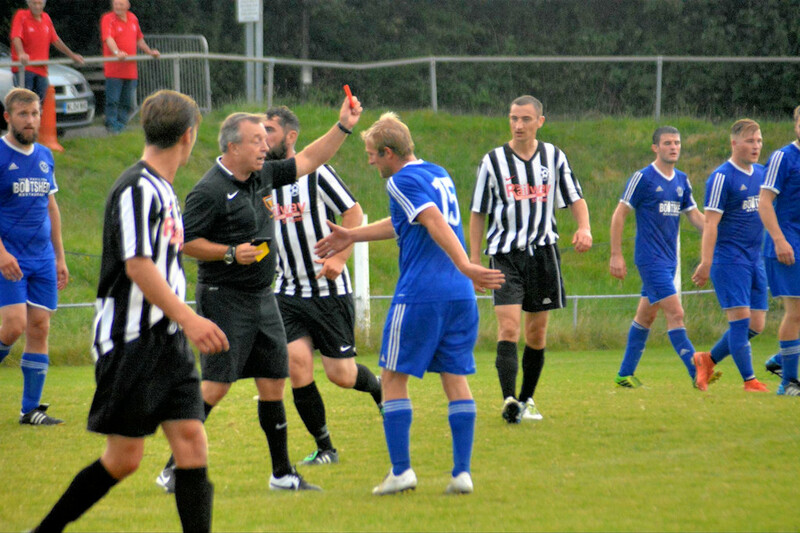 Todays game was given a late pitch inspection and given the green light to go ahead by the referee just before KO. 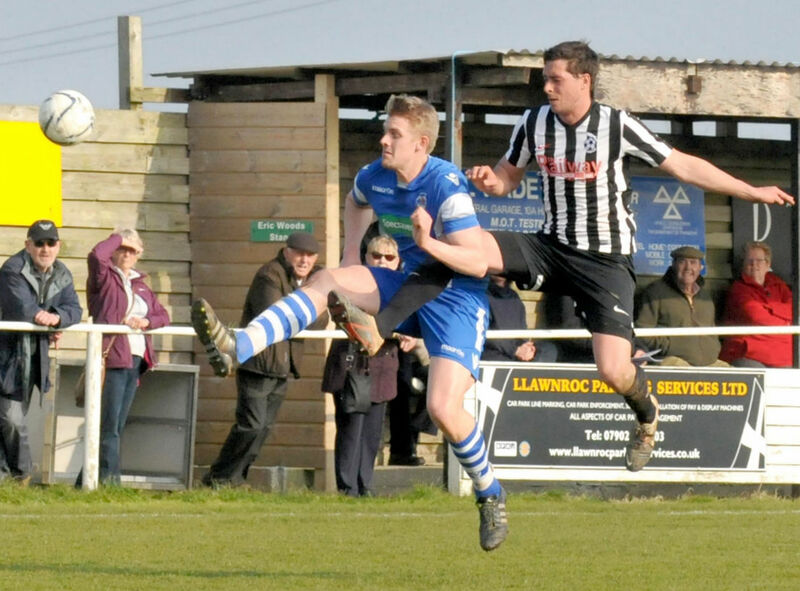 The pitch was heavy so this wasn’t going to be a game of good passing and movement, but both teams were up for this derby match! 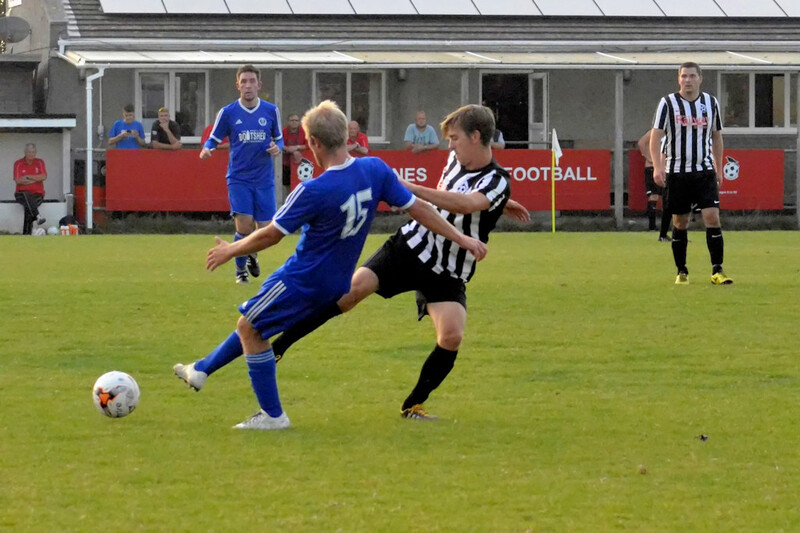 The game started well with both teams getting about equal amounts of possession, but the breakthrough came when Trevor Wisker scored for the home side on 26mins and 11 mins later he found the net again to end the half 2-0 to St Agnes Bolsters. 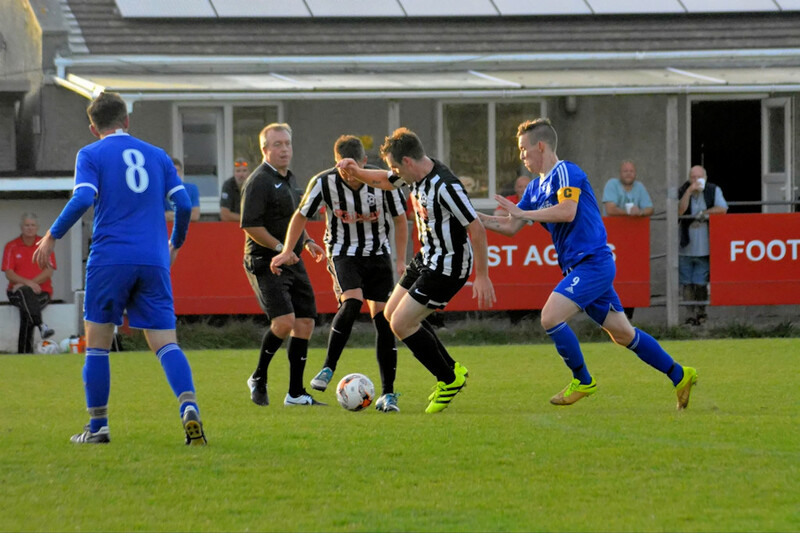 The second half started with Aggie Bolsters pretty much in control when Mark Northgate scored to make it 3-0. Just on the half hour mark of the second half Aggie Bolsters were awarded a penalty when Chris Wells was taken down in the box and up stepped Trevor Wisker to make it 4-0 with a hat trick! 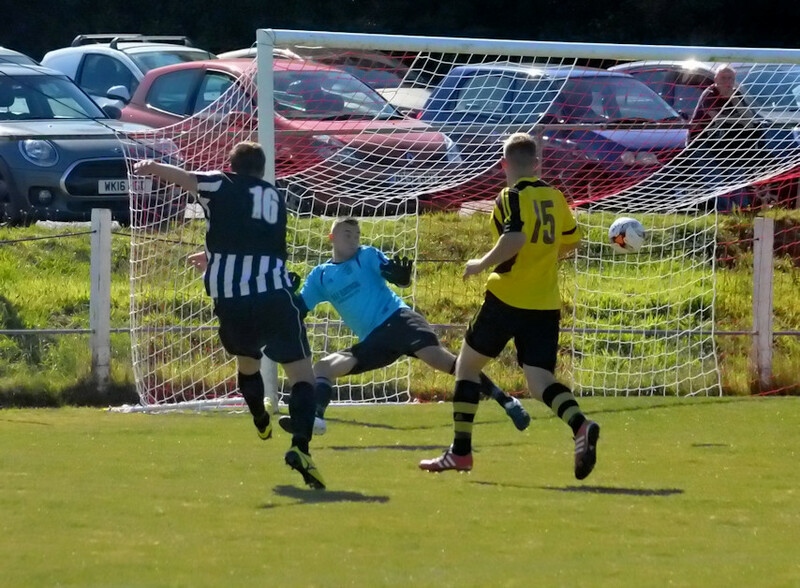 All credit to Threemilestone for not giving up and after soaking up an Aggie Bolster attack they broke away and Martin Thurlow got them consolation goal by lobbing the keeper. Final score Aggie Bolster Vets 4-1 Threemilestone. 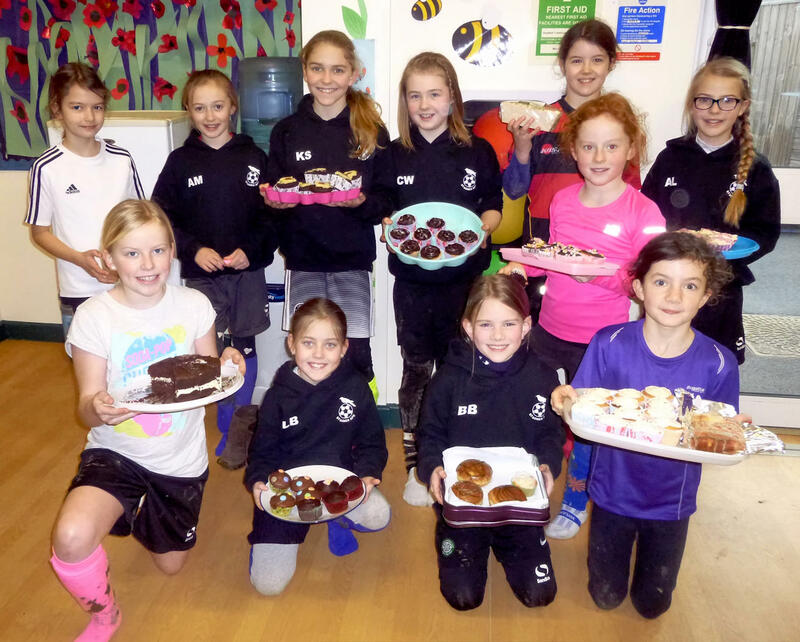 The St Agnes AFC Dynamos Girls Under 10's and 12's held a very busy Coffee and Cakes Morning on Saturday during their weekly training session at Blackwater School. With homemade cakes, and a raffle the event raised a tremendous total of £240 over the two hours which will be divided between Blackwater School who kindly allow the girls to use their facilities and St Agnes AFC 9-v-9 goals funds. 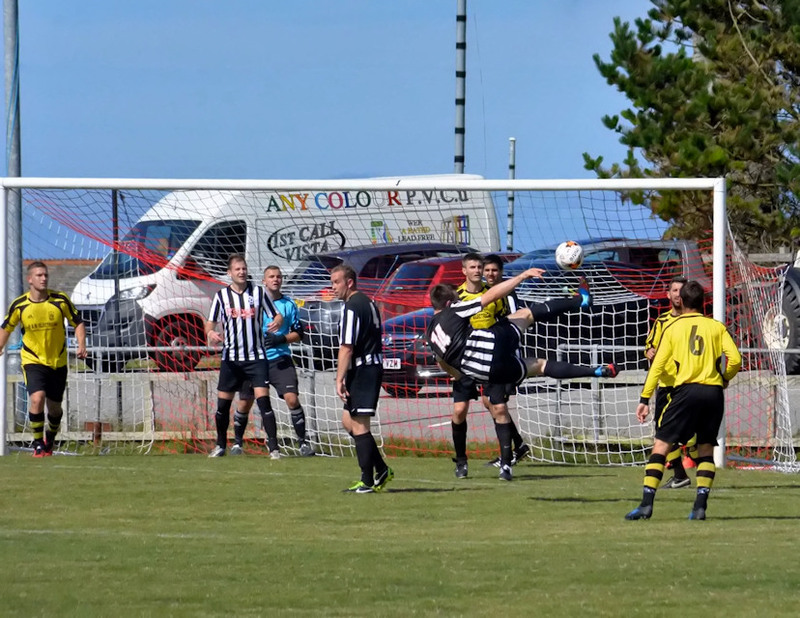 St Agnes AFC previously had a set of plastic 9-v-9 goals, which over the recent stormy weather had perished and have been replaced by the club with more substantial robust aluminium ones that are better equipped for the Cornish climate! Club Chair Mandy Kimmins said "Thank you to everyone who supported the girls event this morning it was great fun and the girls worked really hard to help make it a success. 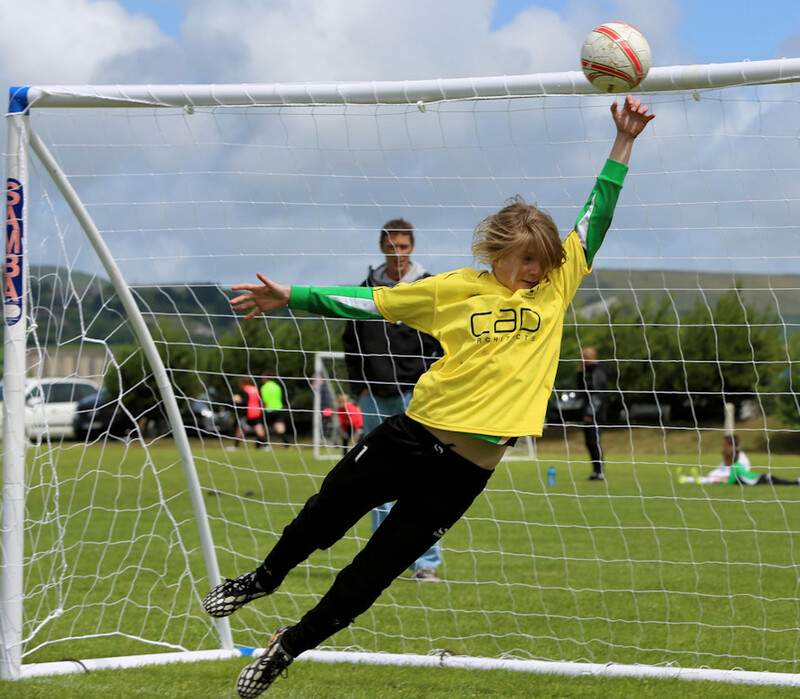 We are really grateful to Blackwater School for their support and use of their facilities and, having spent over £600 on our new 9-v-9 size goals, the fundraising is fantastic." 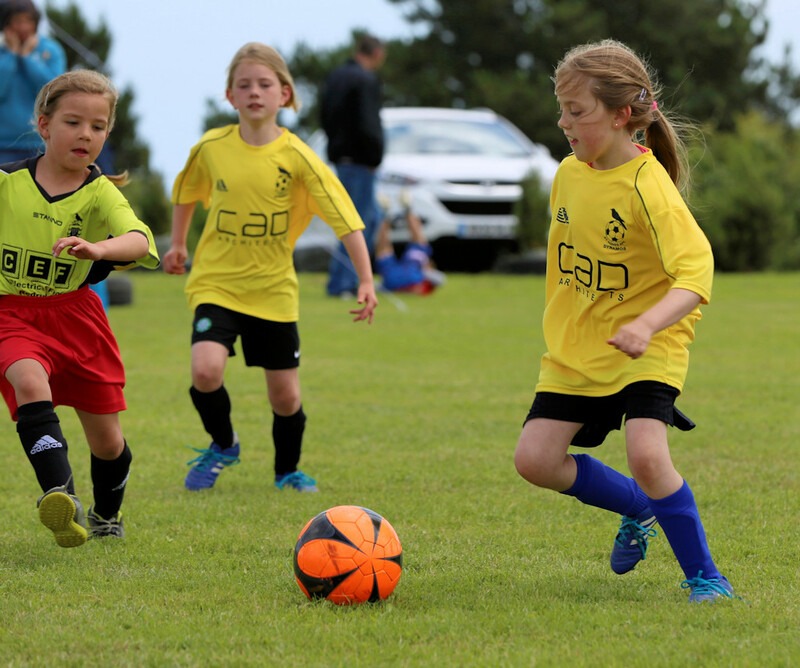 The St Agnes AFC Dynamos who are newly formed this season presently host Under 10's and 12's Girls, but are looking to expand to include Under 8's and 14's. Any interested girls across any of these age groups (8's, 10's, 12's & 14's) are welcome to get in touch with coach Charlotte Collier or Manager Mandy Kimmins 07974 370666. 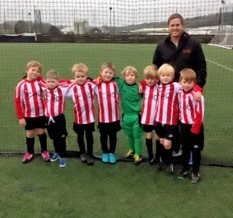 St Agnes AFC Under 7's attended the Kernow Youth Football League Festival on Saturday 30th January playing some exciting 5 aside football on the 3G Astro Pitch at Penryn. 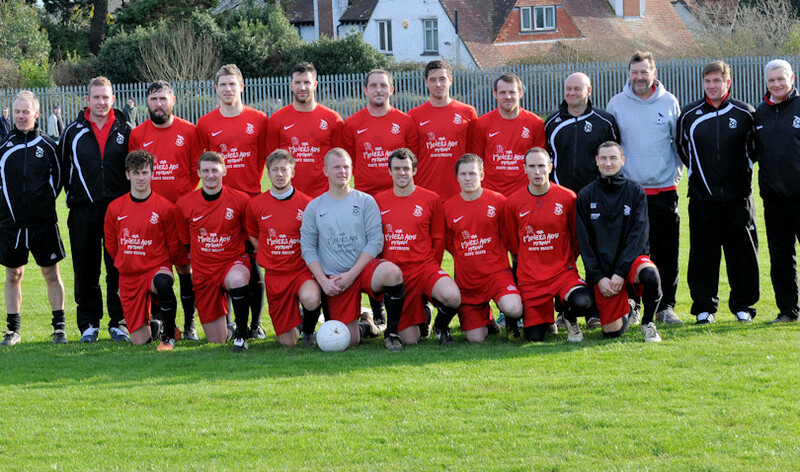 They are photographed in their new playing kit kindly sponsored by Jeremy Bradley of CAD Architects. 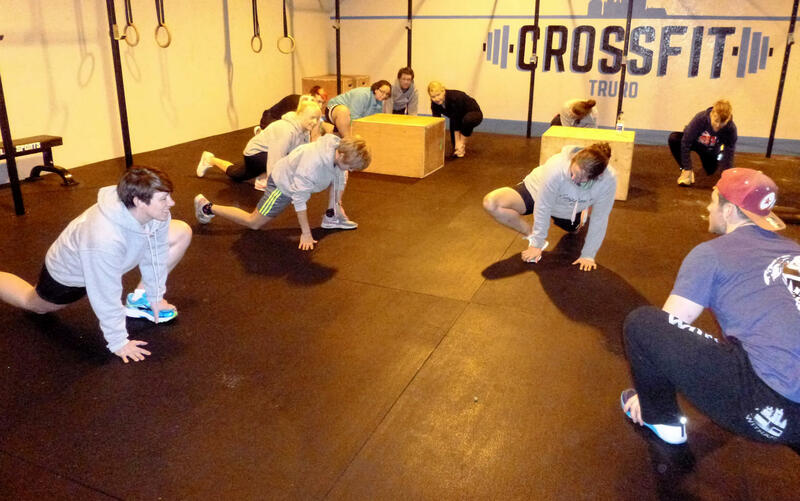 12 members of the St Agnes AFC Ladies squad revelled in the opportunity of trying out a new approach to fitness at CrossFit Truro. 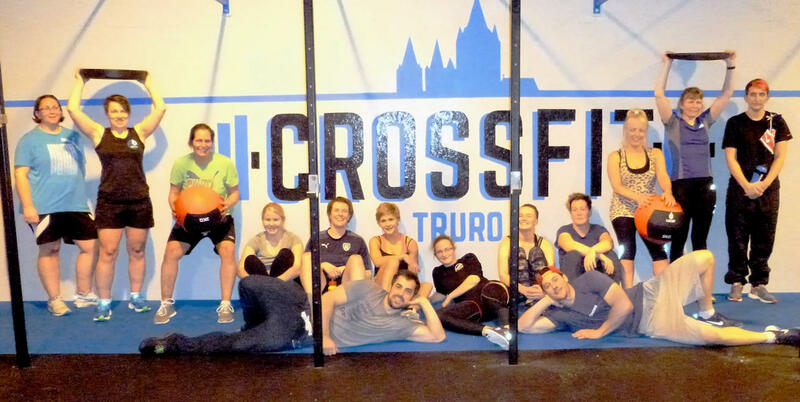 CrossFit Truro is conveniently located at Threemilestone and the ladies were quickly engaged in stretching and squatting techniques with trainers Ben Willoughby and Owen Lewis. There then followed an hour of circuits including squat ball throws, box raises and plate lifts motivationally delivered by Ben and Owen ensuring everyone had an enjoyable positive experience. 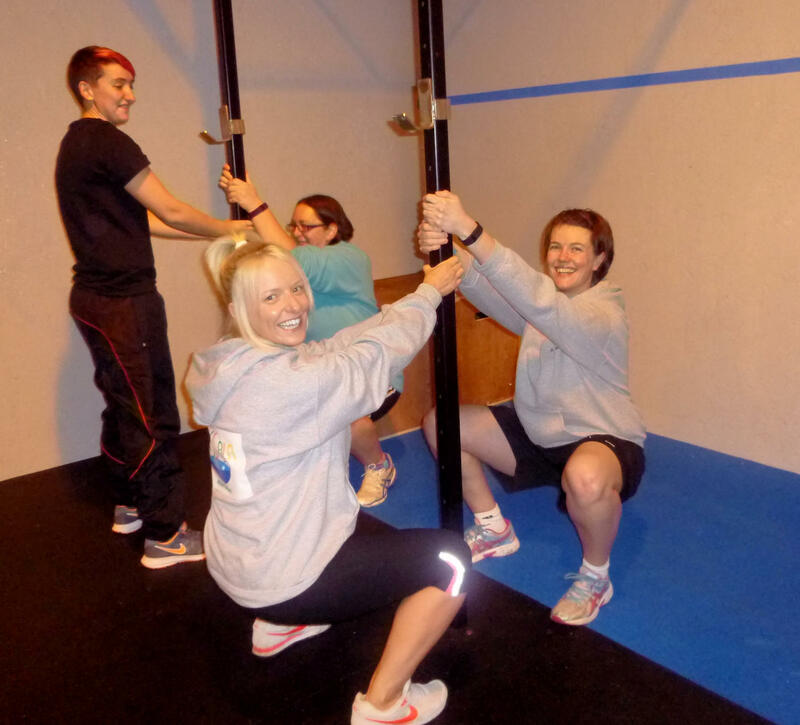 At the end team manager Mandy Kimmins thanked Ben & Owen for the taster session and said" CrossFit promises to help us get leaner and stronger, feel more positive and energetic and improve performance at our chosen sports. Get Fit for life! 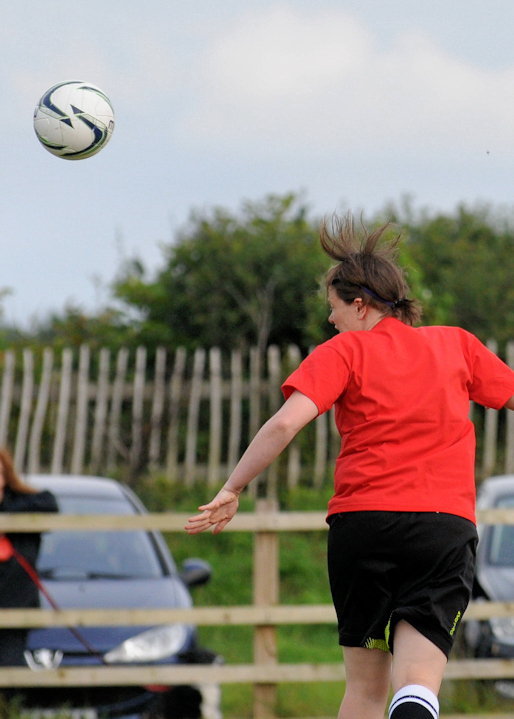 I look forward to seeing improvement out on the pitch during our next lady’s fixture on Sunday!" 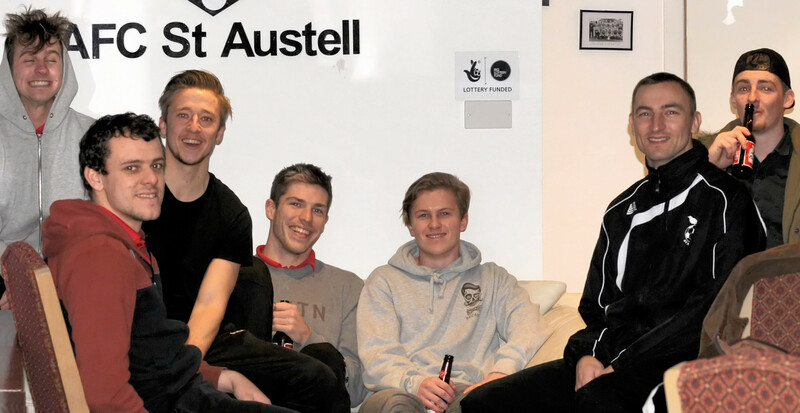 Player Laura Hockett commented "Great session with these boys from Crossfit Truro! Thank you on behalf of all of us at St Agnes Ladies for having us! I'm gonna ache in the morning!" 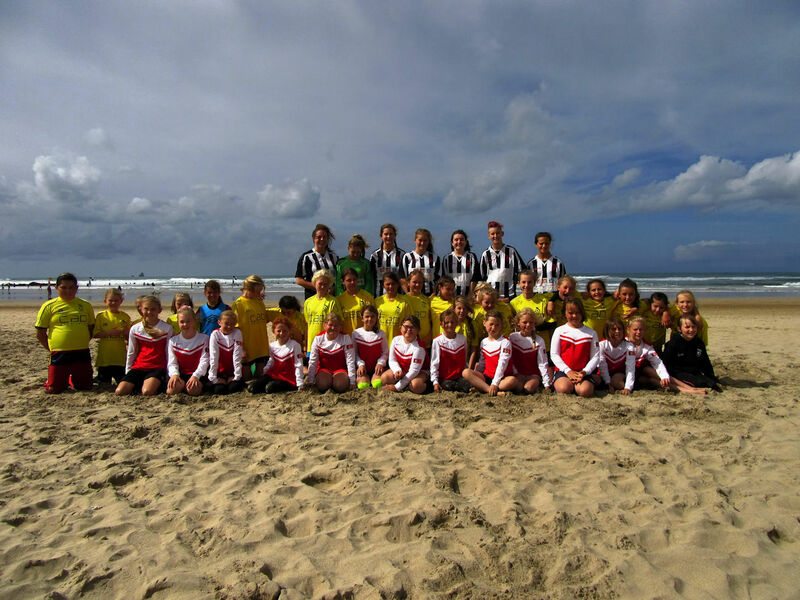 St Agnes AFC Dynamos Under 10's and 12's Girls had a very exciting morning playing Futsal at the Cornwall Girls Football League event in Newquay on Saturday. 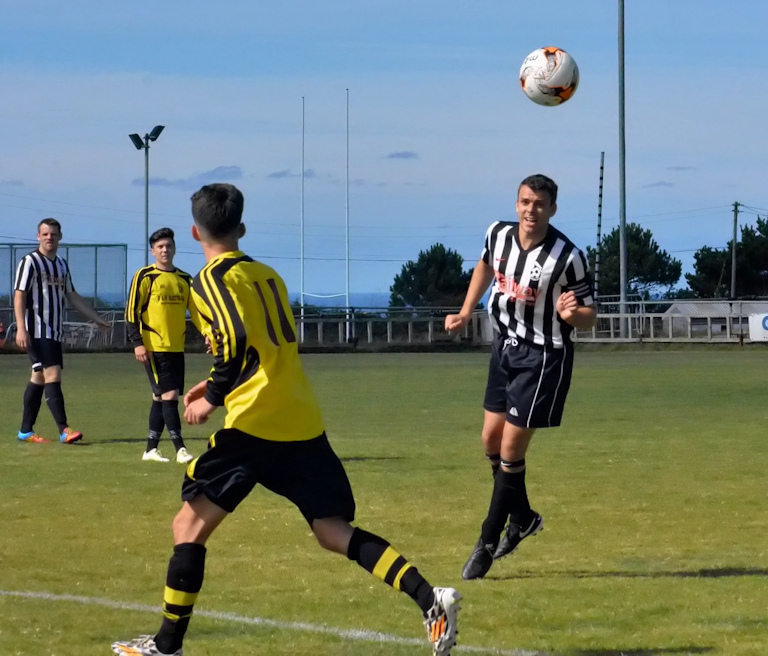 The event forms part of their fixture programme for the 2015/16 Season and involves playing 5-a-side Futsal inside the Sports Dome at Treviglas School. 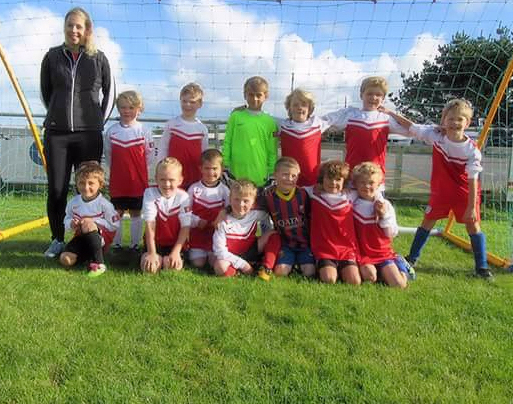 The St Agnes AFC Dynamos who are newly formed this season presently host Under 10's and 12's Girls, but are looking to expand to include Under 8's and 14's. Any interested girls across any of these age groups (8's, 10's, 12's & 14's) are welcome to get in touch with coach Charlotte Collier or Manager Mandy Kimmins 07974 370666. Anyone interested in joining the coaching crew is also encouraged to get in touch. 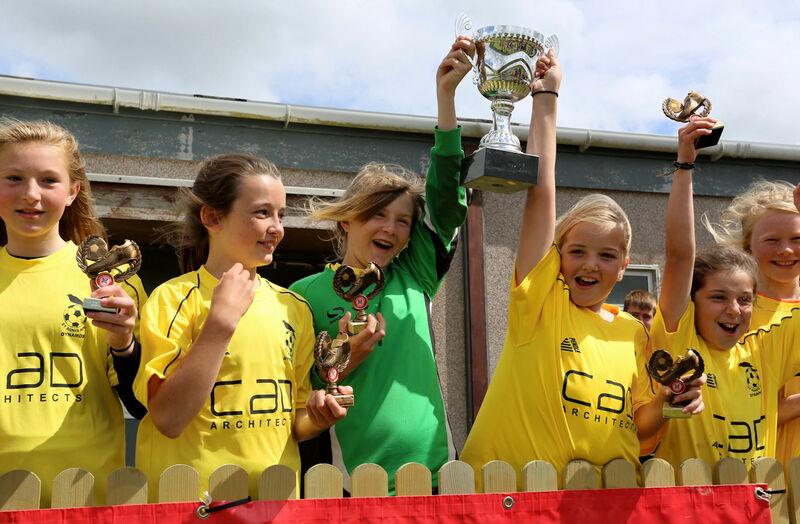 The girls are hosting a Coffee & Cakes morning on Saturday 30th at Blackwater School from 9.30am - 11.30am raising funds for the school who allow them to use their field and St Agnes AFC’s new 9-v-9 goals. They would welcome everyone along! 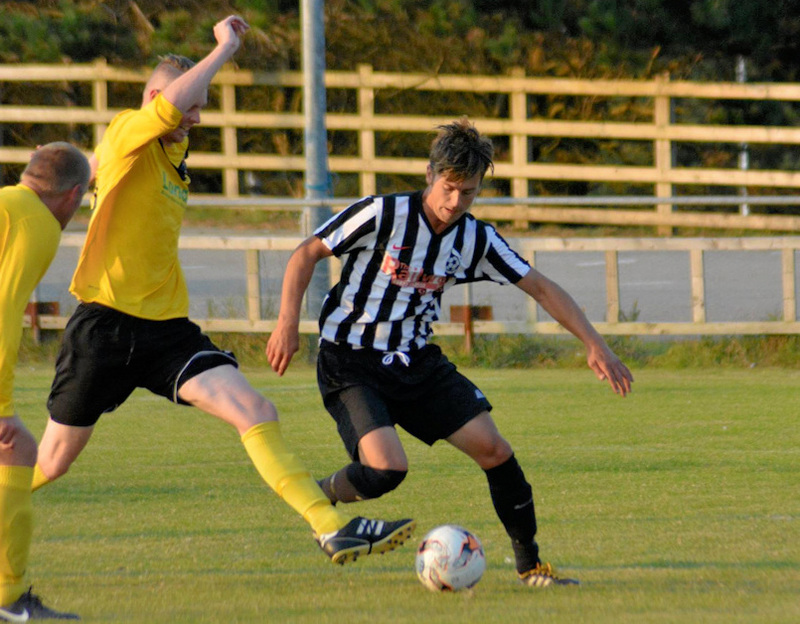 Two contrasting halves saw St Agnes knocked out of the Senior Cup, losing 6-3 at St Austell. 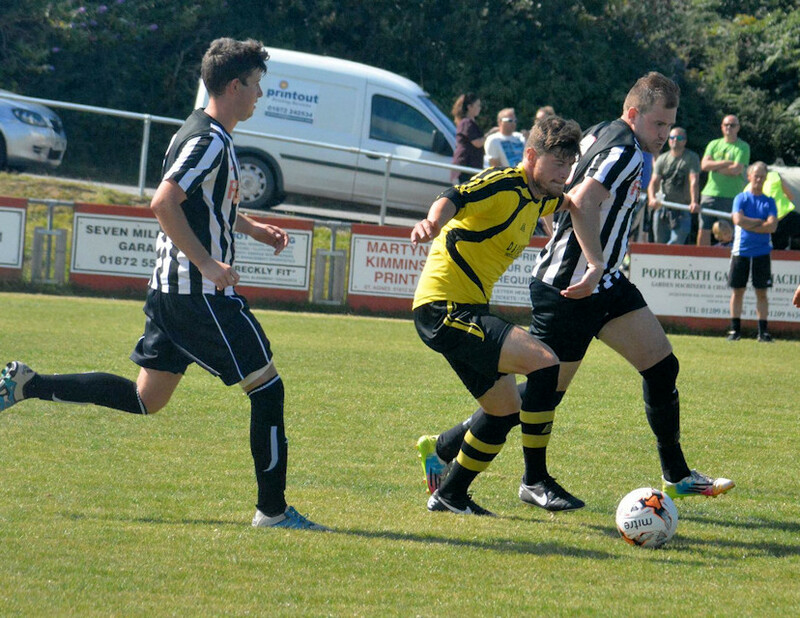 St Agnes failed to get off the bus in the first half, losing 4-0 at half-time. 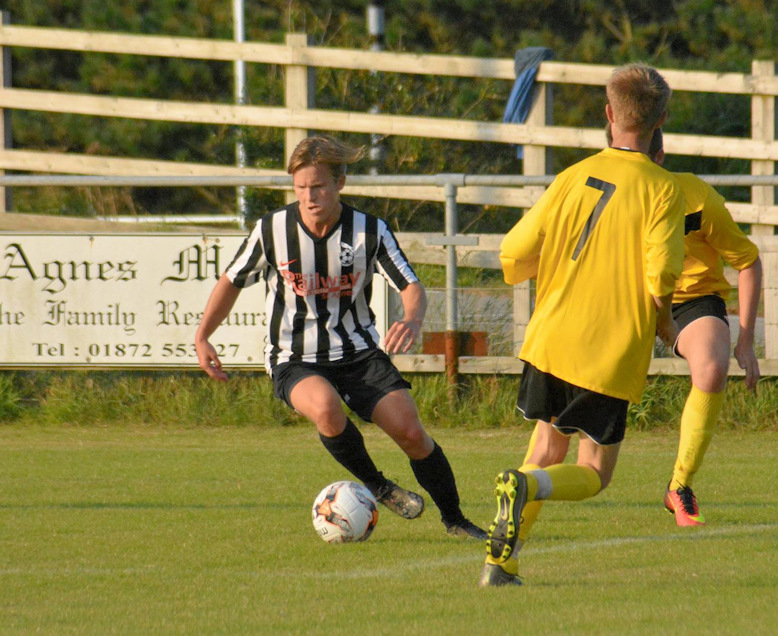 The second half saw a much improved St Agnes take the game to the home team to the extent that they nearly scored more than 3 and were on a par with the team three divisions above them.